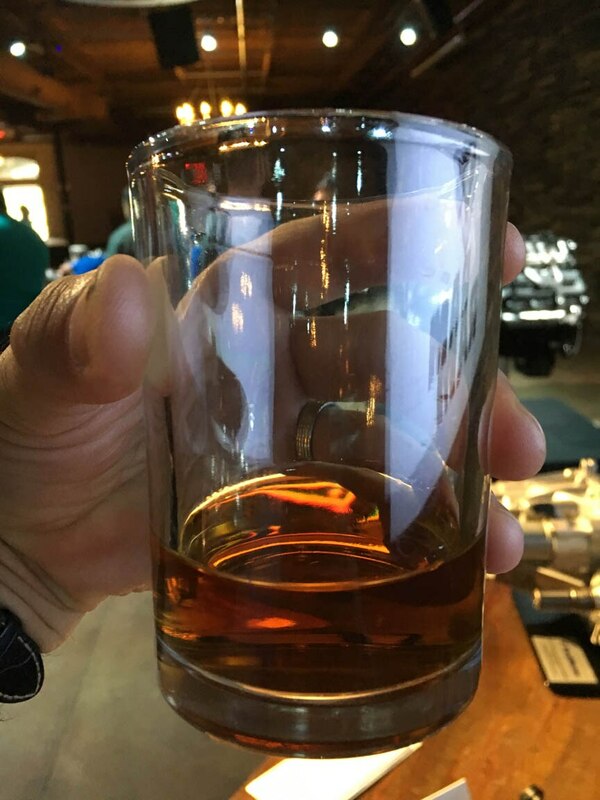 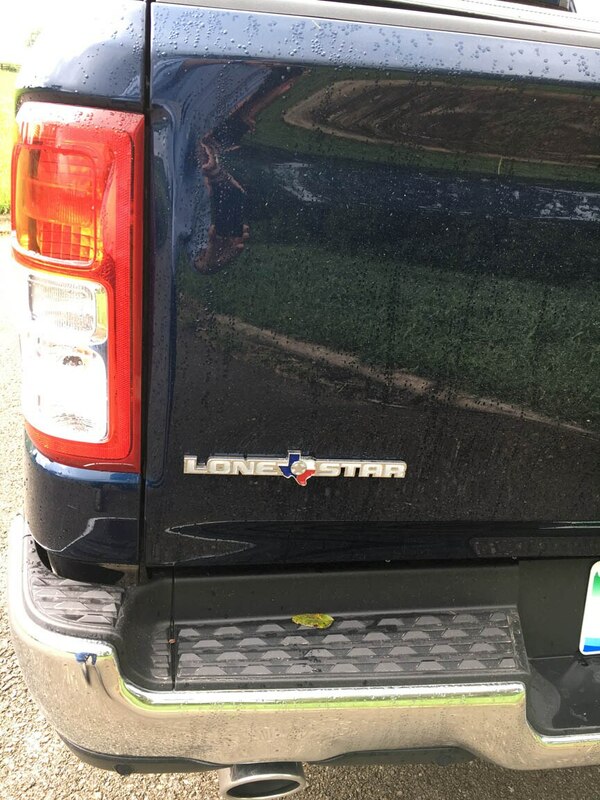 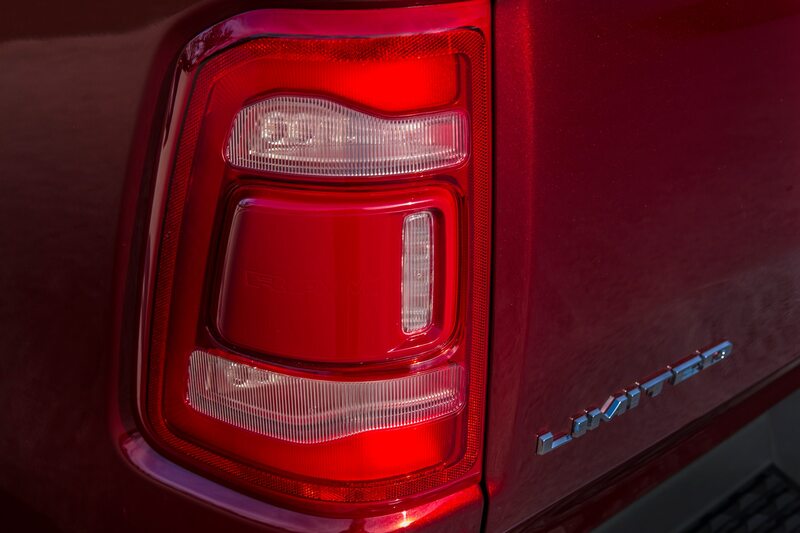 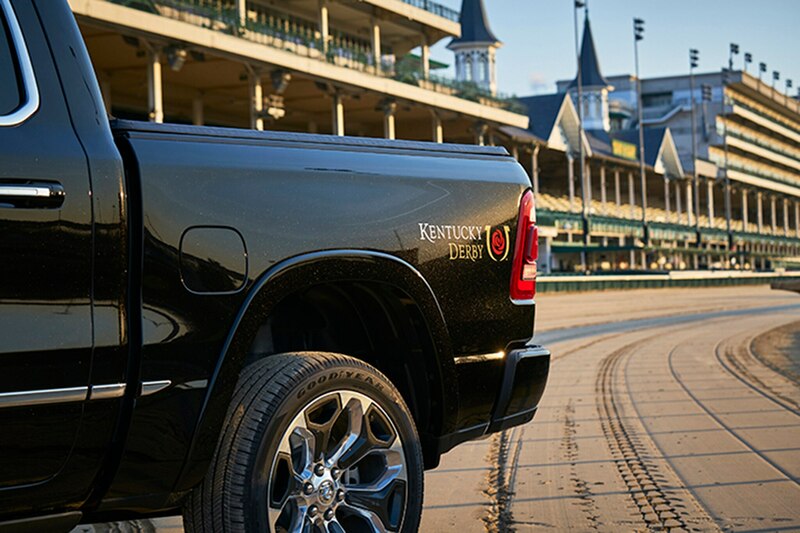 LEXINGTON, Kentucky — How does a major auto manufacturer meet the strict 2025 Corporate Average Fuel Economy standards with their highly profitable full-size pickup trucks … assuming of course that they’re not rescinded? 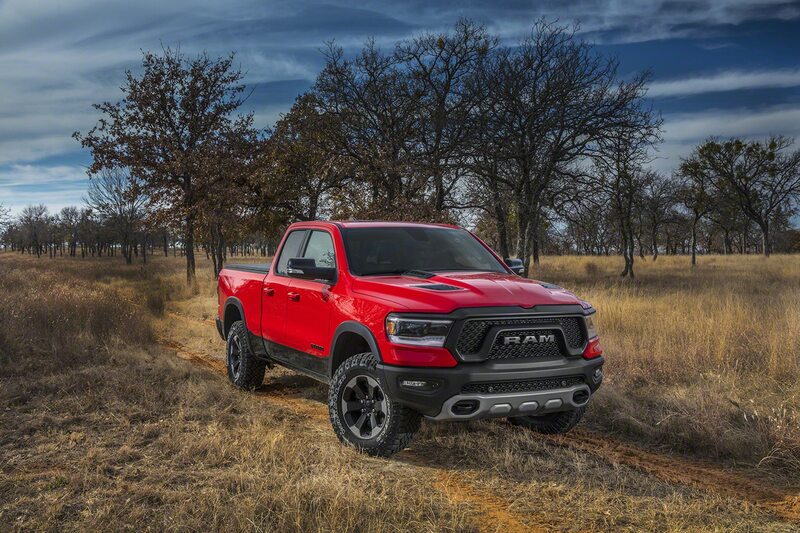 Diesel is the in-pocket answer for the Detroit Three and Nissan, and Ford’s big move a few years ago was a lightweighting that involved a massive shift to aluminum construction, making EcoBoost V-6s a viable alternative. 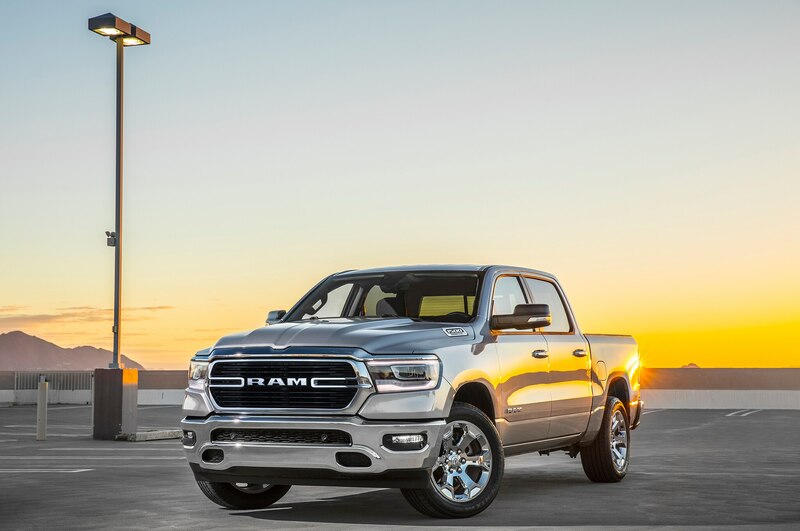 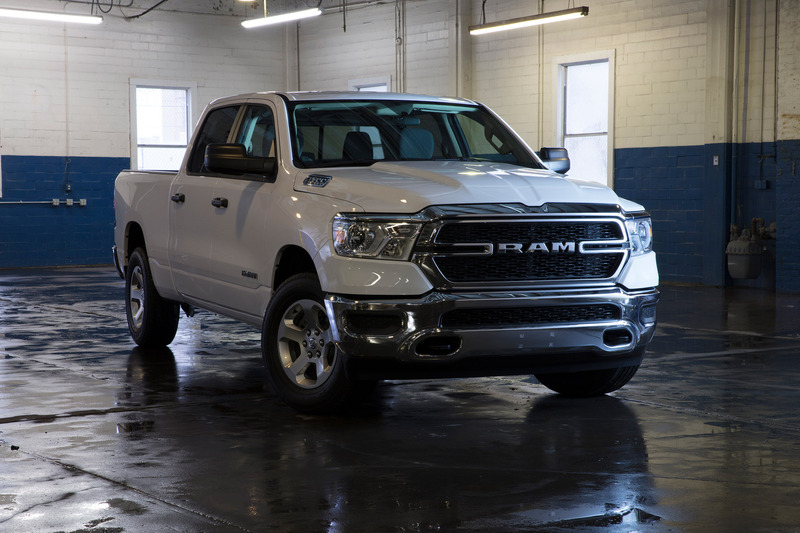 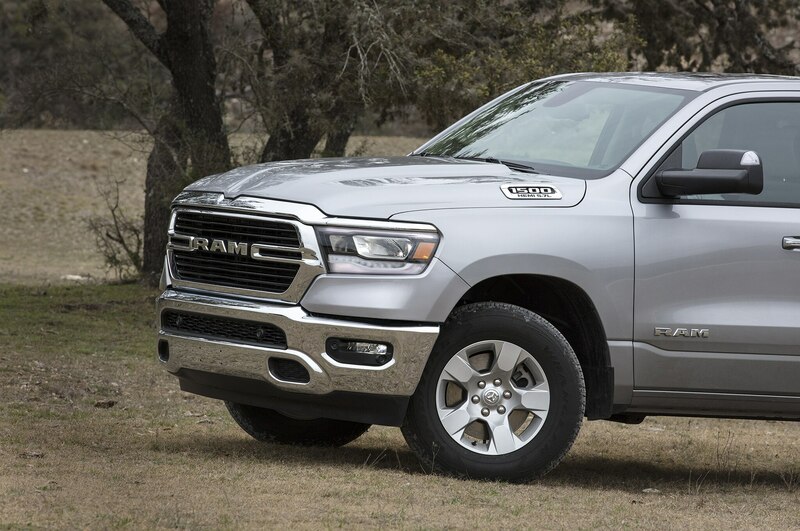 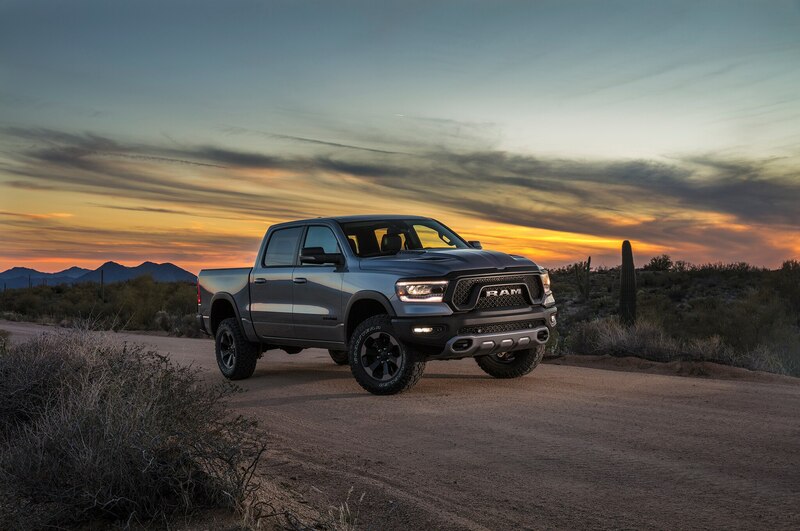 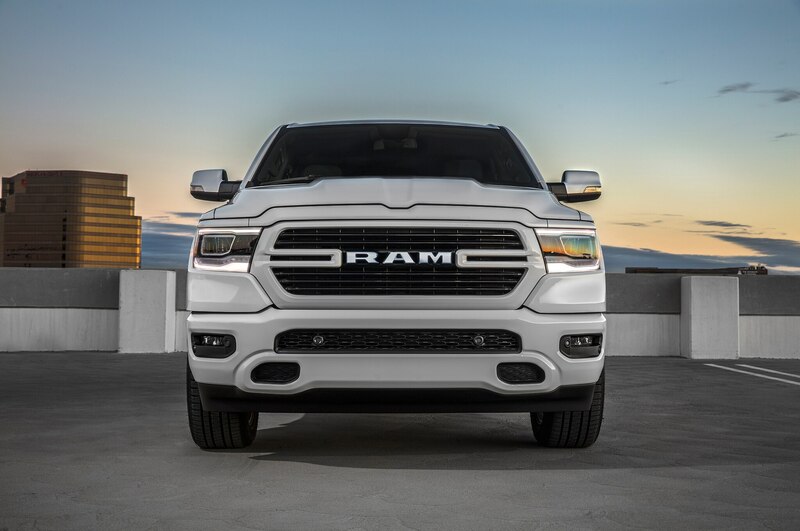 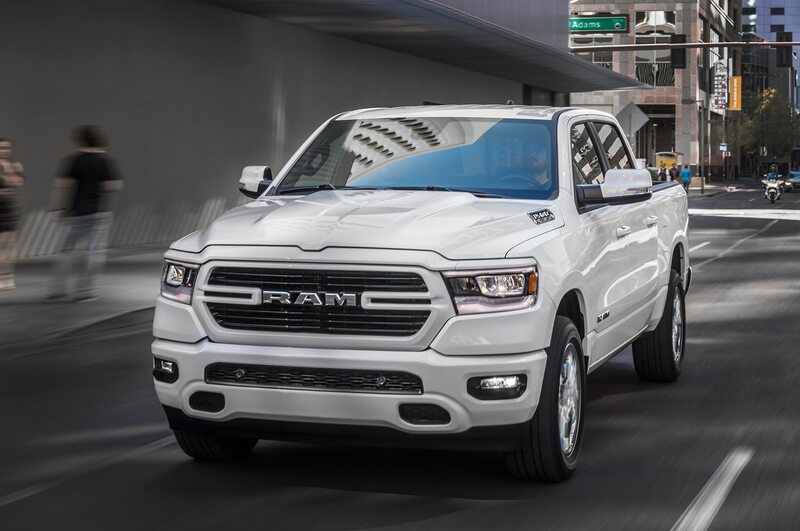 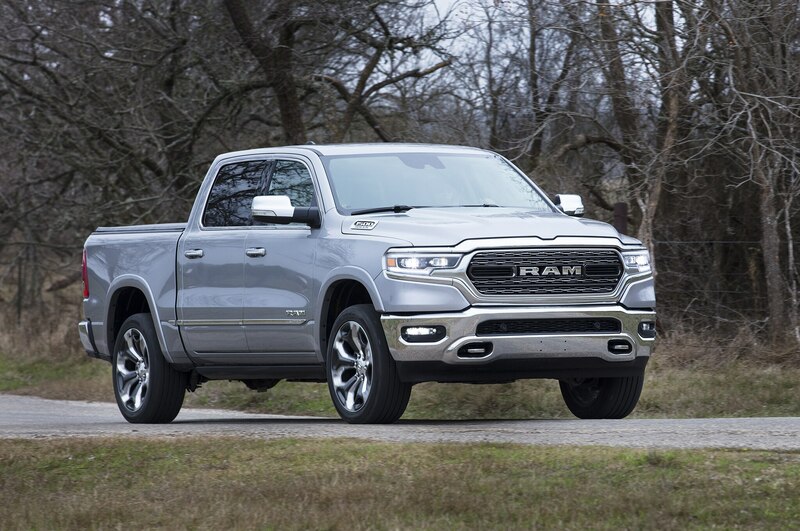 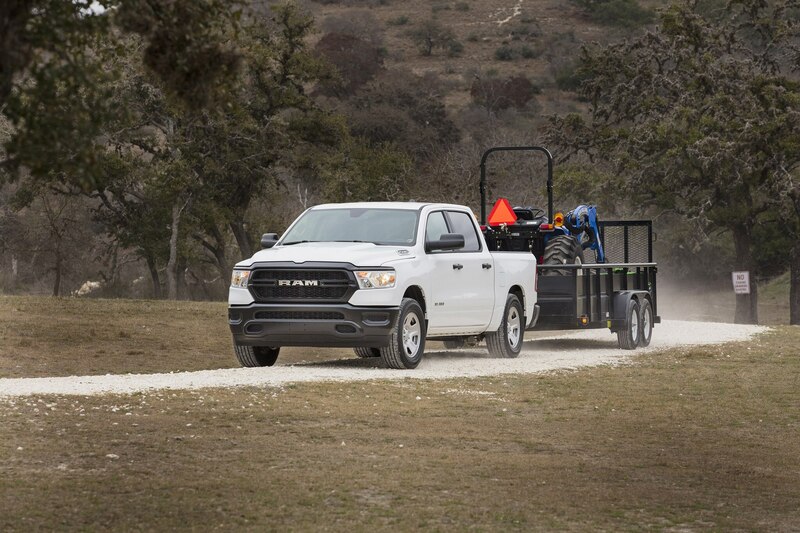 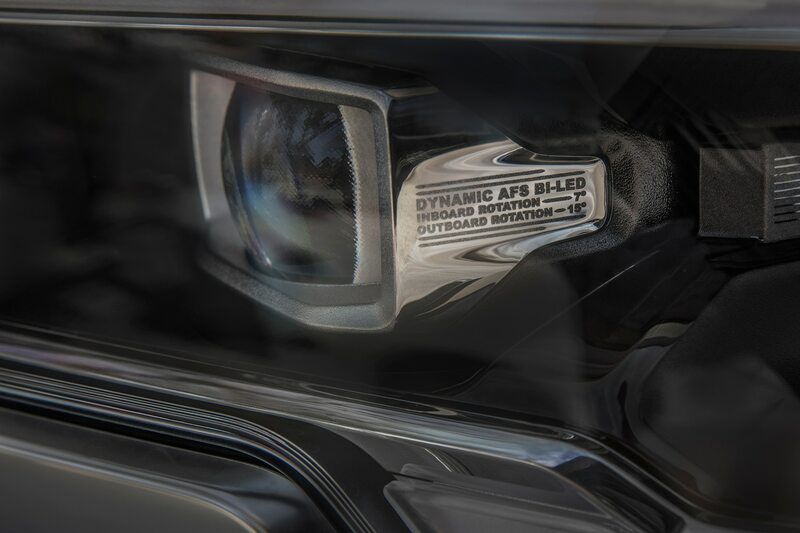 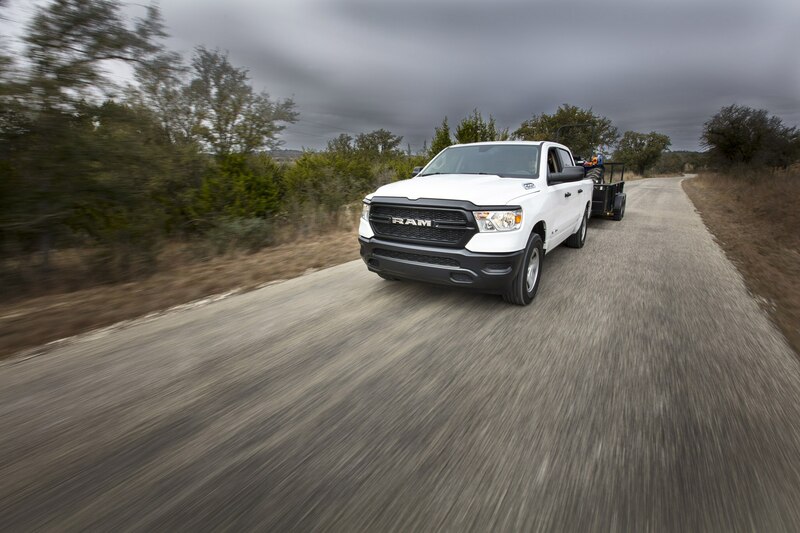 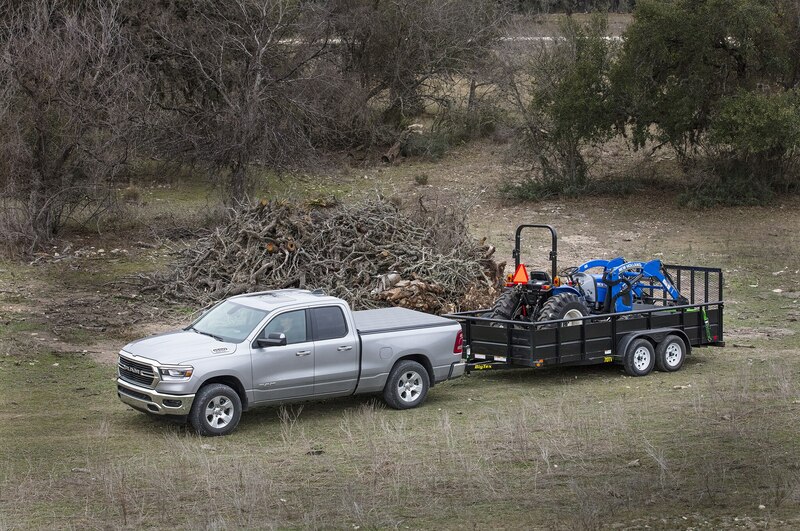 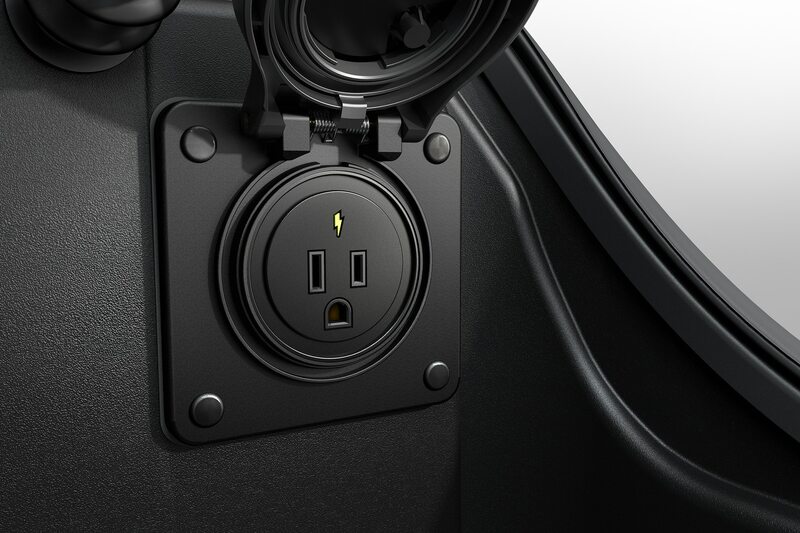 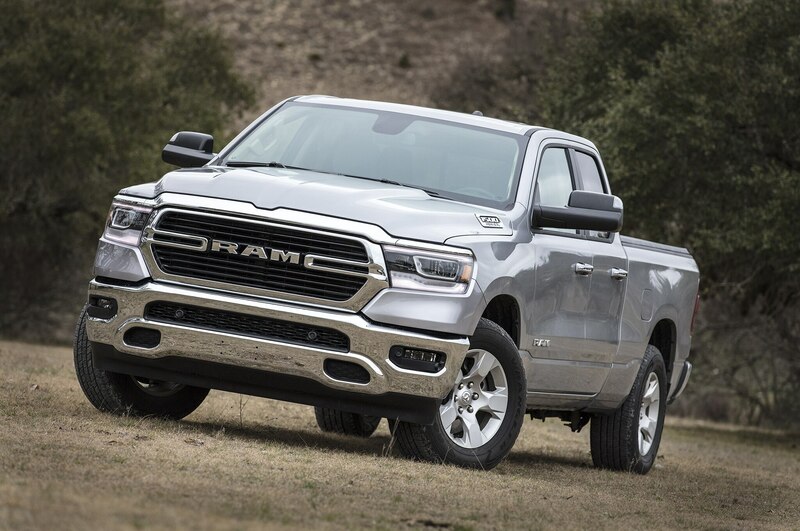 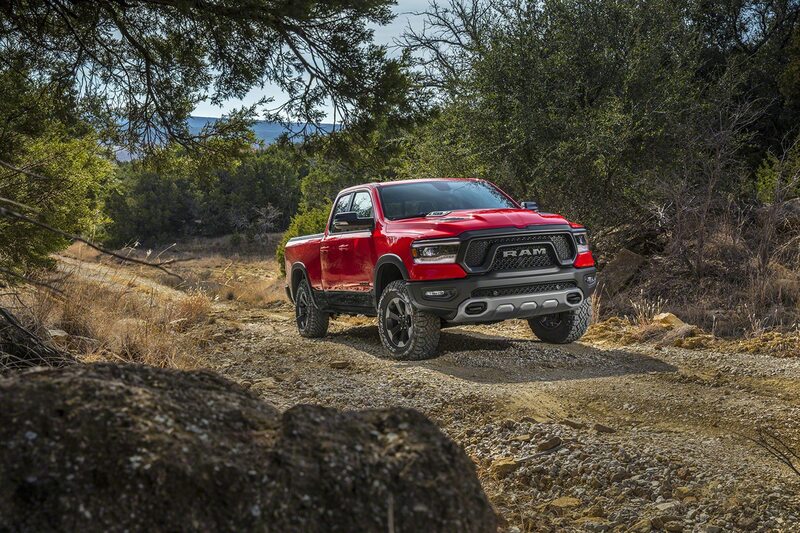 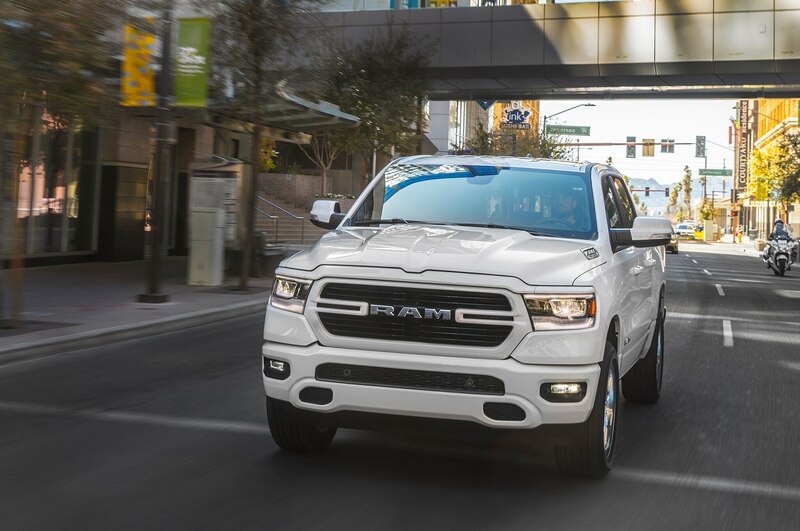 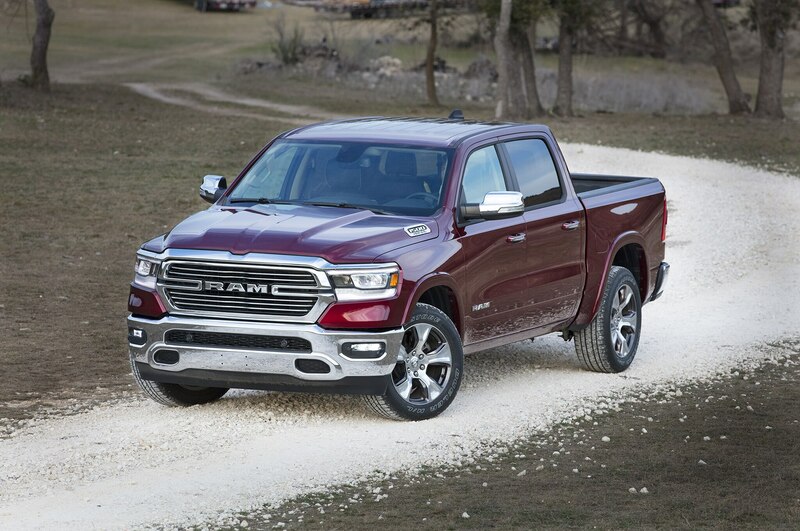 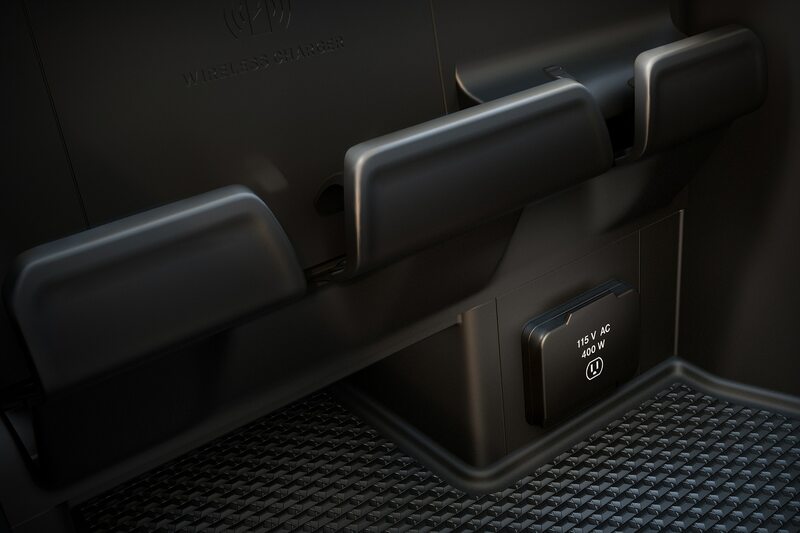 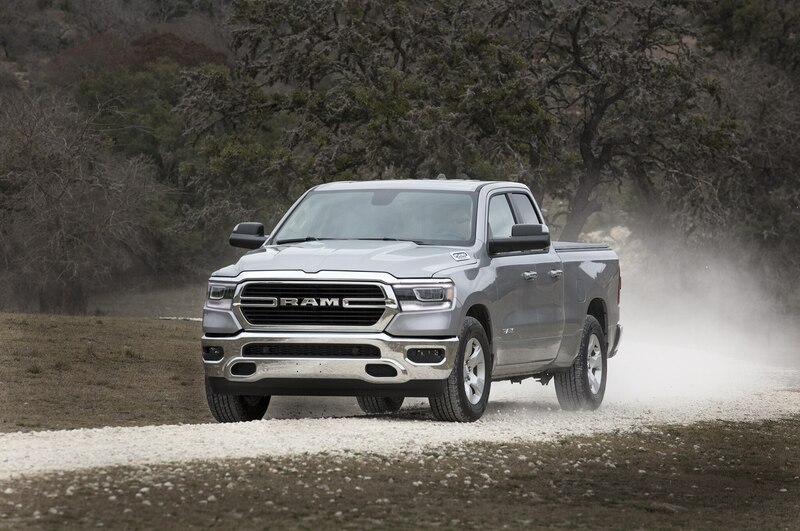 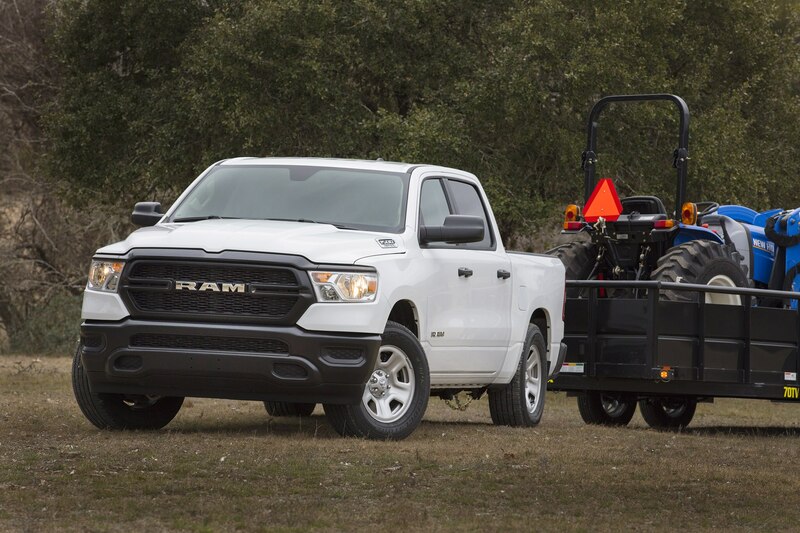 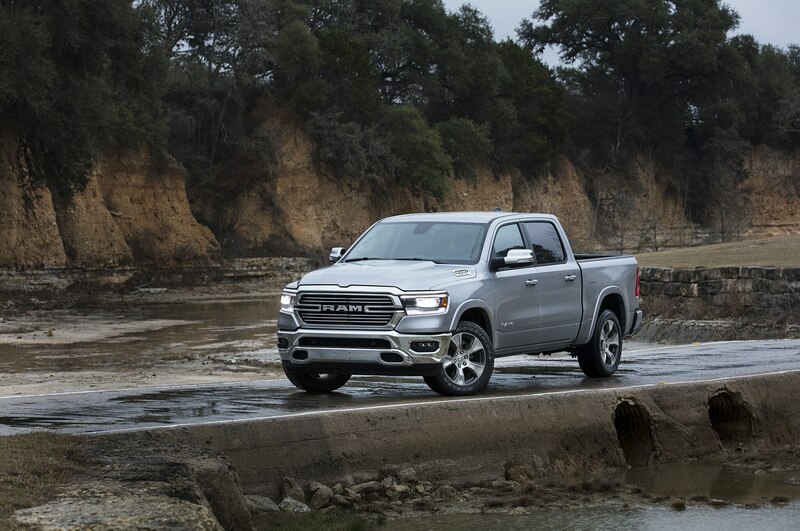 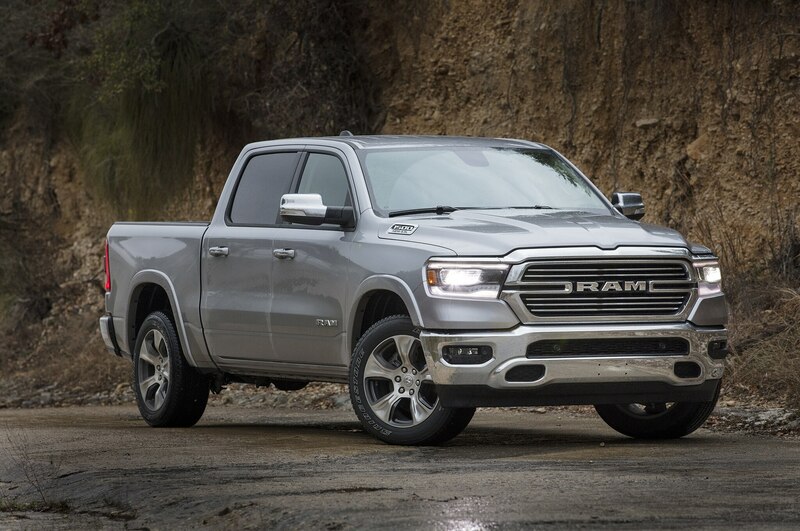 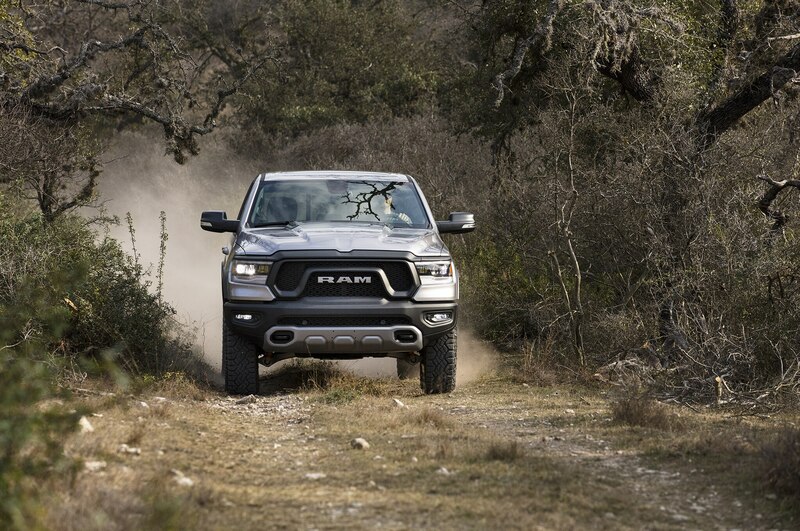 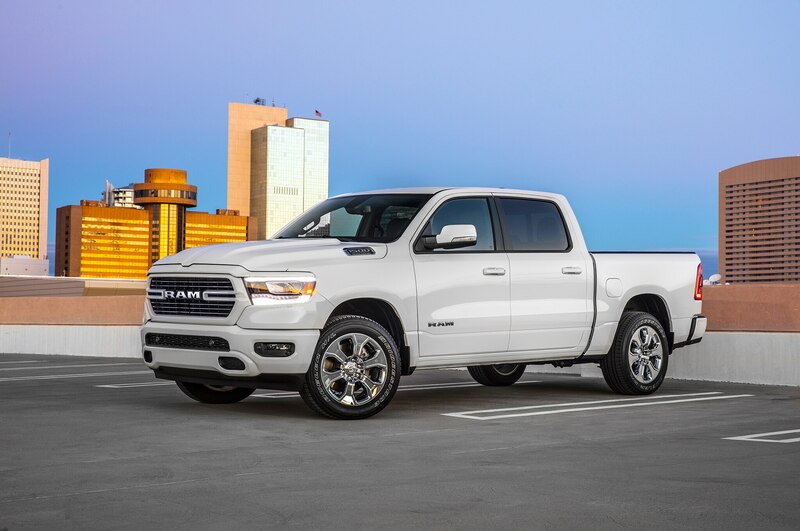 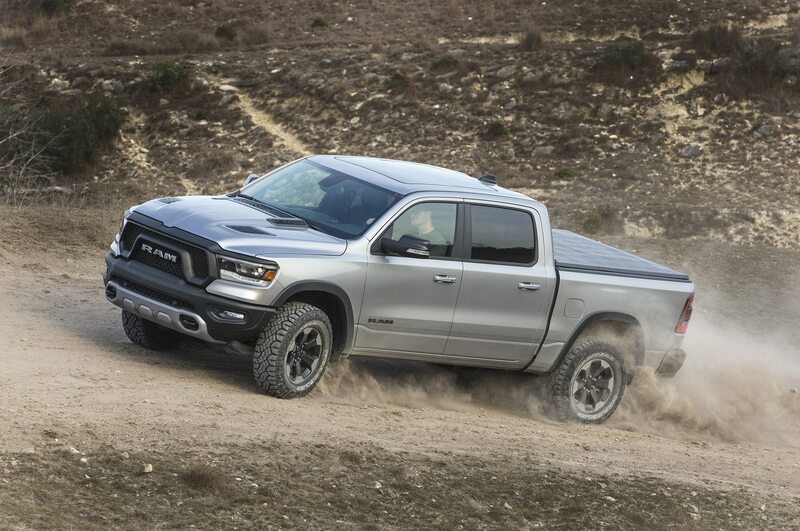 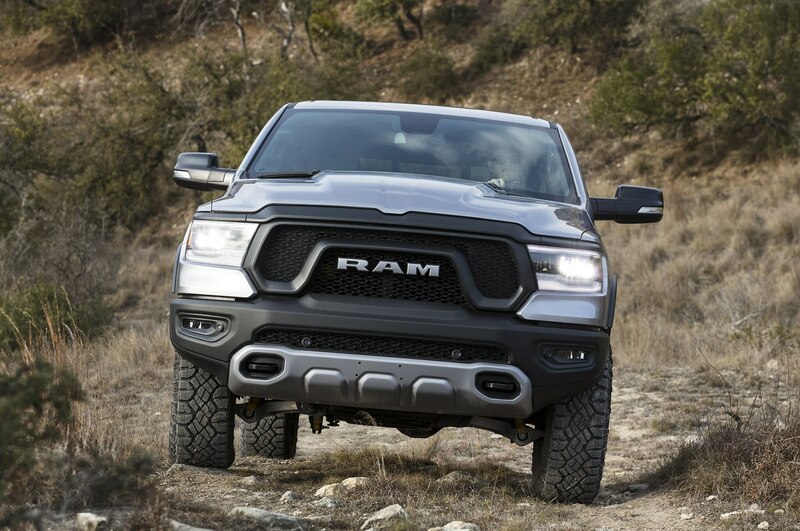 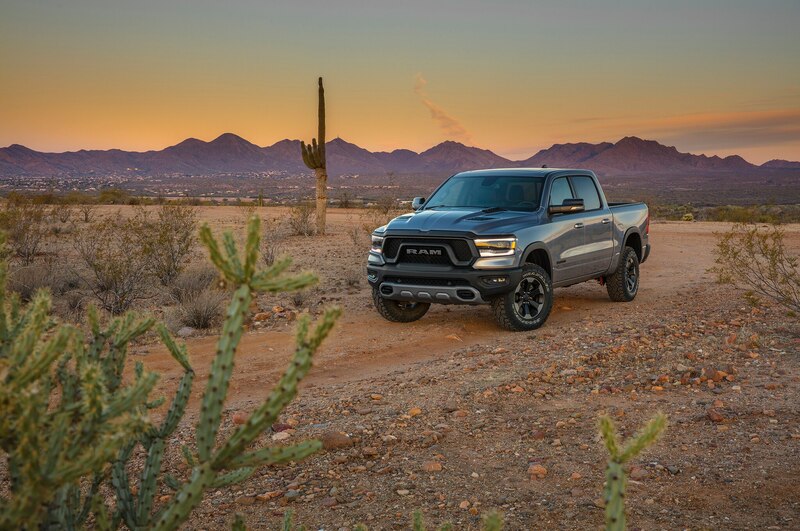 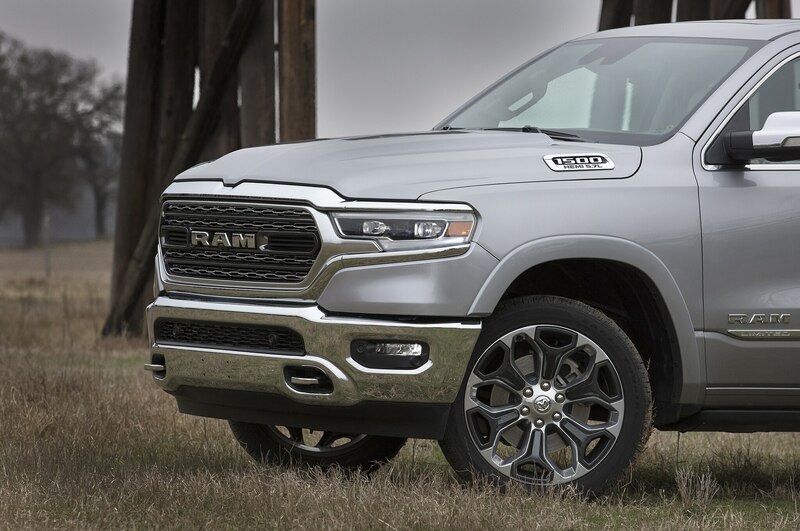 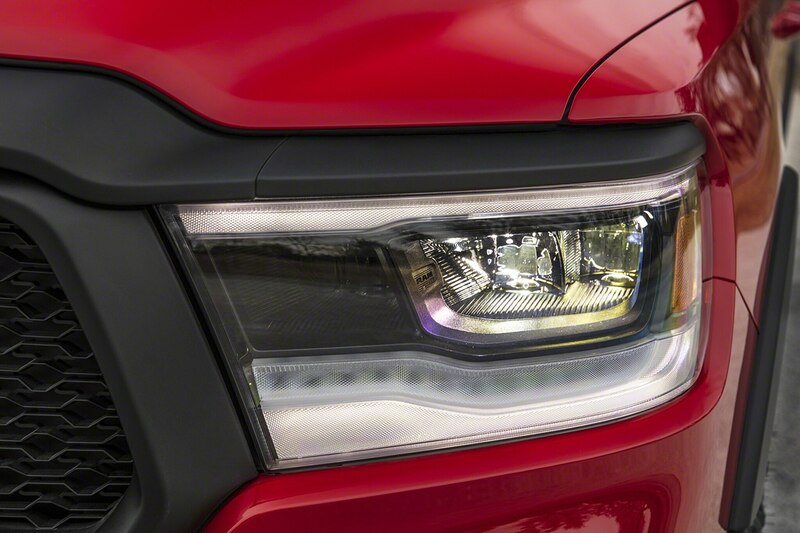 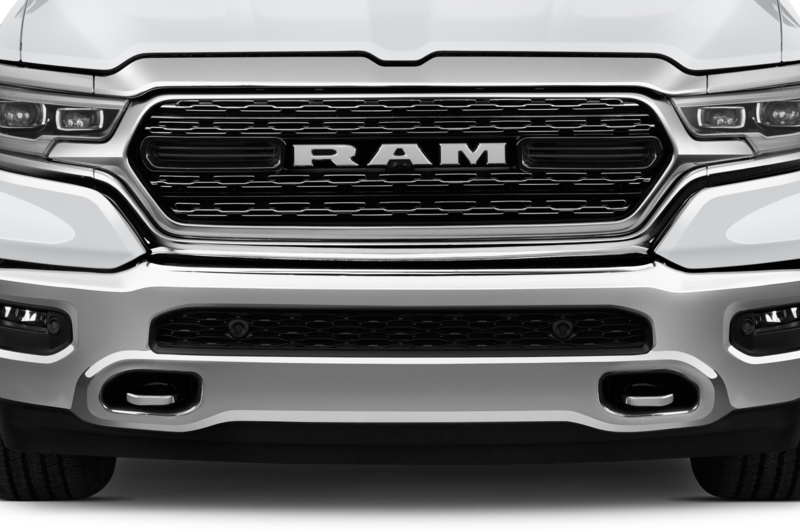 Meanwhile, Fiat Chrysler’s Ram is on to something by becoming the first truckmaker to offer a 48-volt mild hybrid system in its all-new 1500 truck. The system, branded eTorque, is standard with the Pentastar V-6 that becomes available this fall, and is optional with the 5.7-liter Hemi V-8, both versions on-sale now. 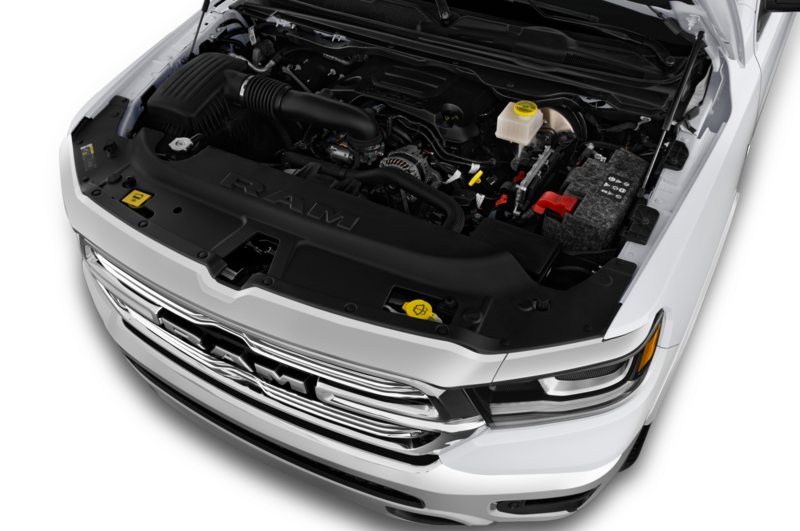 The Pentastar V-6 eTorque uses a Continental-supplied 48-volt system, while the Hemi V-8 uses one from Magneti Marelli, the supplier that investment firm KKR is rumored to be ready to buy from Fiat Chrysler. 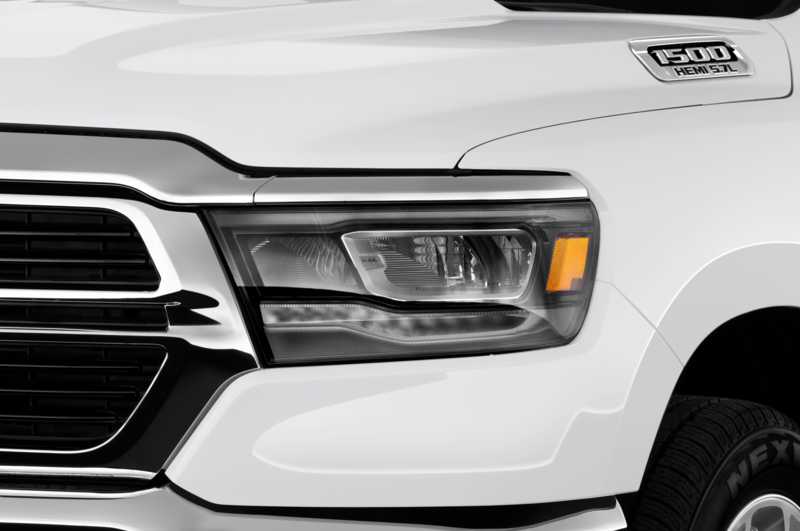 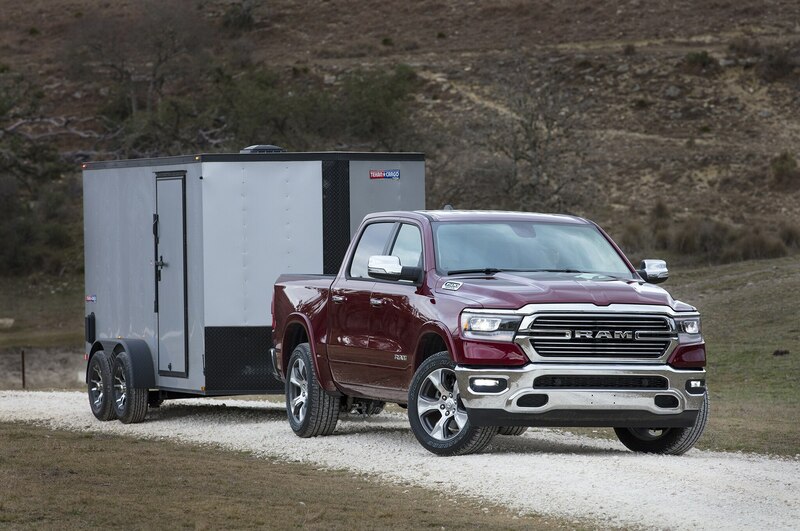 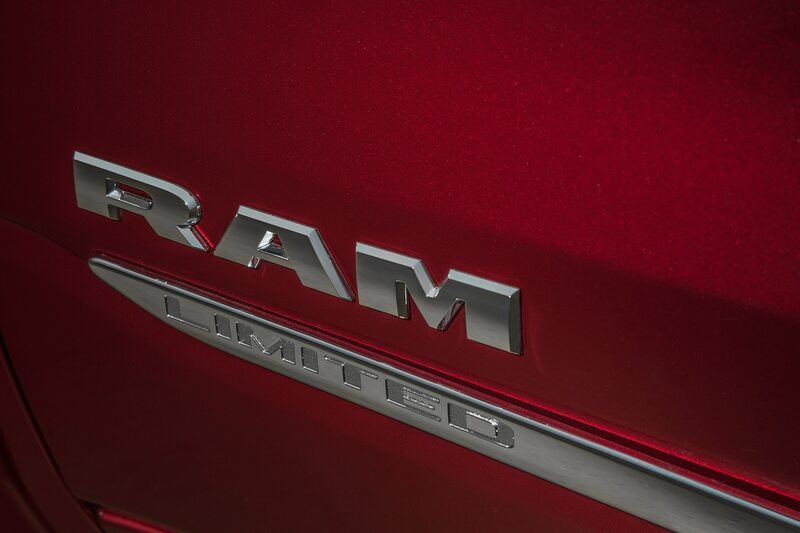 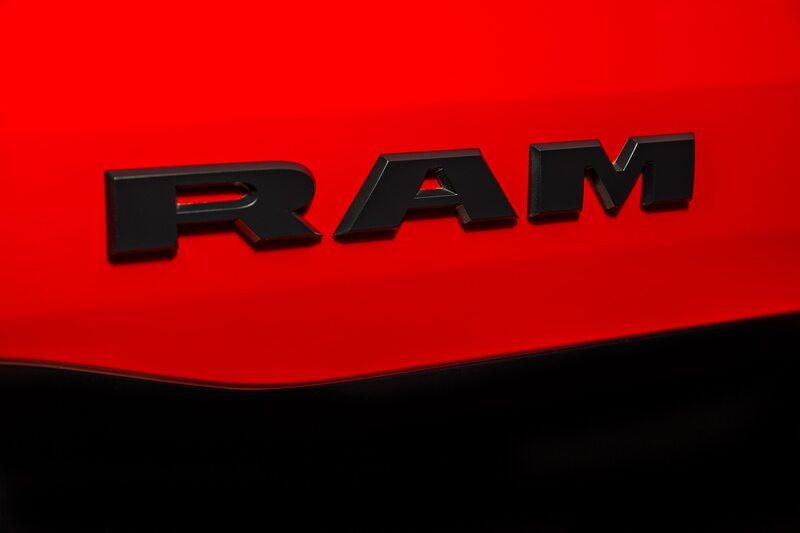 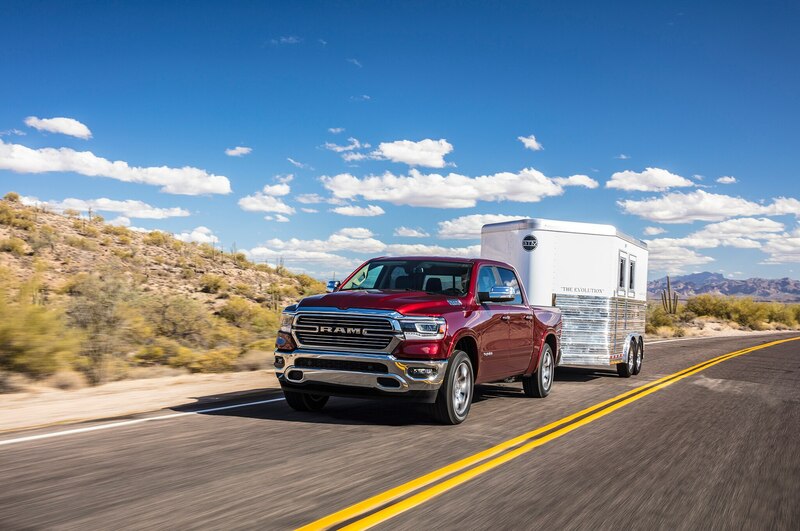 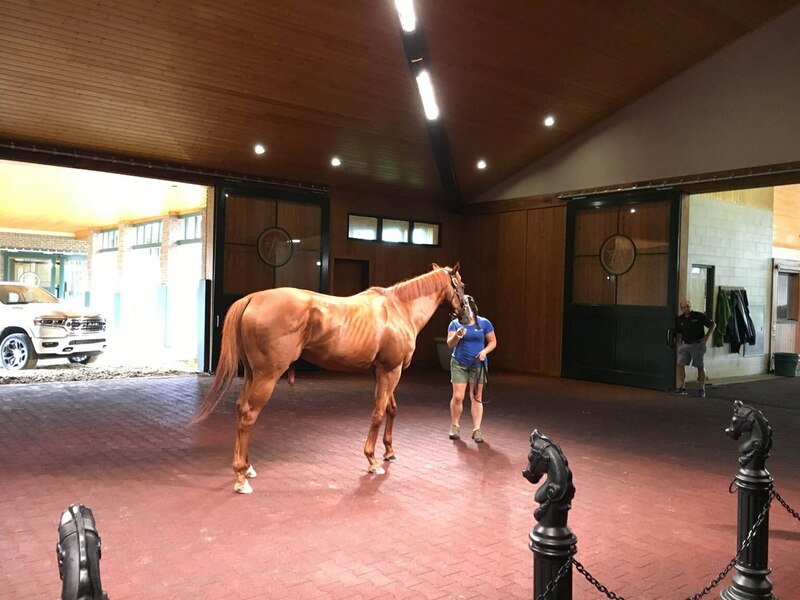 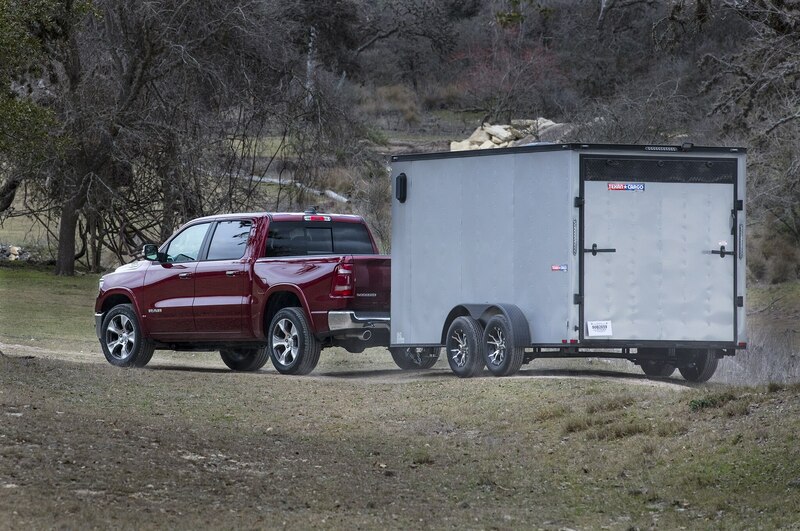 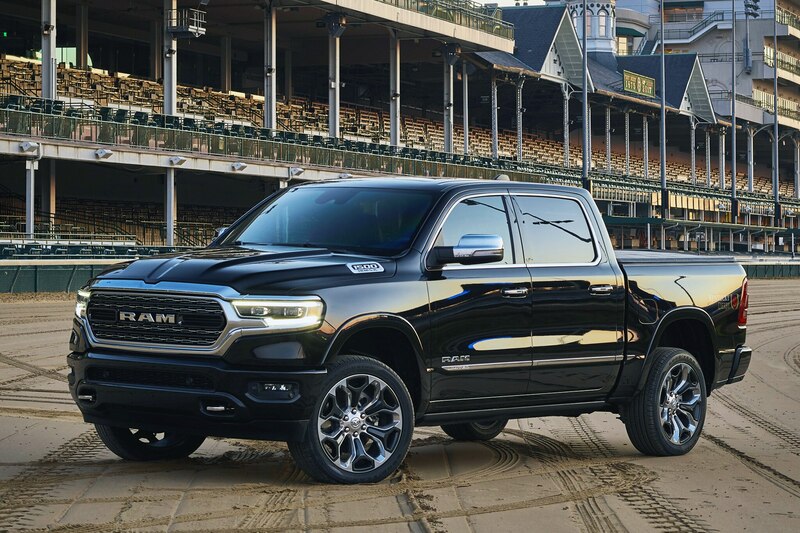 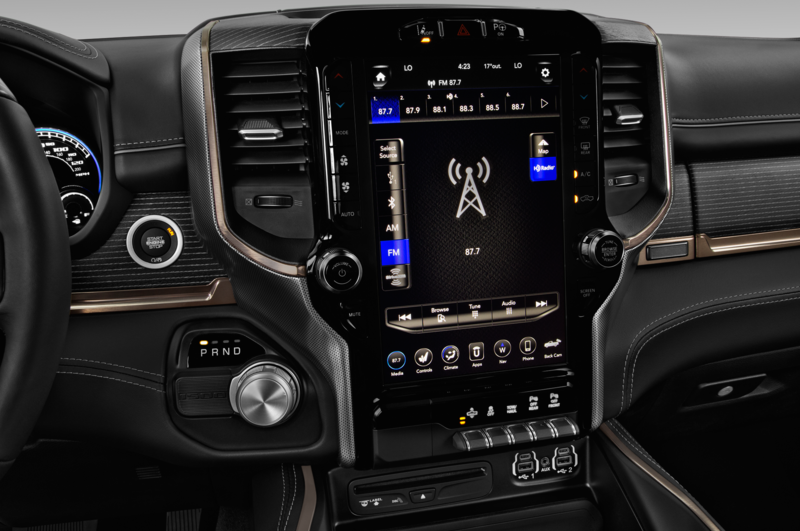 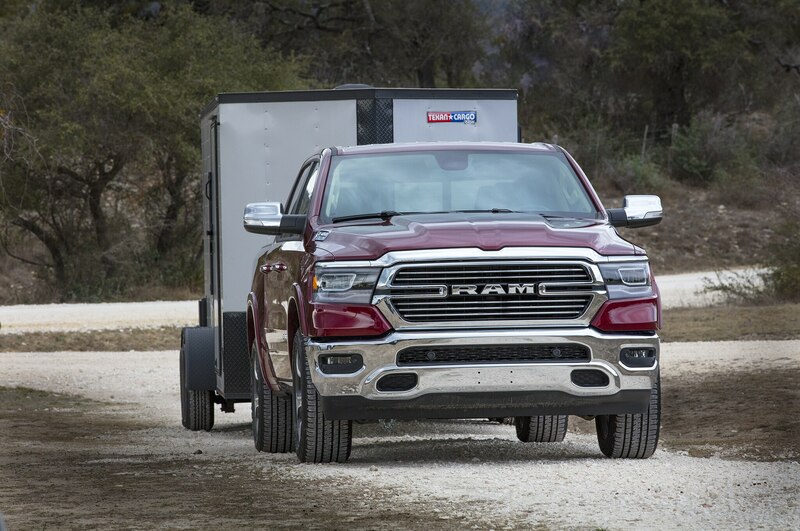 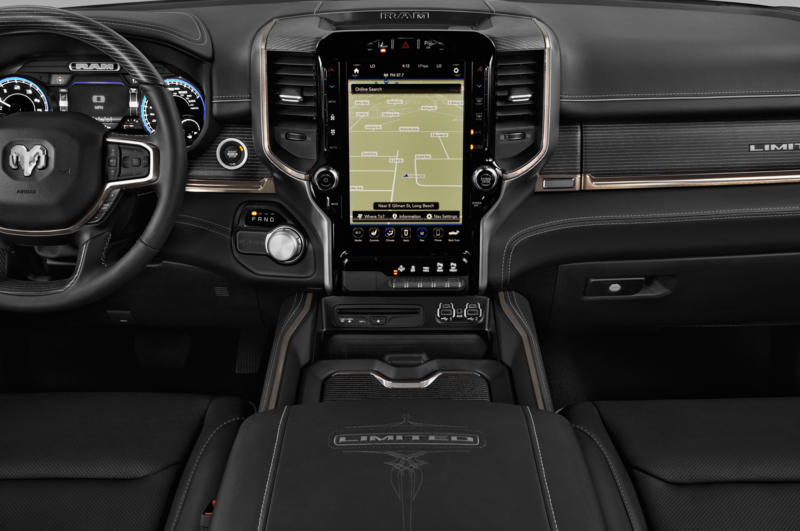 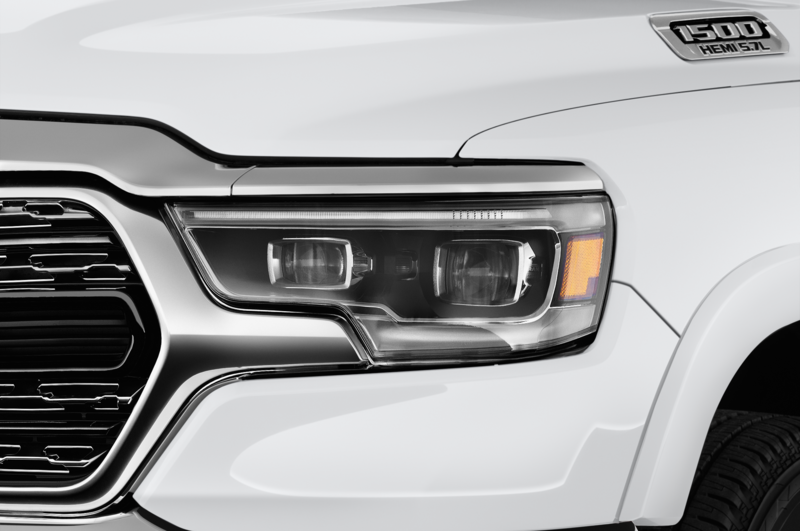 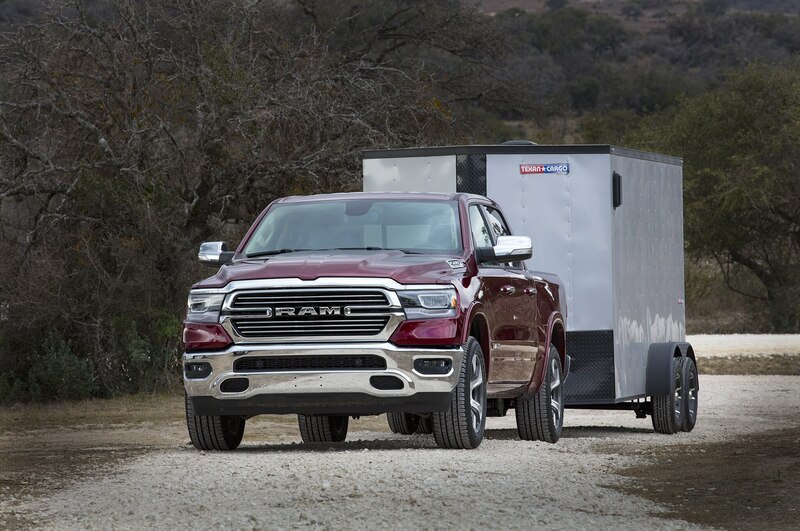 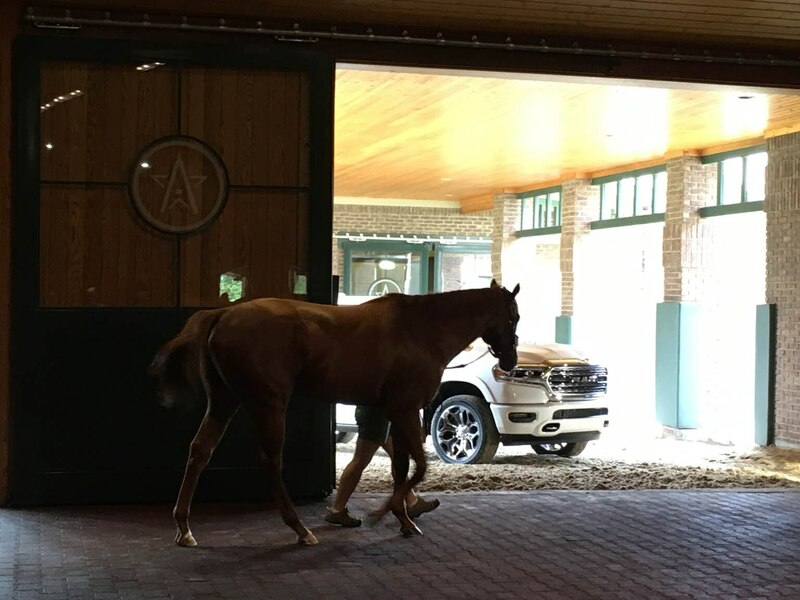 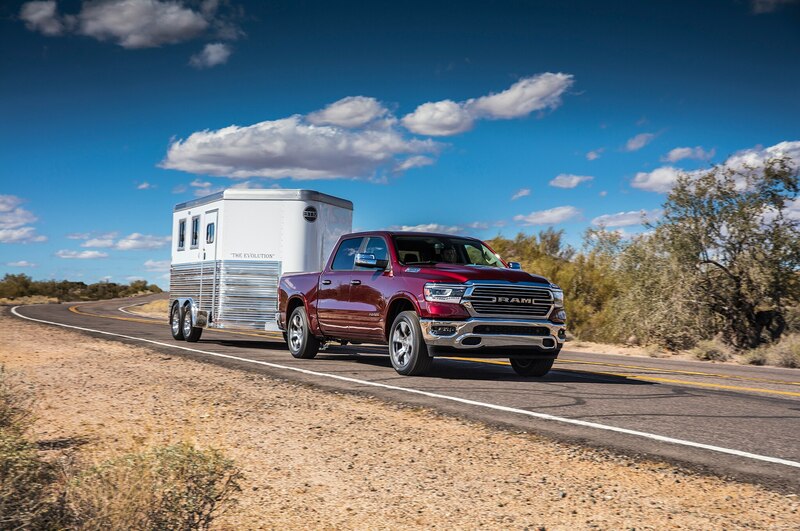 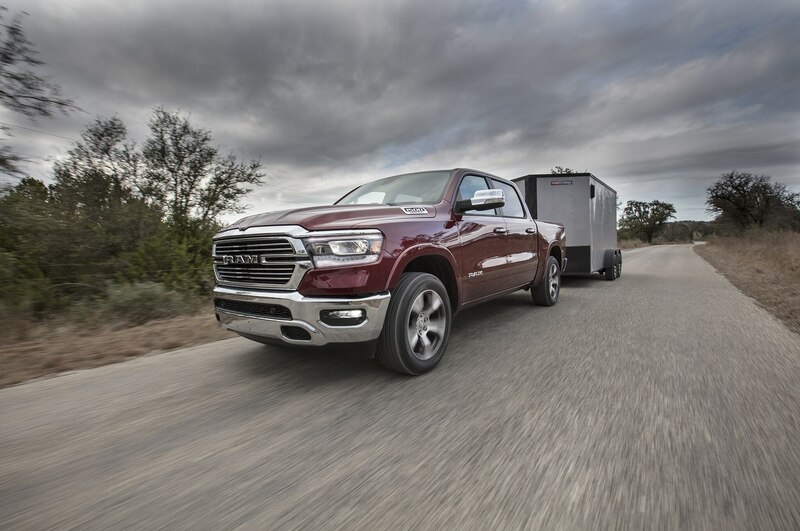 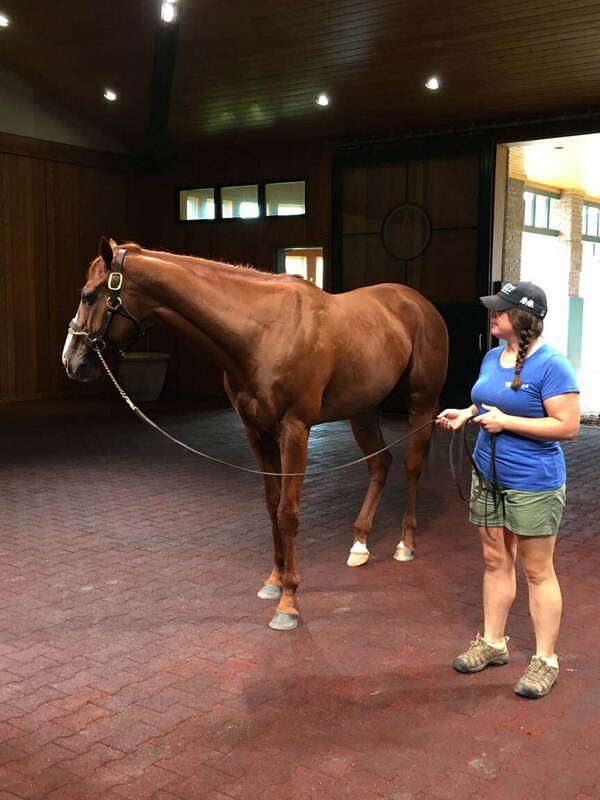 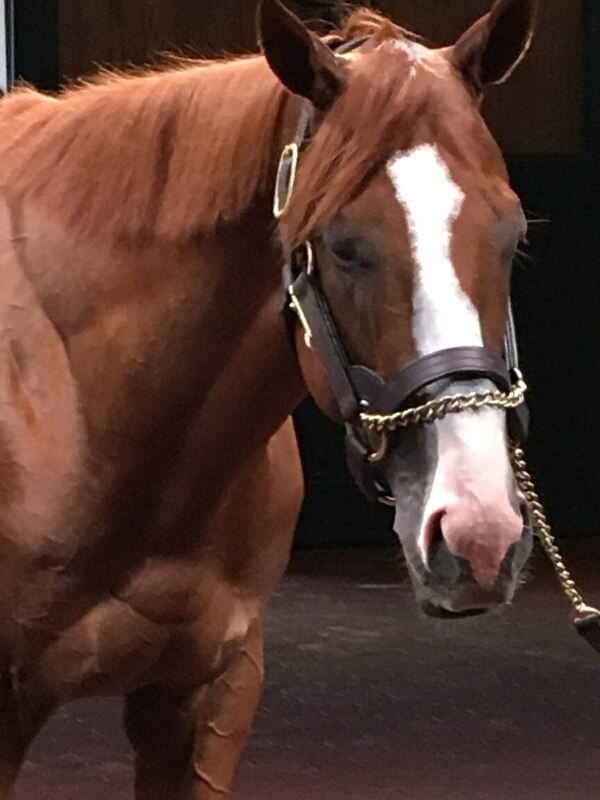 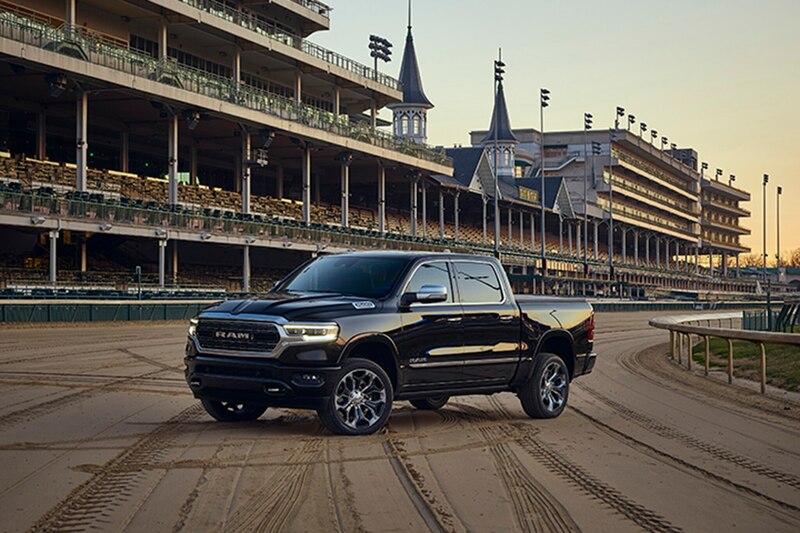 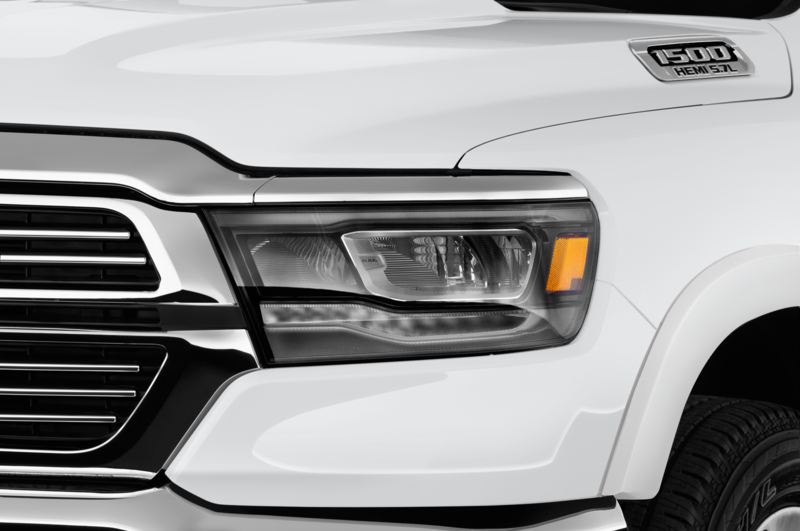 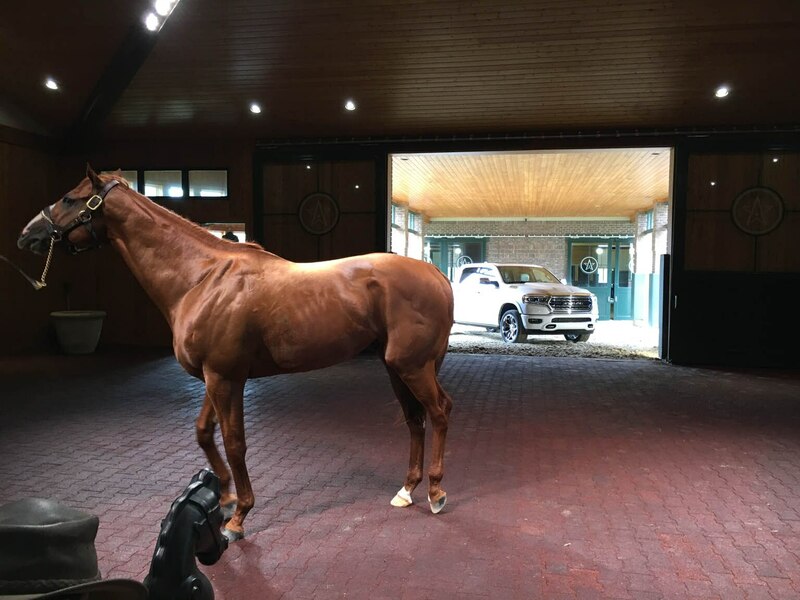 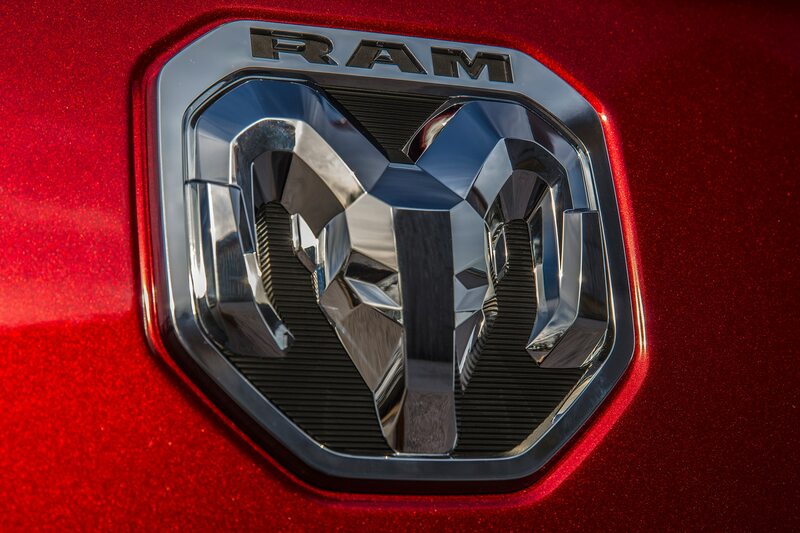 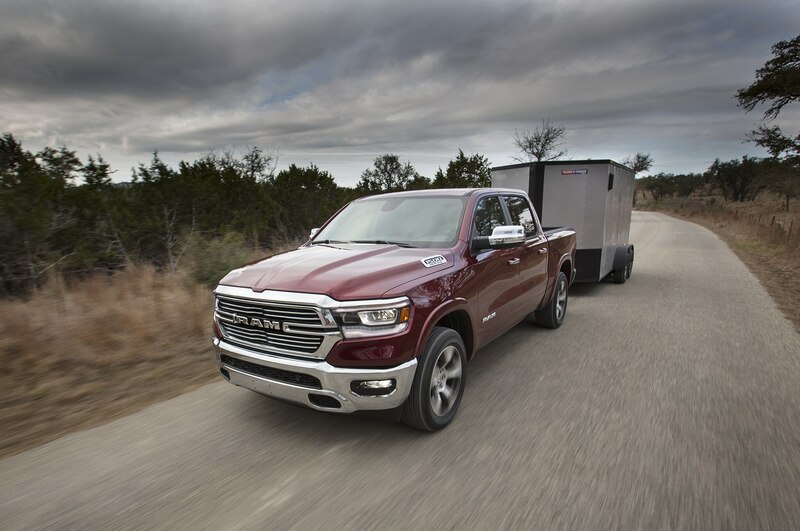 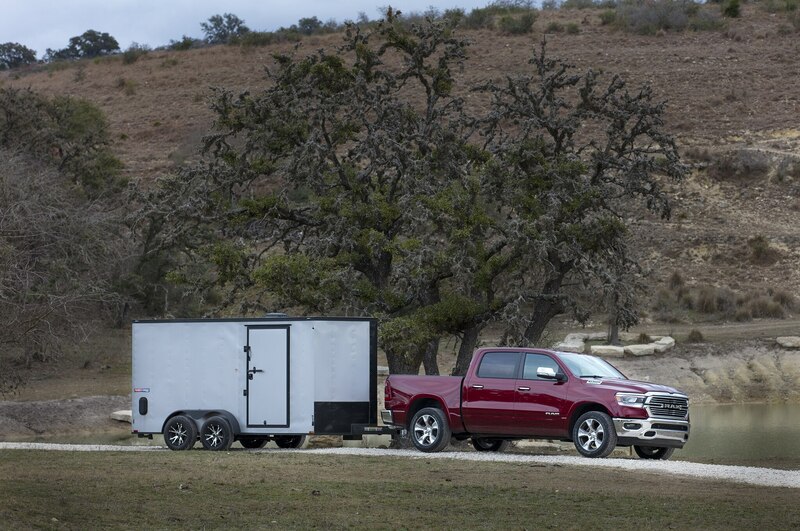 Ram claims a 2,300-pound payload for the V-6 eTorque, and a 12,750-pound trailer towing capacity for the V-8 eTorque, and so the truck marque used Kentucky horse country to show off its thoroughly redesigned new model, including a stop at WinStar Farms in Versailles, current home to 2018 Triple Crown winner Justify. 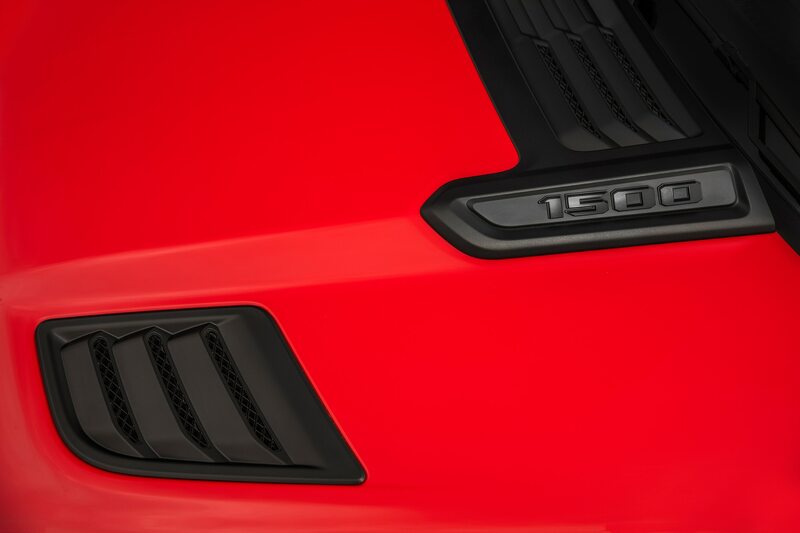 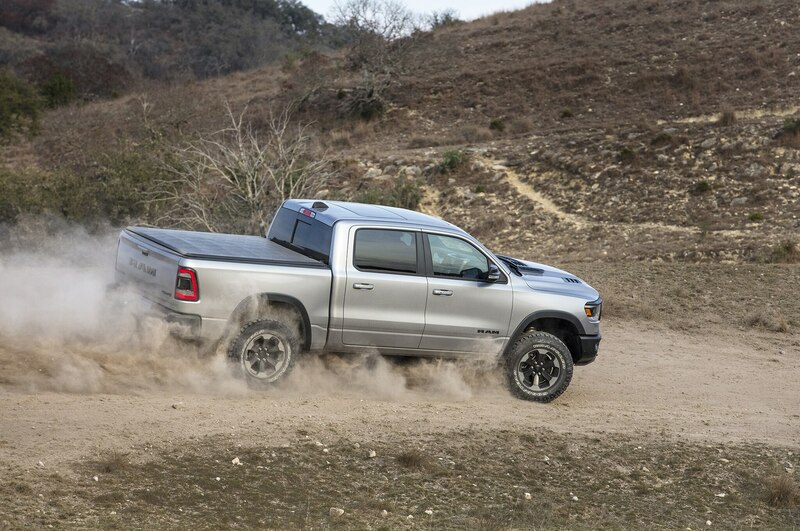 Both the eTorque V-6 and the eTorque V-8 are available with rear- or four-wheel-drive, and the usual array of pickup truck body styles and trims, though the test vehicles provided all were four-door crew cabs, with their four-inch increase in wheelbase over the 2018 model (which remains available as the 2019 Ram 1500 Classic), and of which three inches went to create an especially capacious back seat. 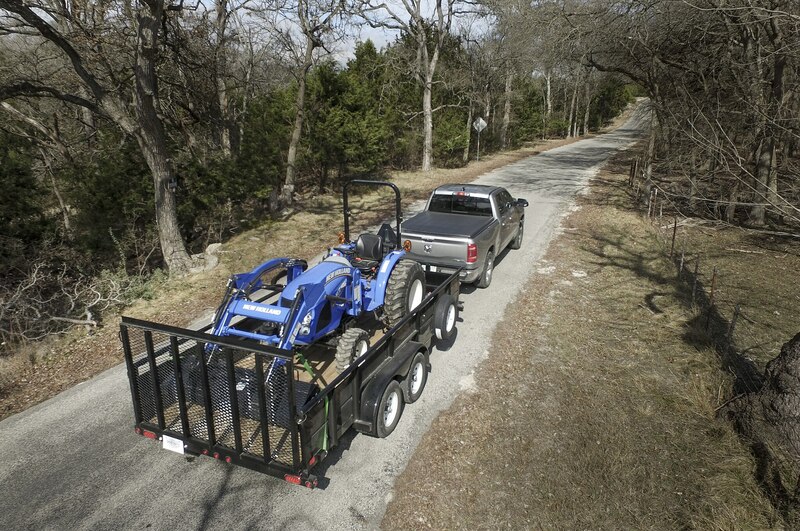 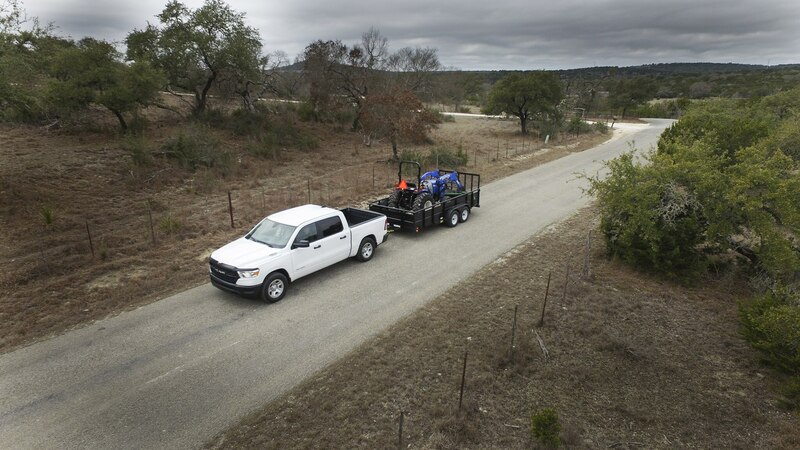 The eTorque system for either engine includes a 12-volt battery with a DC-to-DC 48- to 12-volt converter, and it provides a reliable stop/start system with smooth transitions even with a big load or heavy horse trailer. 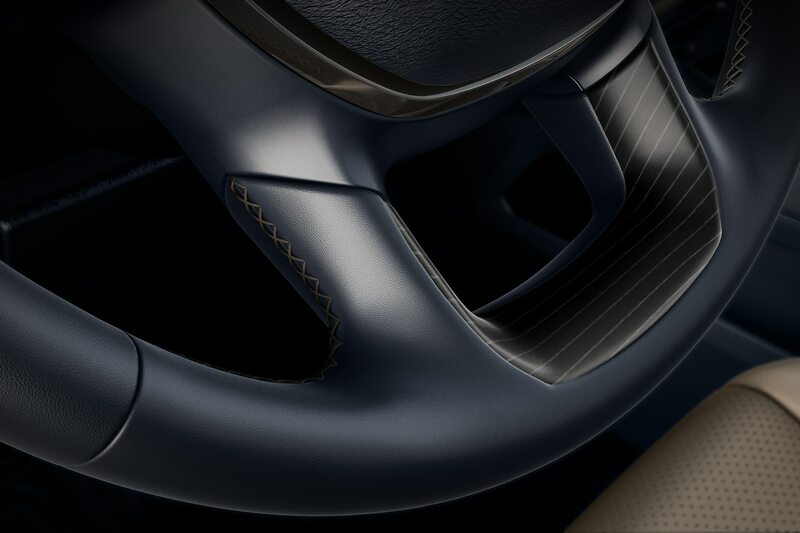 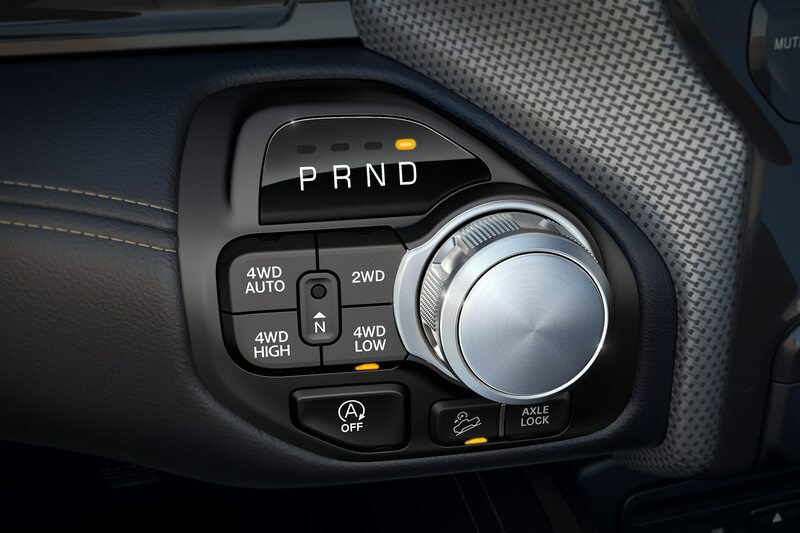 In stop/start situations, the first half-turn of the wheels is pure-electric, before making the transition to the gas engine, under any application of throttle. 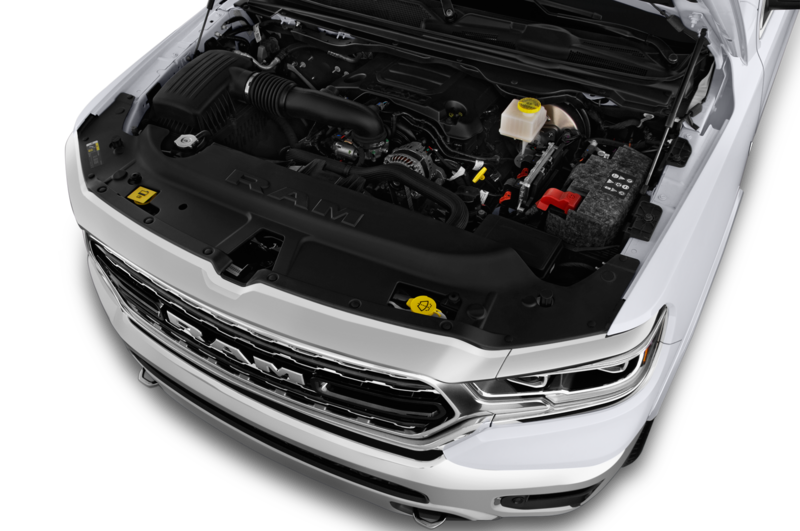 The eTorque V-6 features a two-step lift variable cam phasing, and the eTorque Hemi V-8 has variable cam phasing with cylinder shut-off to four cylinders. 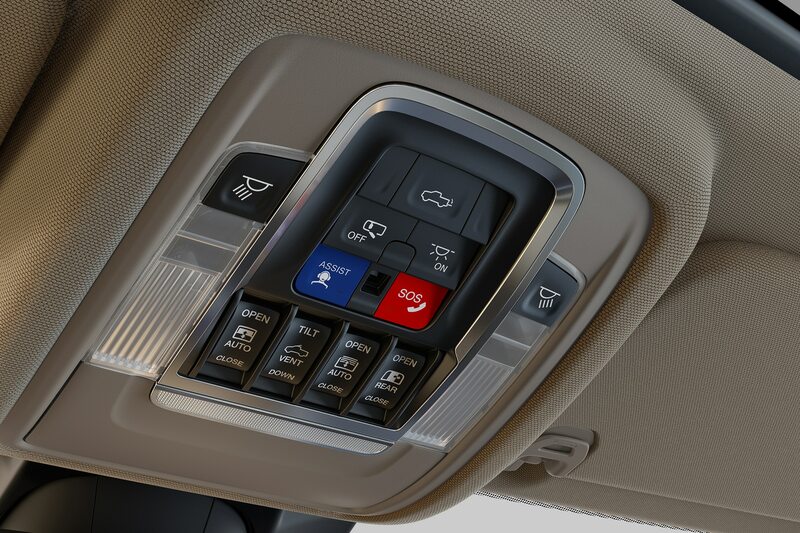 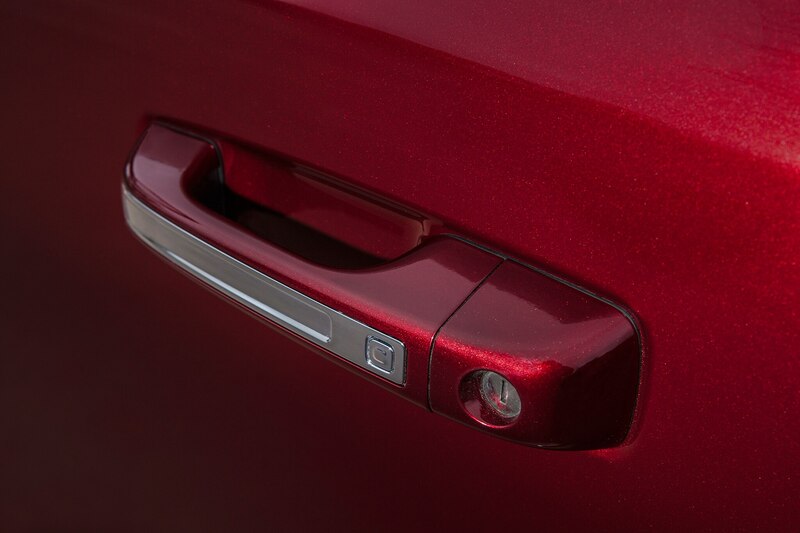 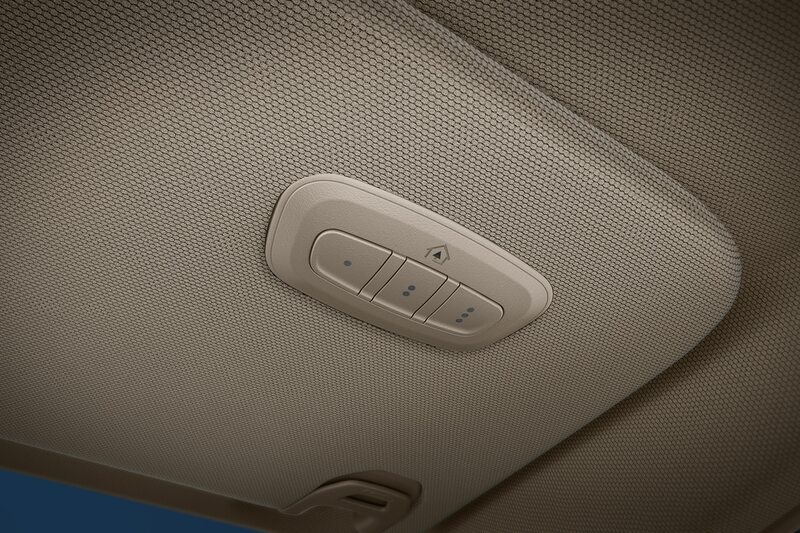 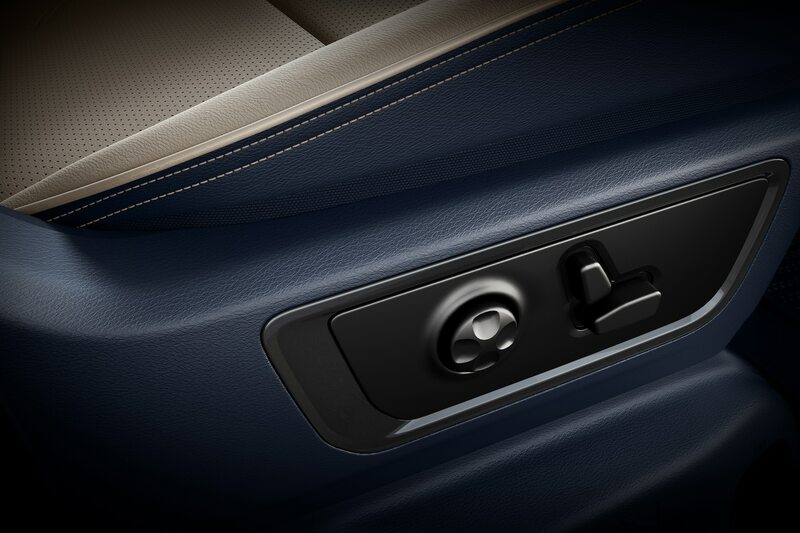 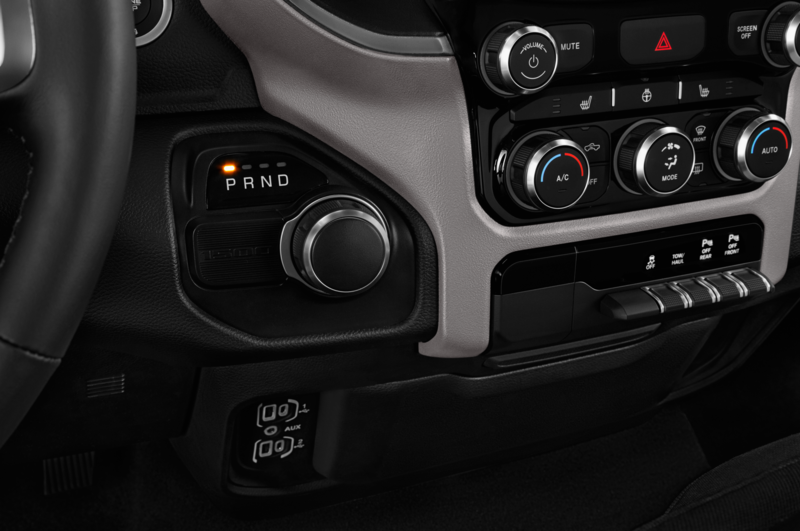 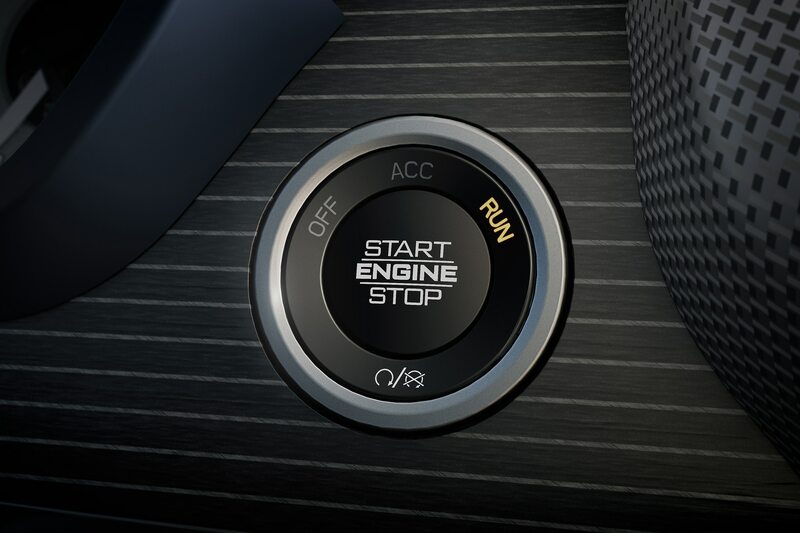 The stop part of the stop/start system can shut off the engine while keeping everything else going for up to 10 minutes. 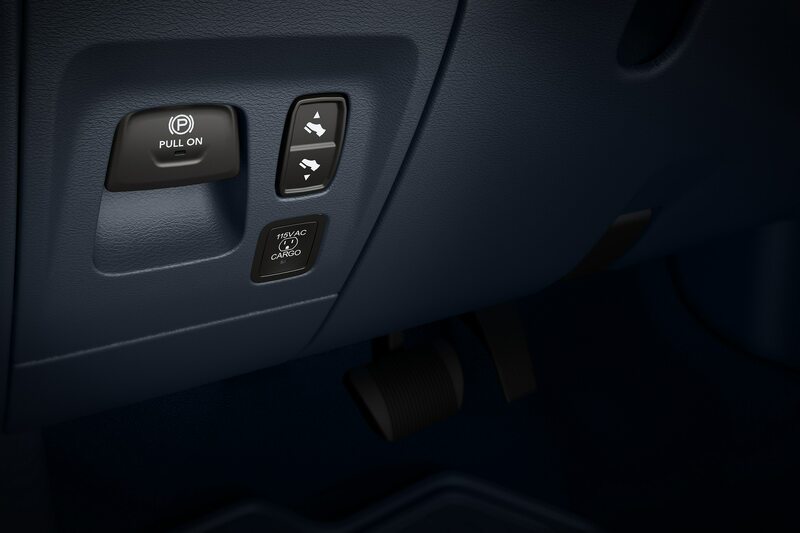 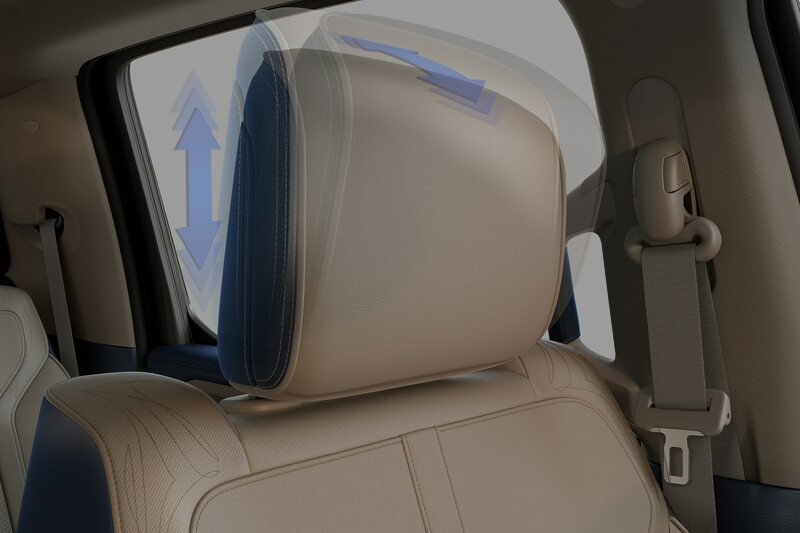 In addition to the e-roll assist half-turn of the wheels, the eTorque systems assist shift transition smoothing and reduce parasitic drag. 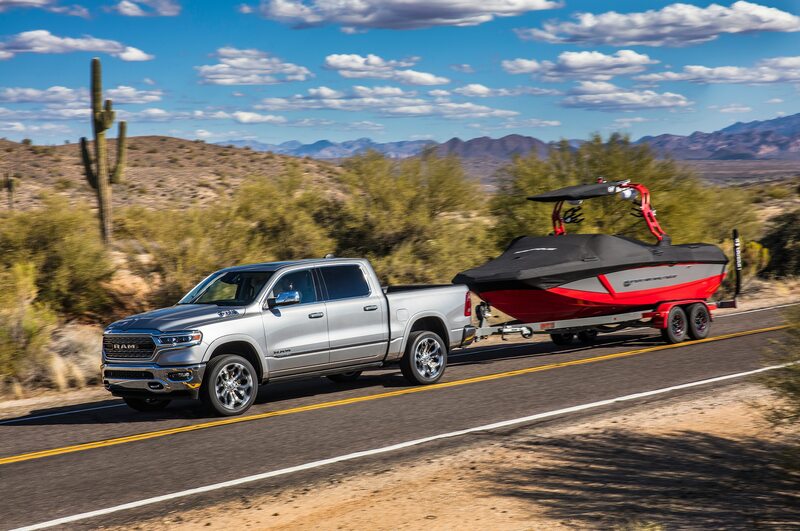 There’s a coast-fuel shutoff with reduced pumping effort and coasting regeneration, and levels of regeneration that includes pure eTorque, pure friction or a blend of the two. 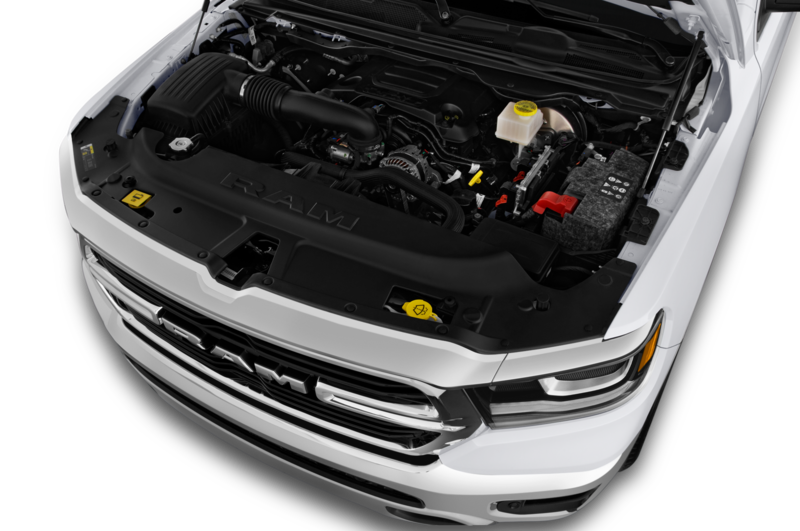 On the 3.6-liter Pentastar V-6, eTorque adds 90 pound-feet to the base engine’s 269 pound-feet, and on the 5.7-liter Hemi, eTorque is good for an additional 130 pound-feet of torque, on top of the base V-8’s 410 pound-feet. 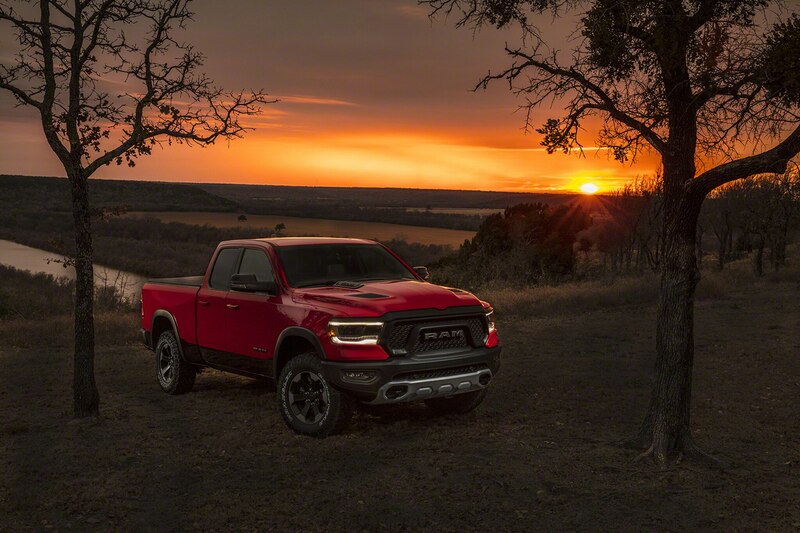 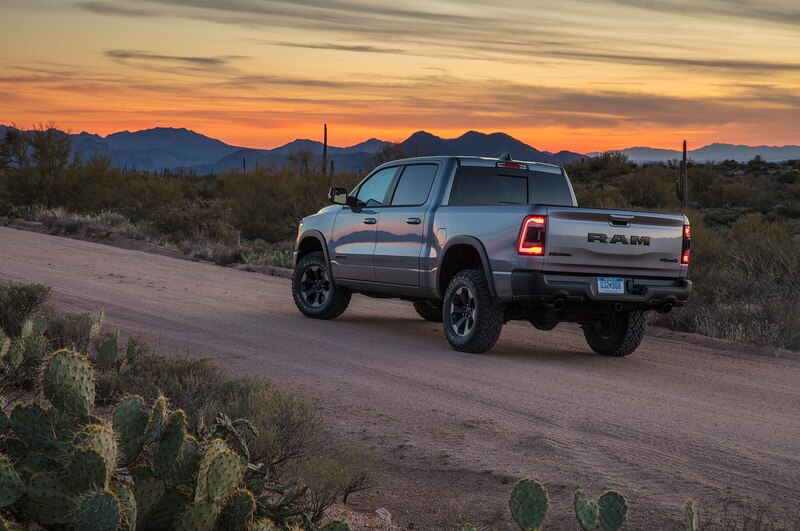 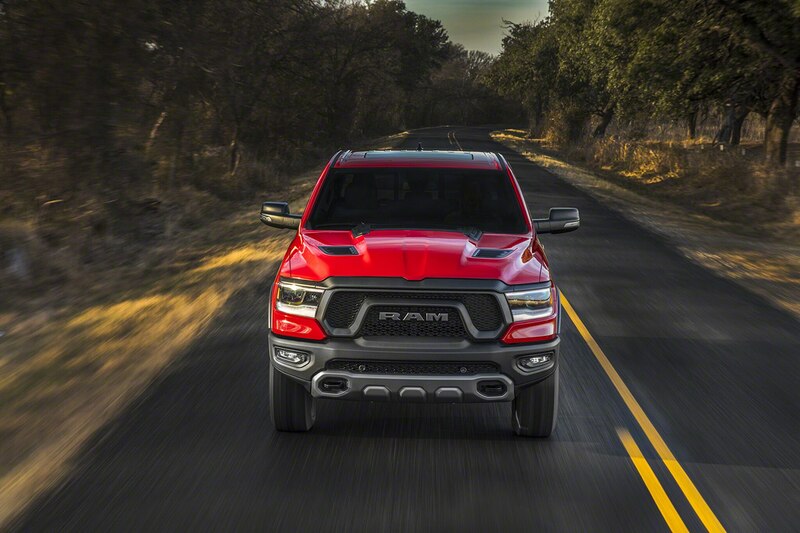 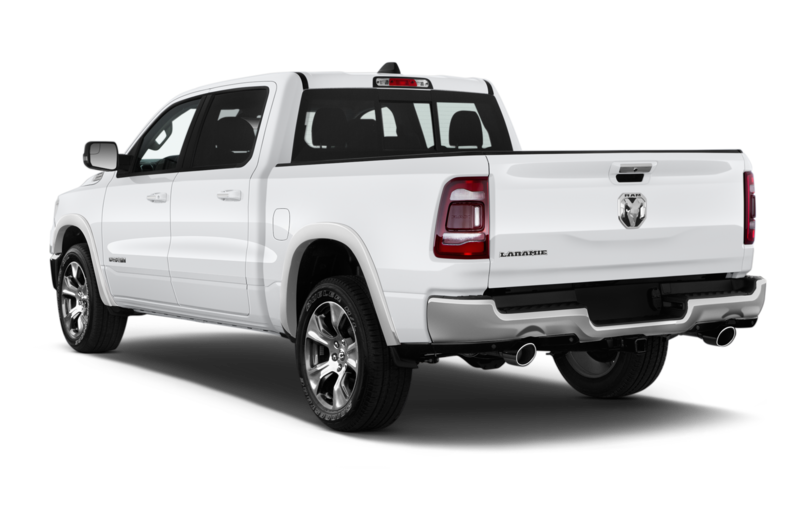 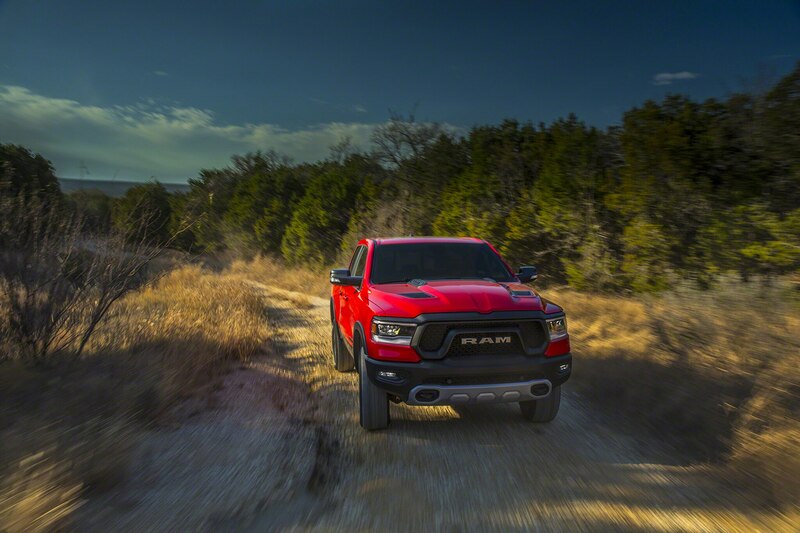 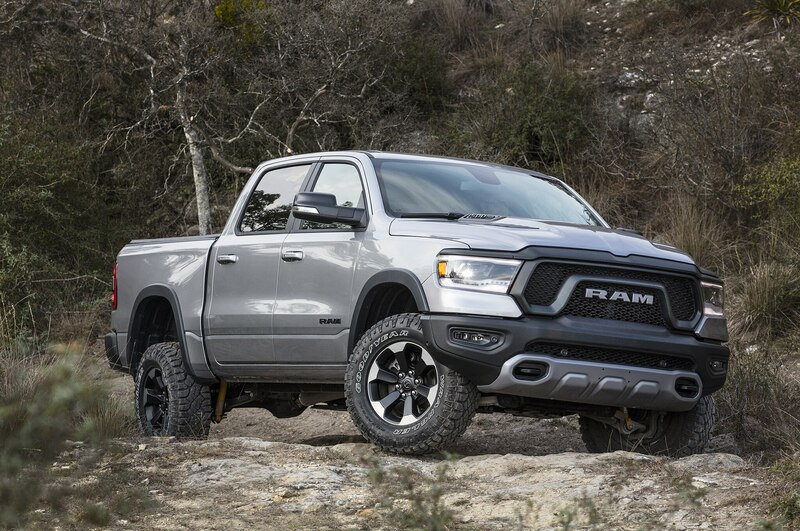 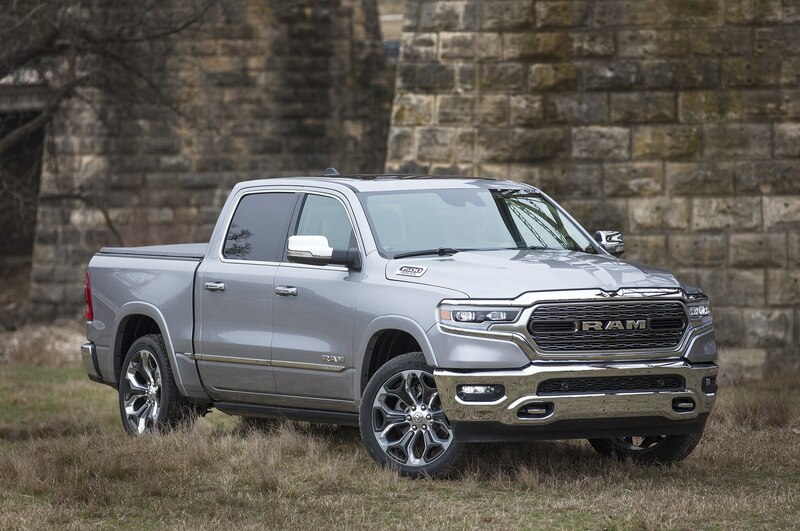 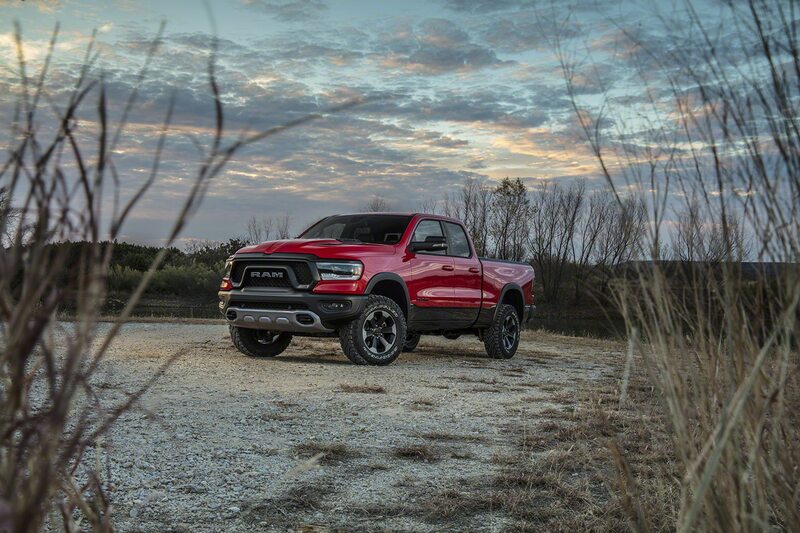 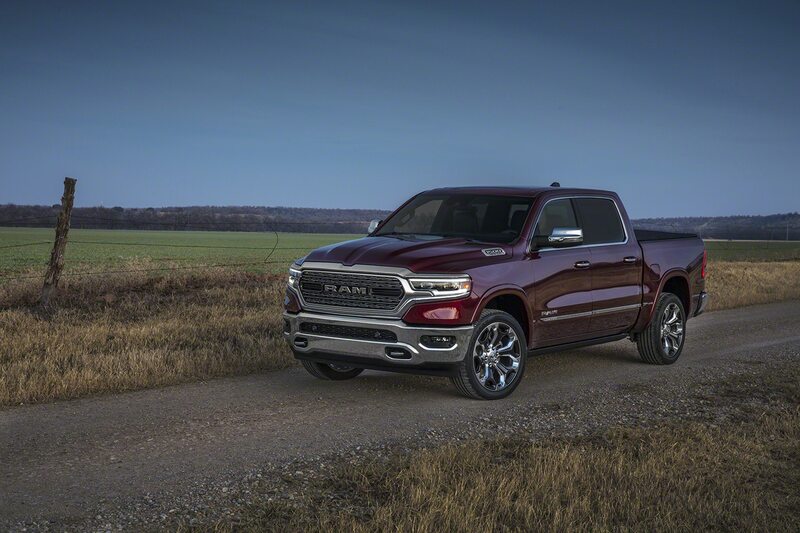 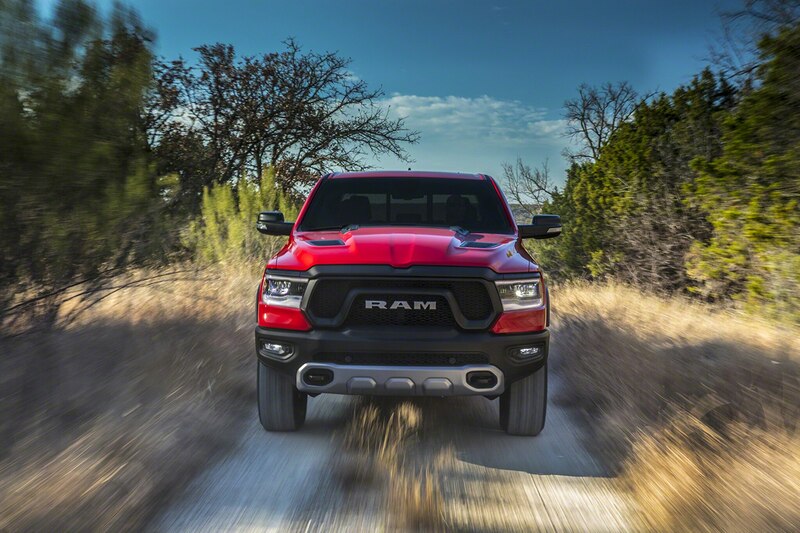 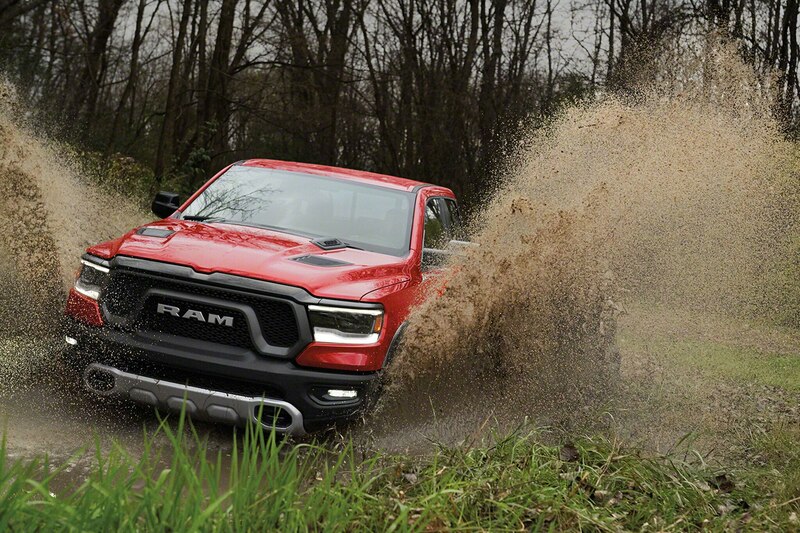 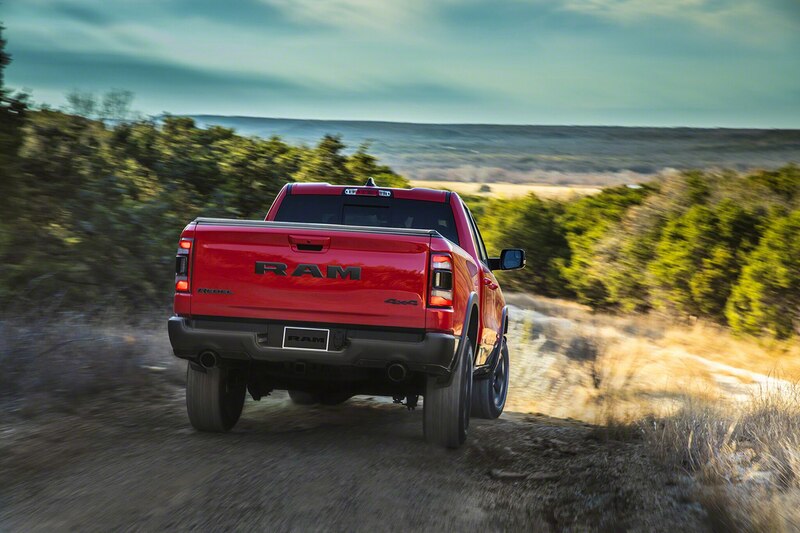 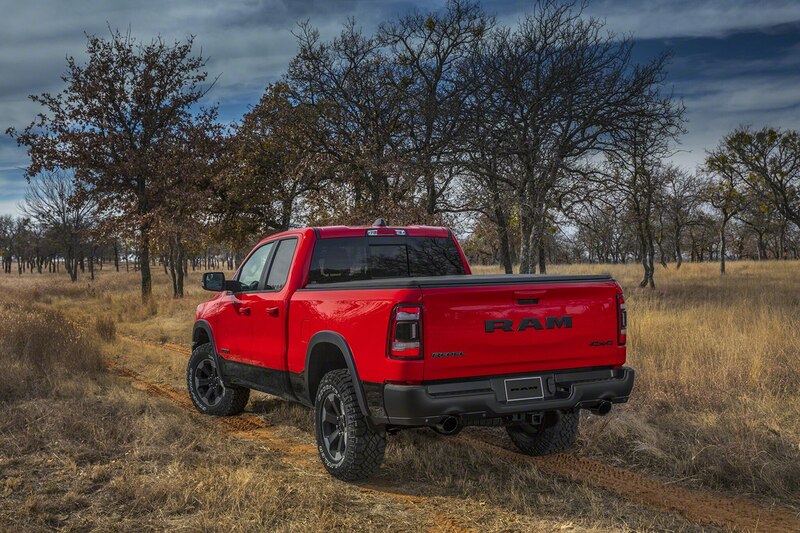 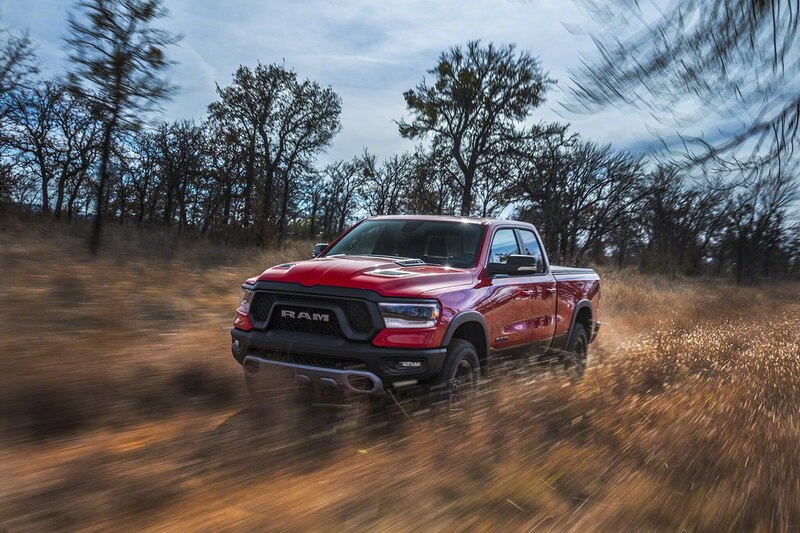 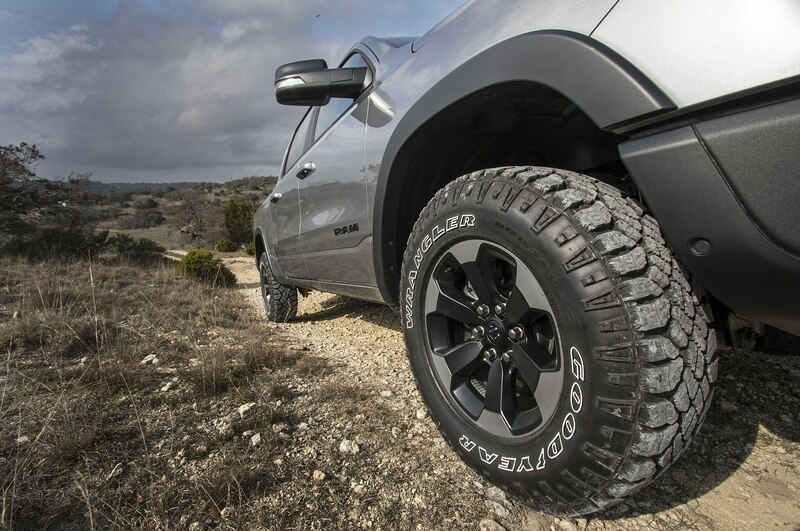 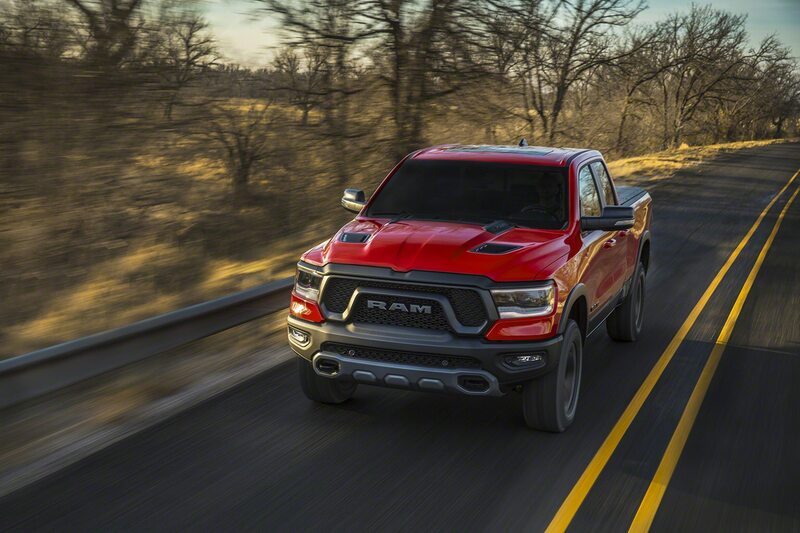 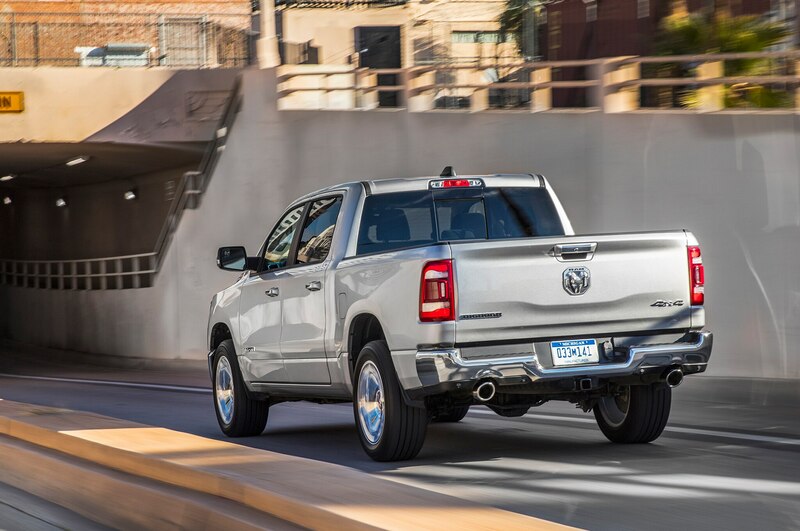 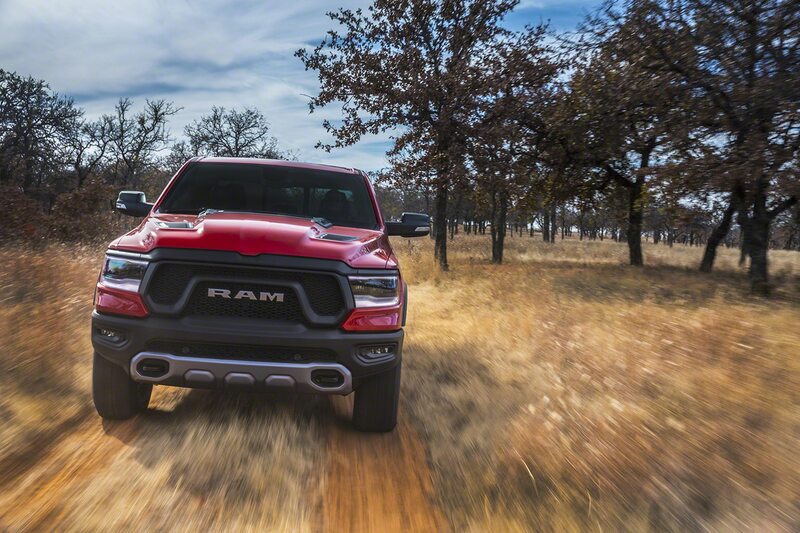 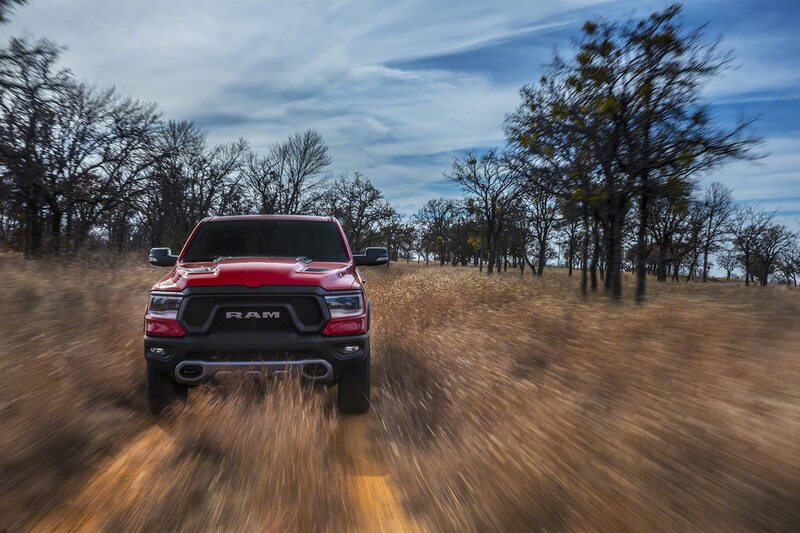 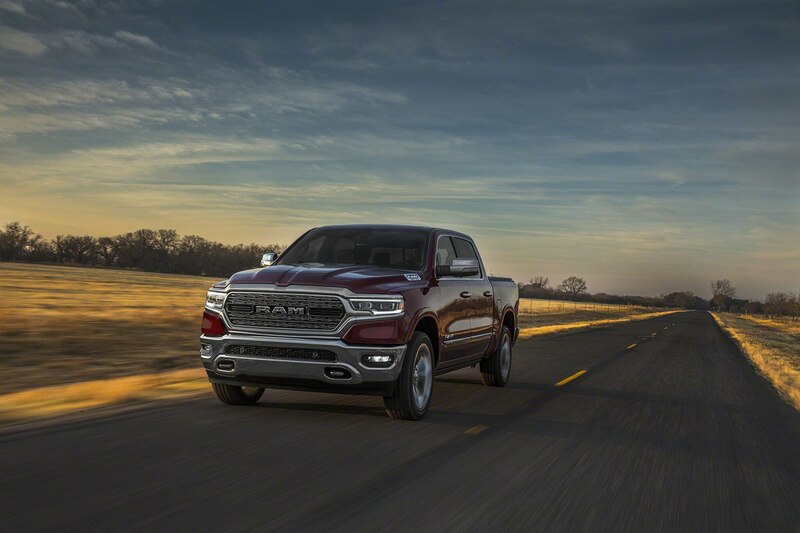 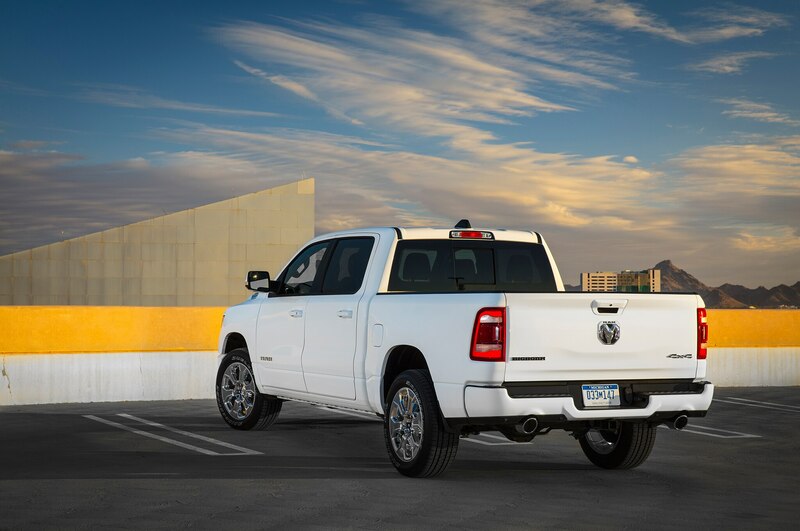 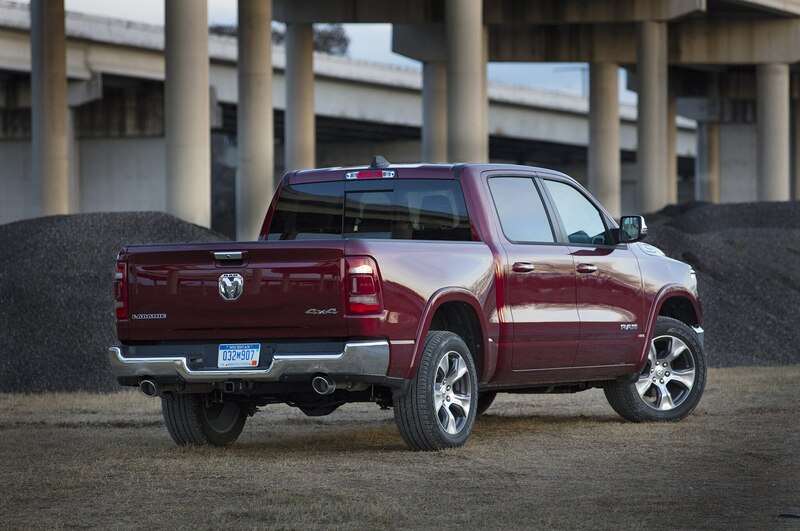 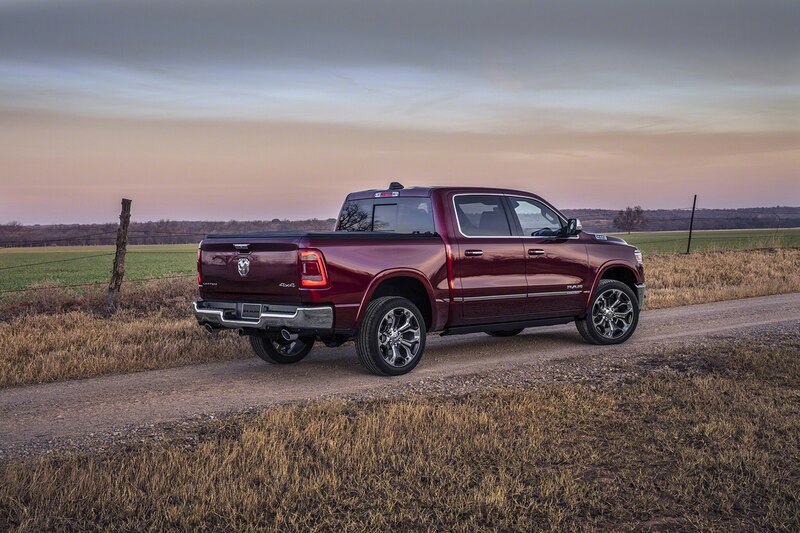 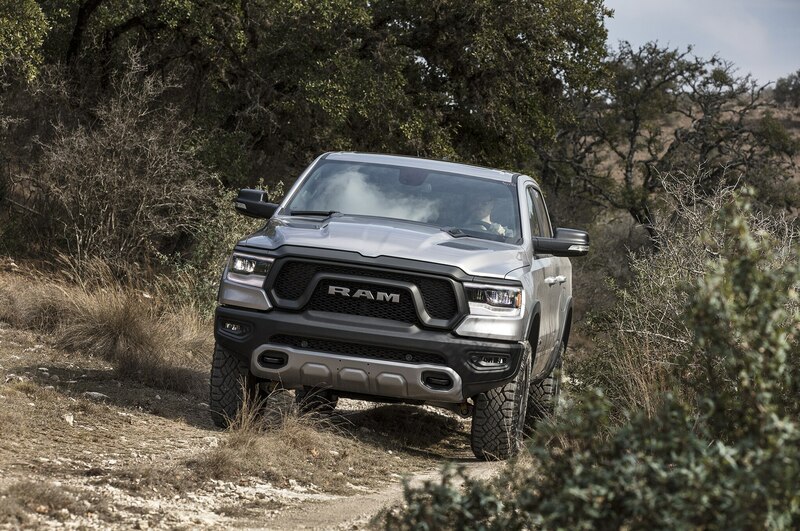 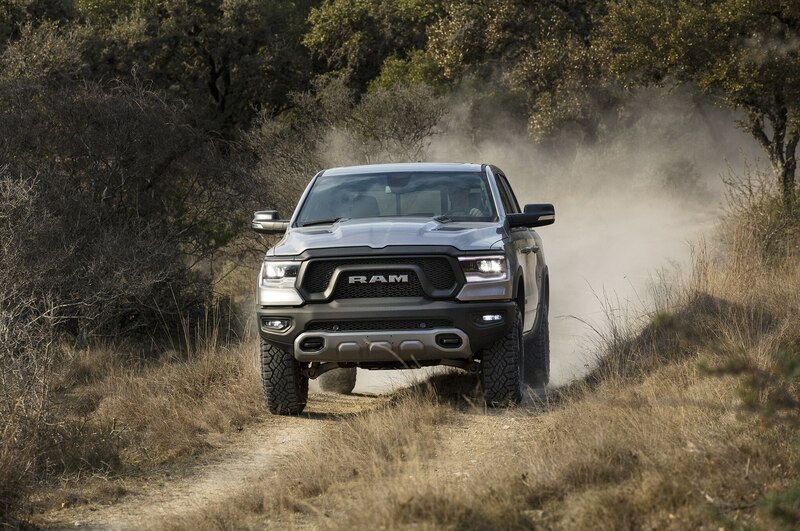 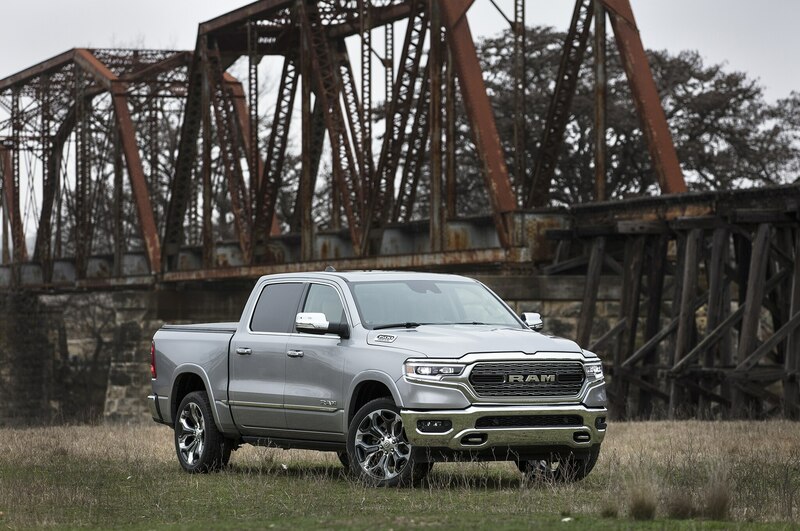 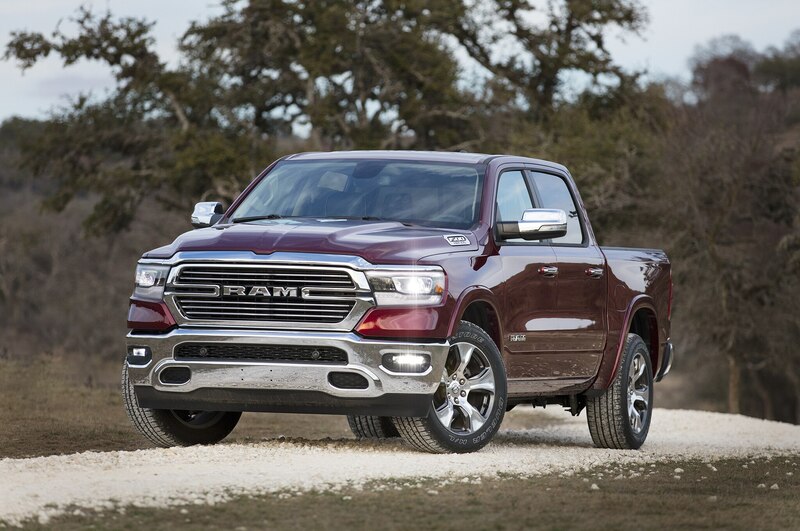 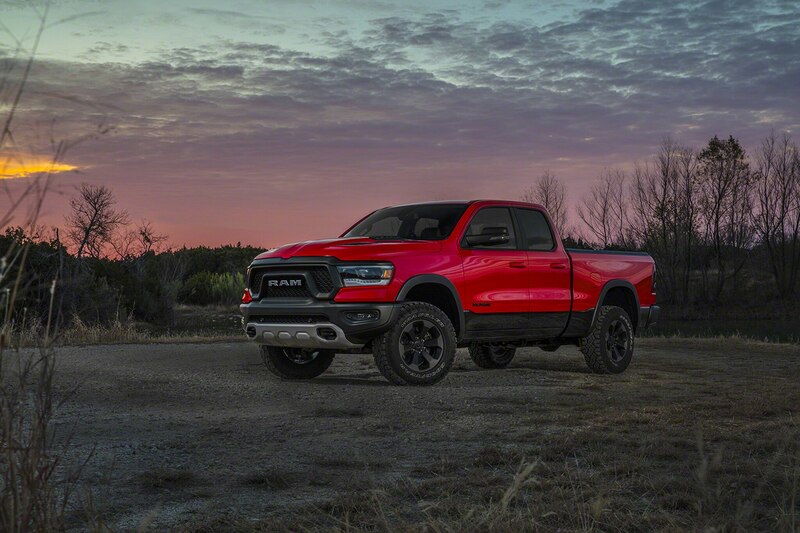 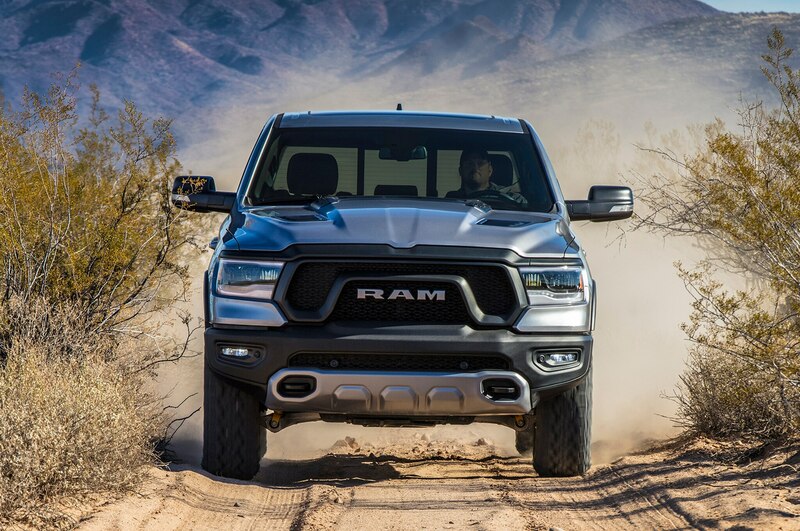 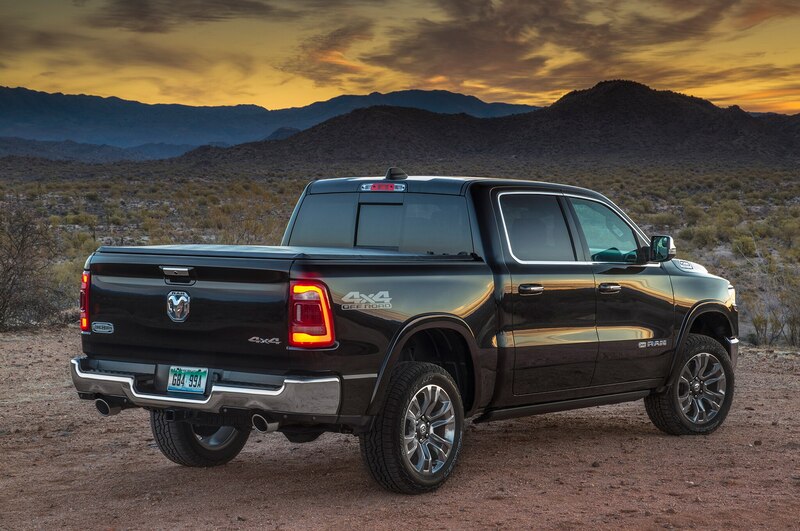 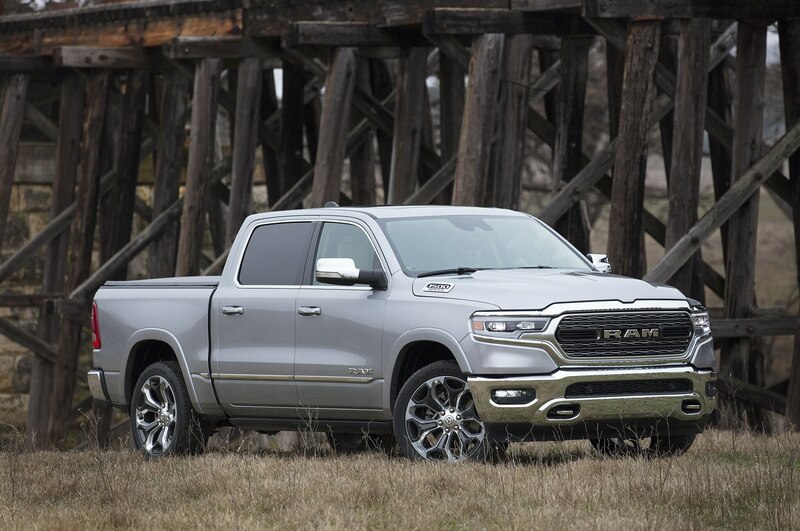 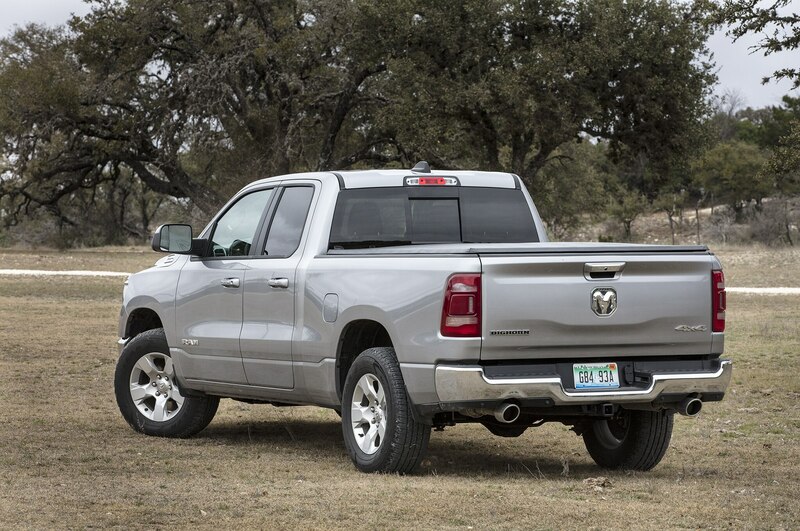 EPA numbers weren’t quite ready for the V-6 eTorque, but Ram expects a 2-mpg to 3-mpg city/highway increase over the standard Pentastar, which would potentially push the 4WD 1500’s estimates to 18/26 mpg, and the 2WD 1500’s estimates to 19/28 mpg. 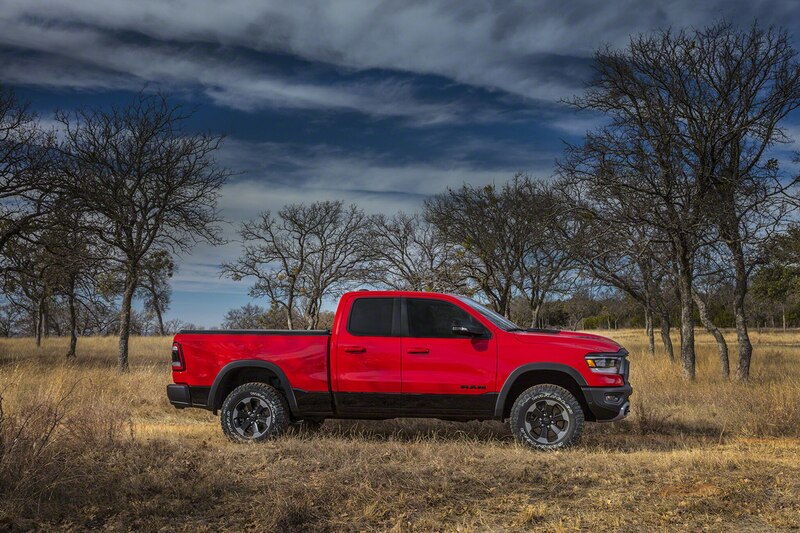 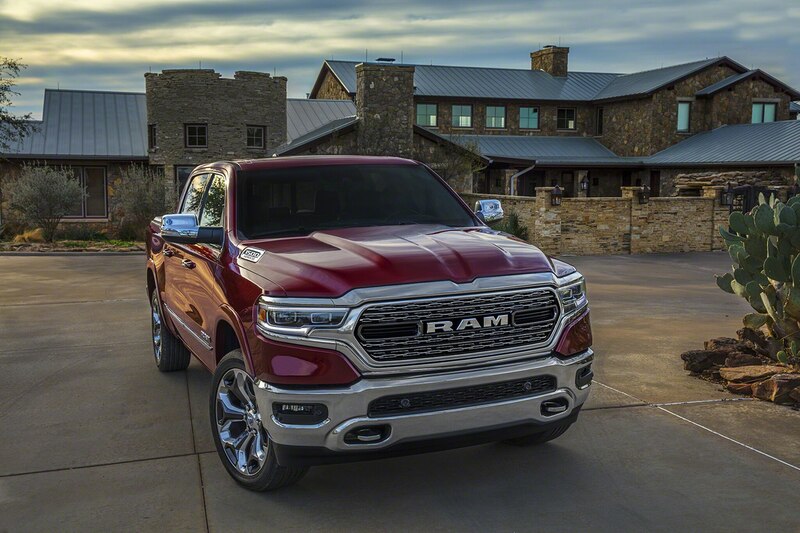 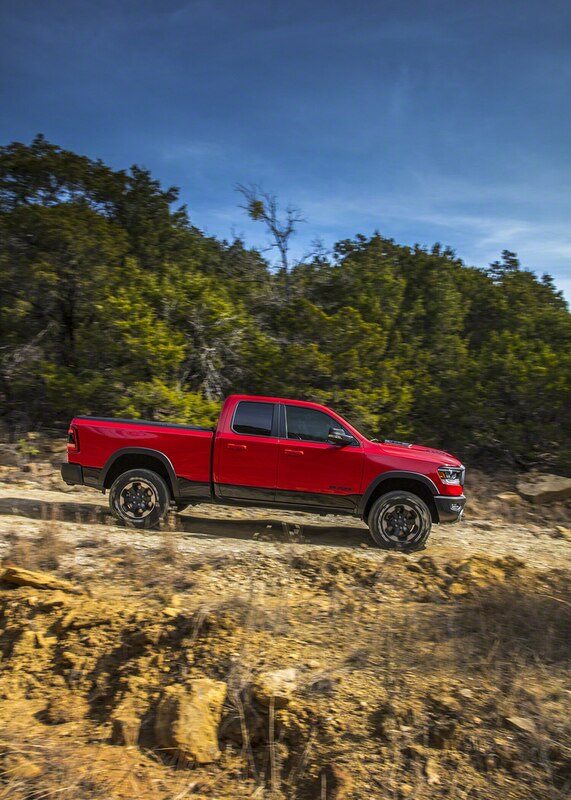 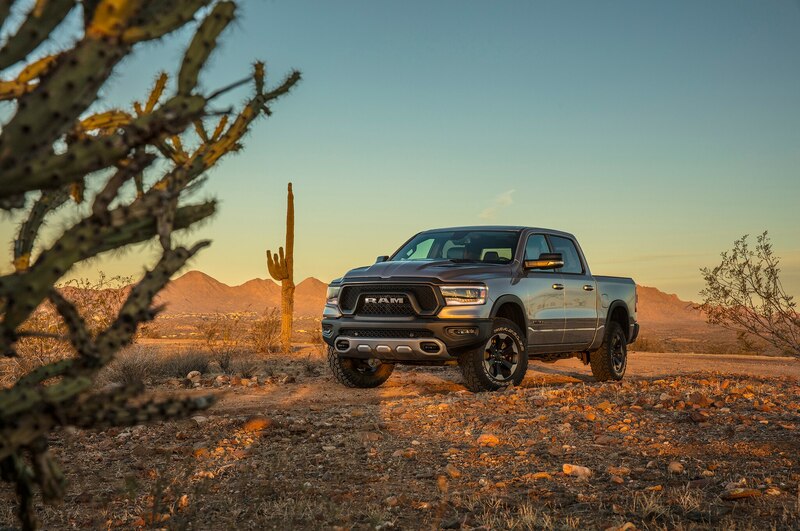 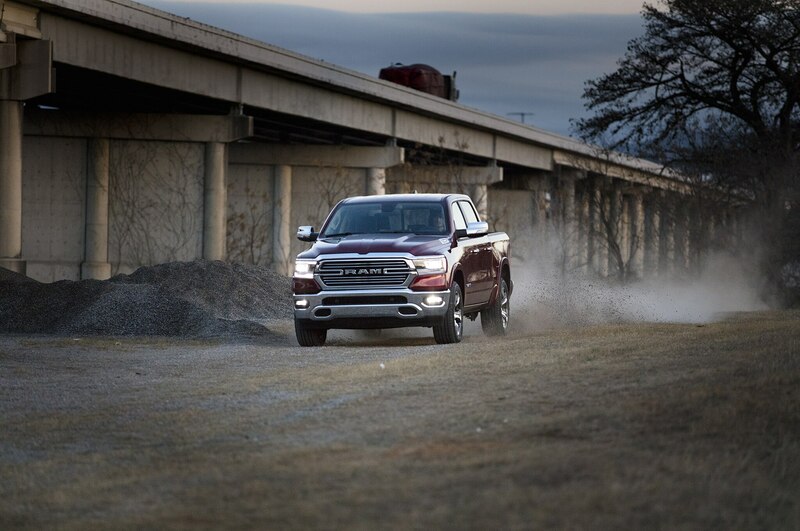 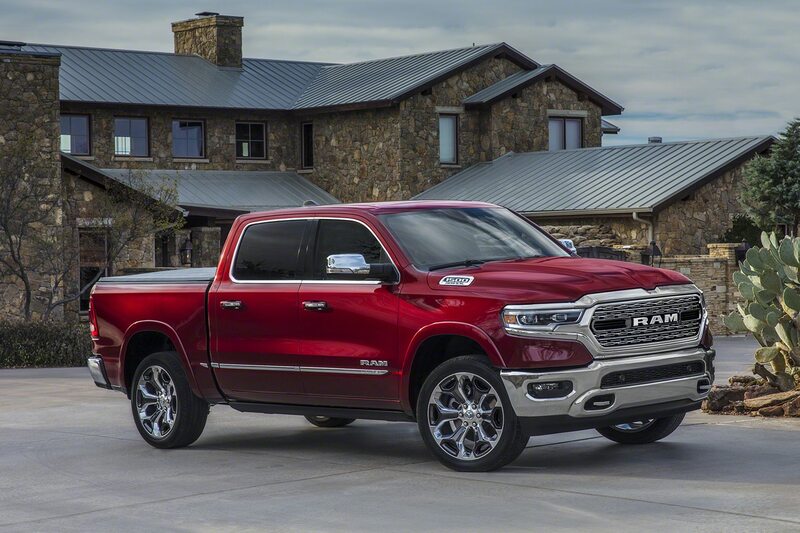 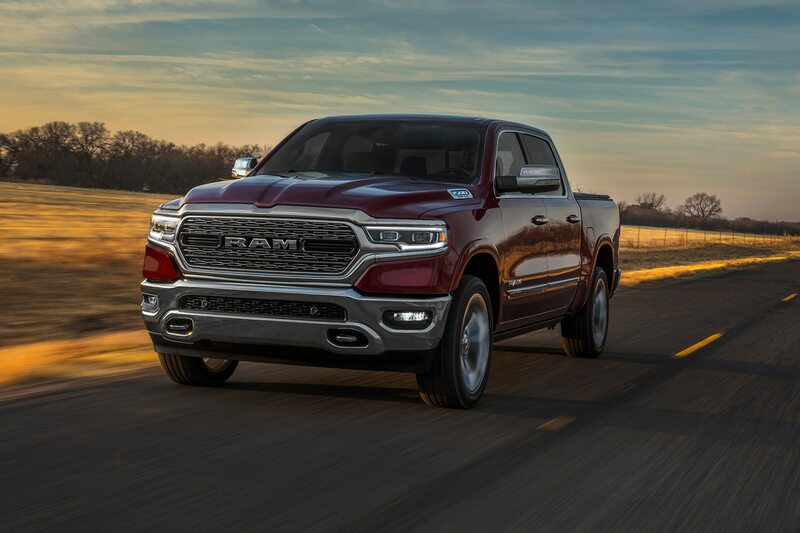 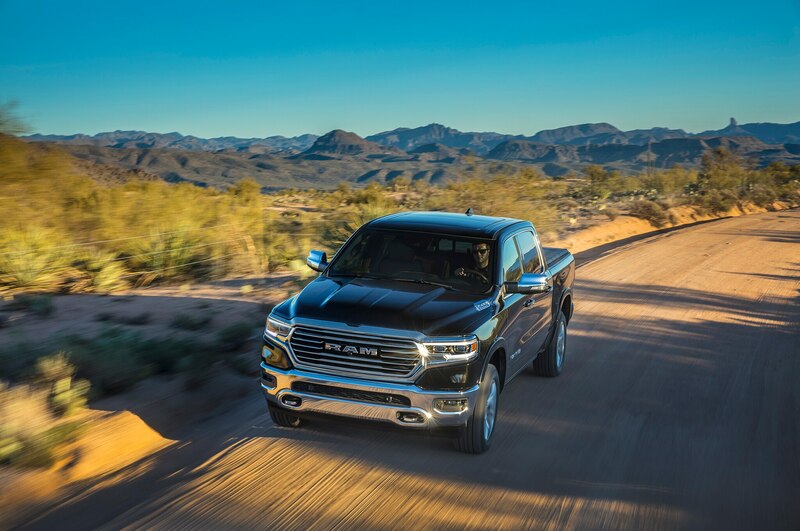 The ’19 Ram 1500 Hemi eTorque is already in dealers, and the 4WD models’ EPA of 17/22 city/highway mpg tops comparable V-8 Ford F-150s and the new ’19 Chevrolet Silverado/GMC Sierra with the 6.2-liter V-8 and 10-speed automatic. 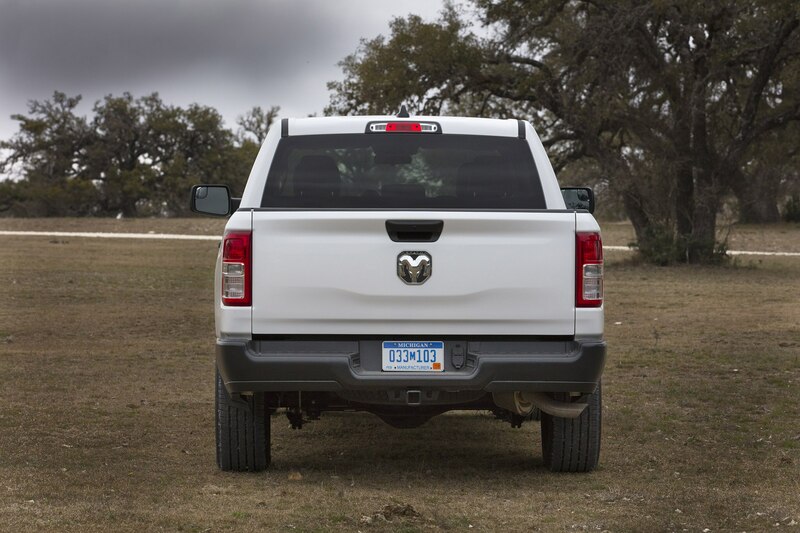 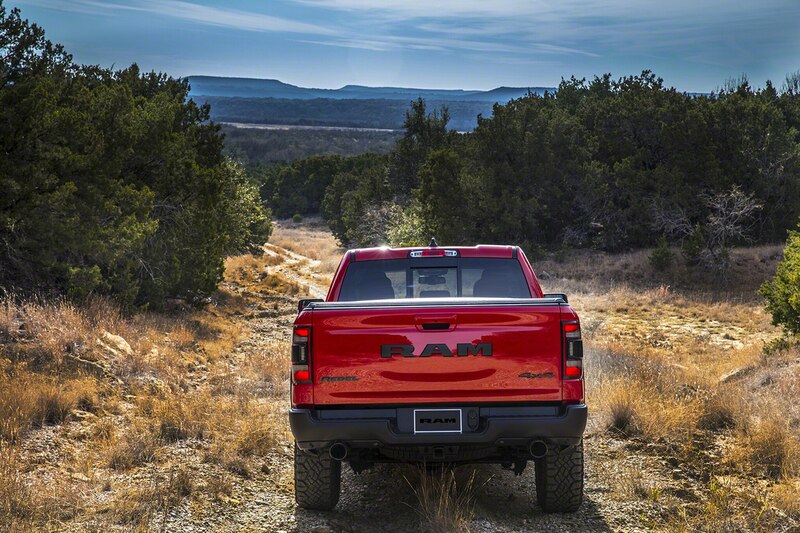 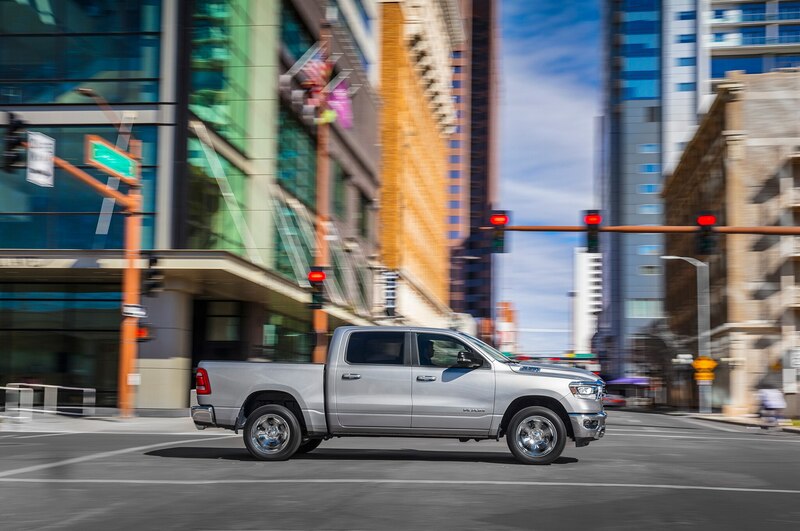 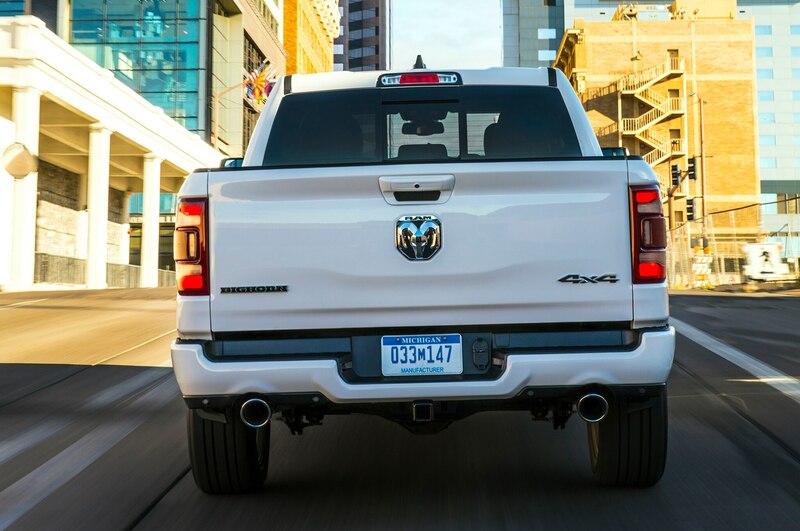 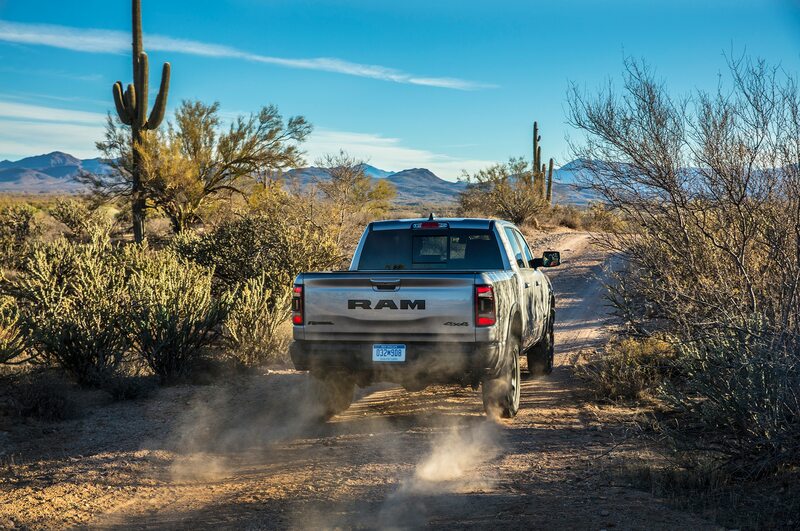 The 4WD Ram’s highway number is equal to the 5.3-liter/8-speed versions of the 4WD GM models, and beats them by 1 mpg in the city. 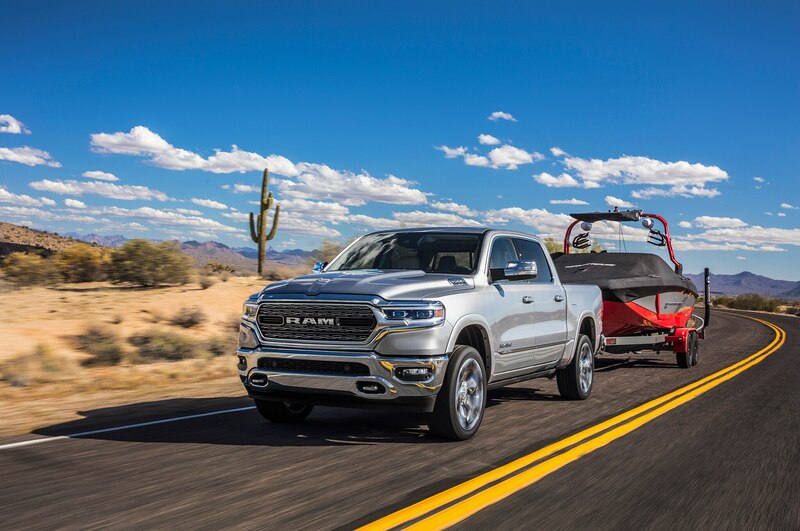 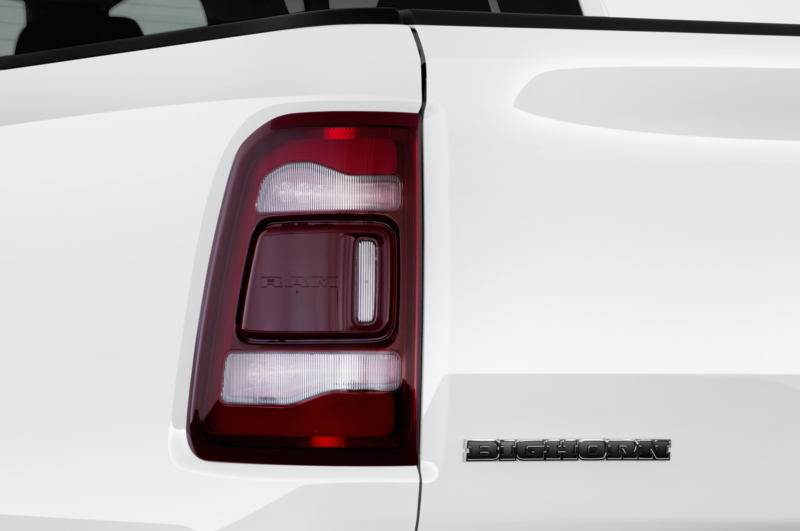 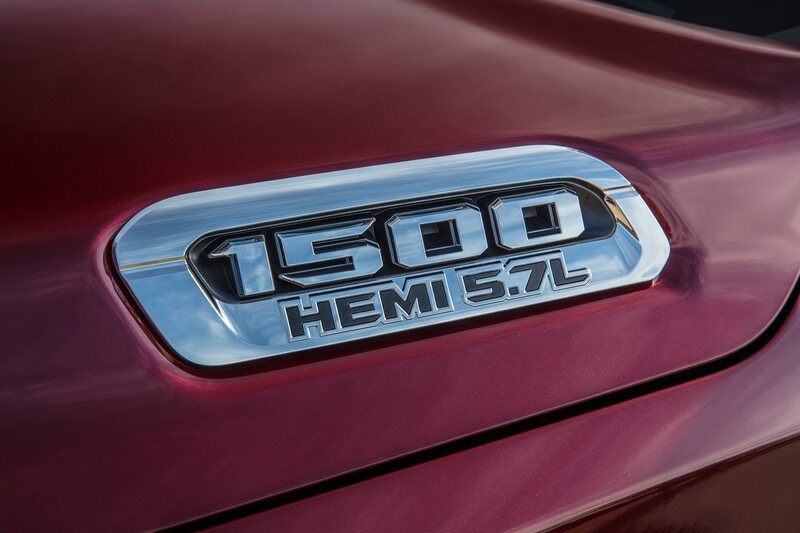 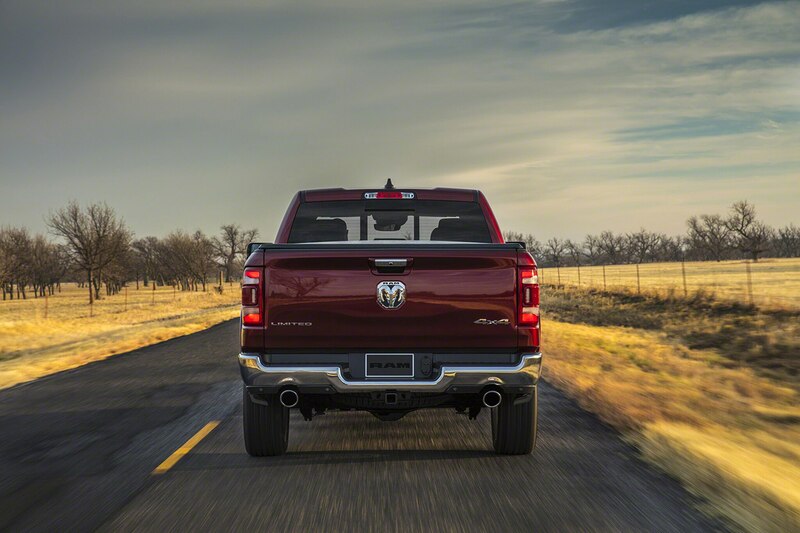 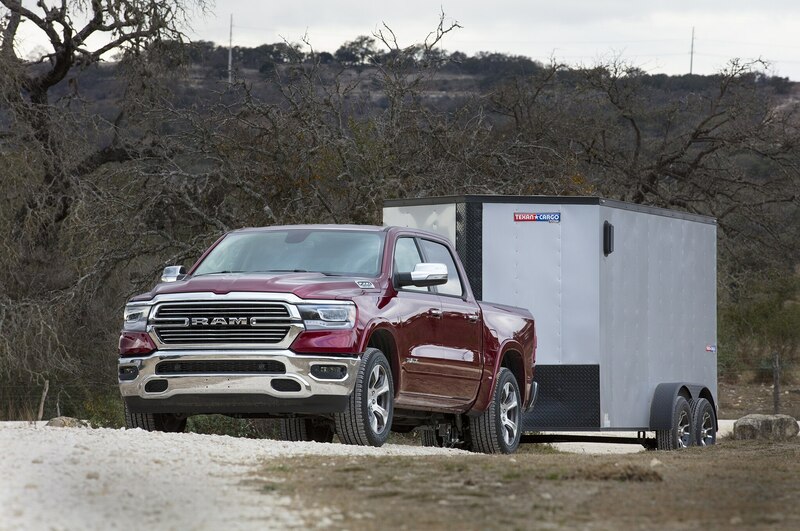 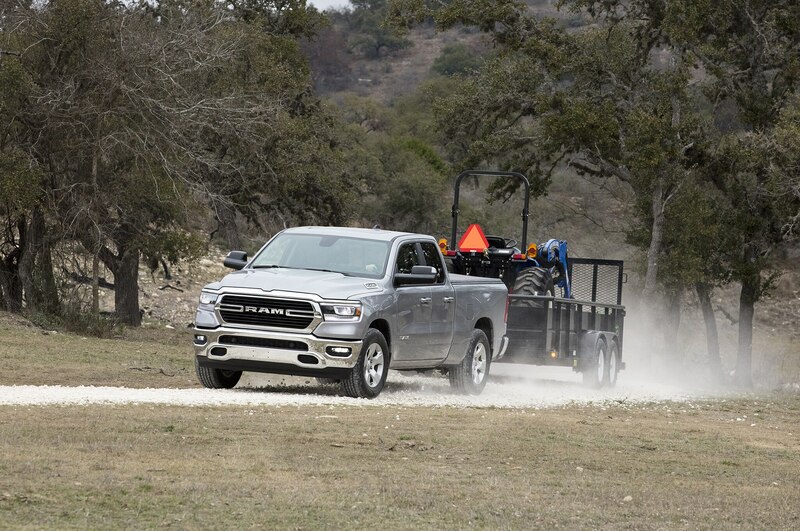 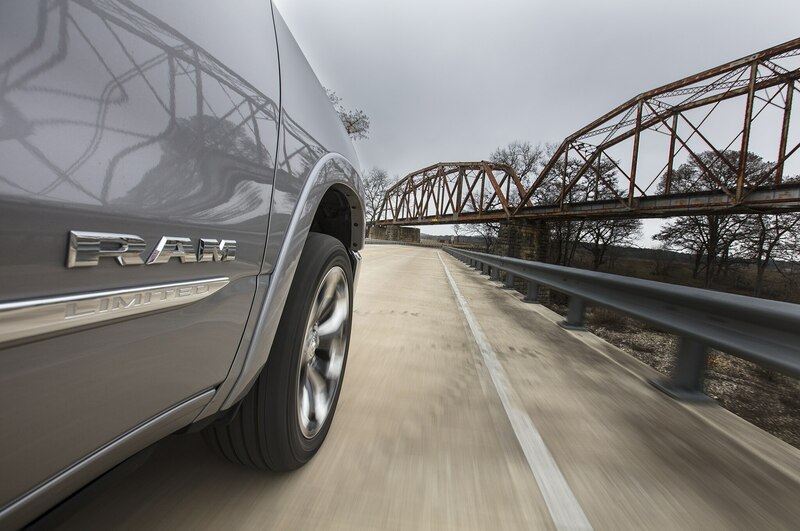 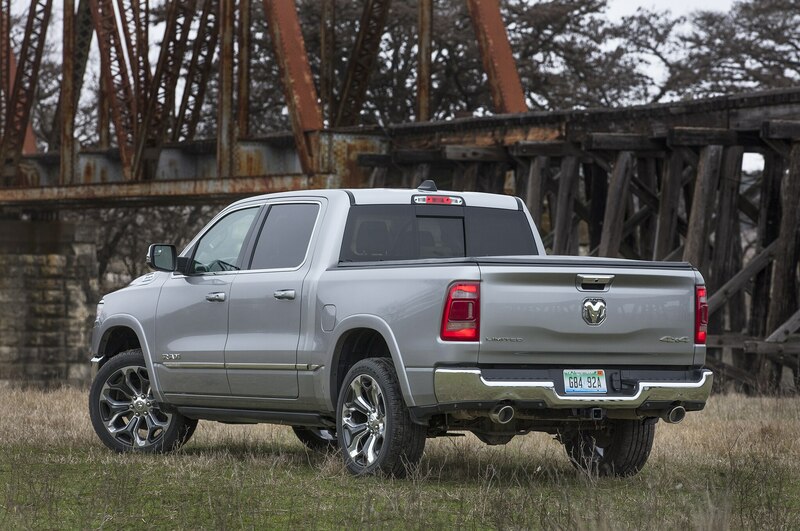 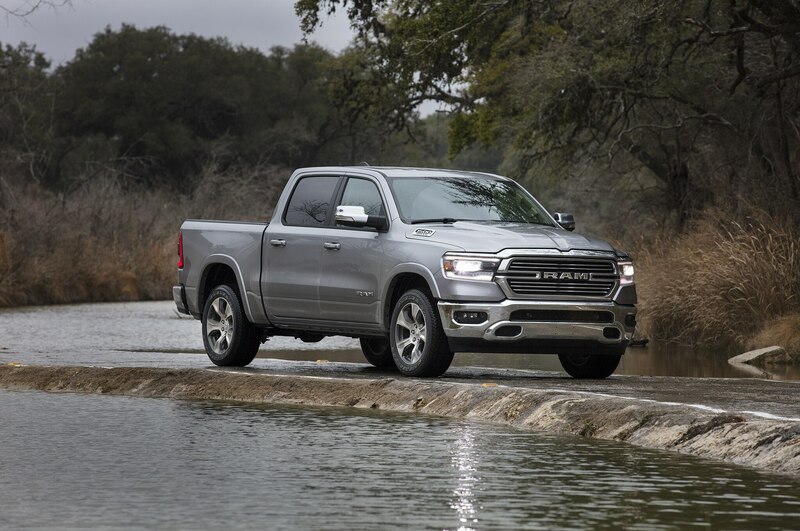 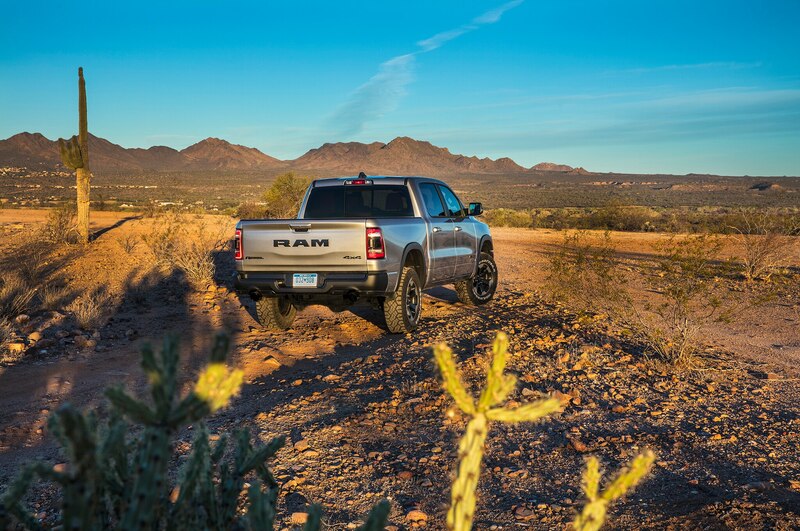 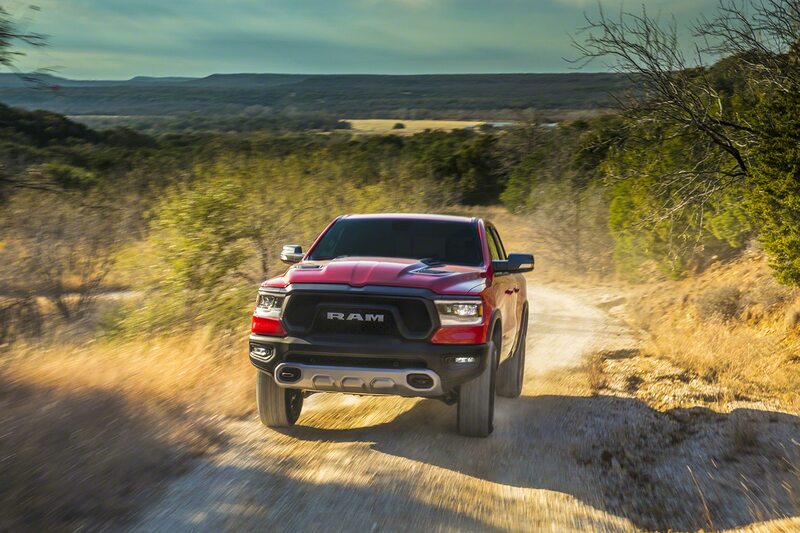 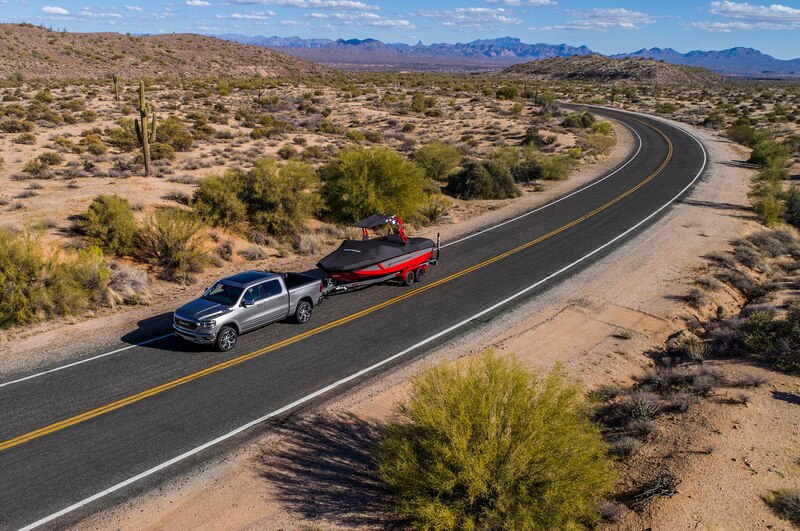 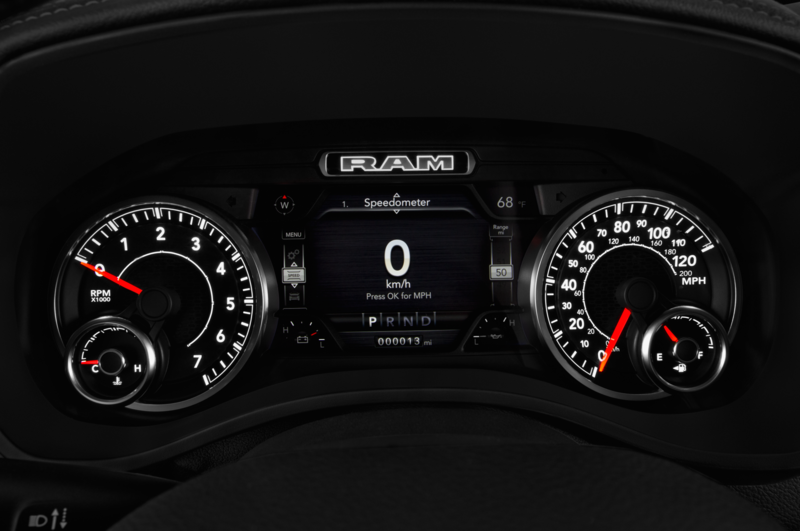 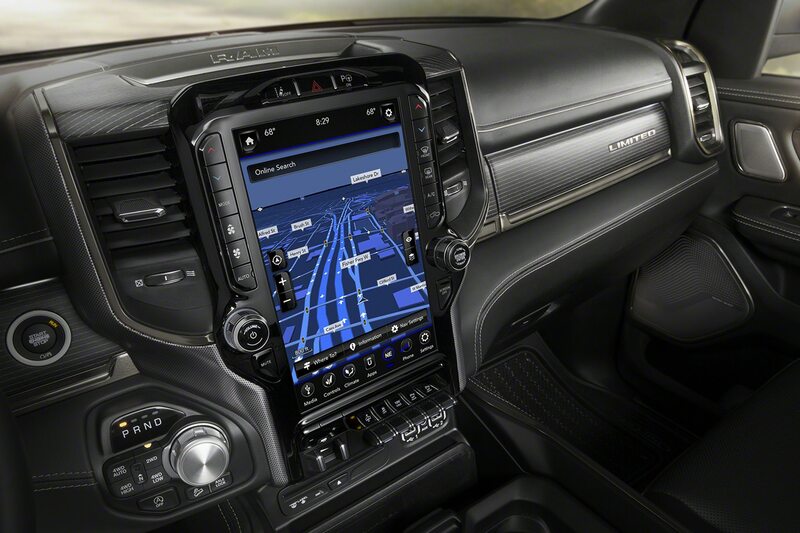 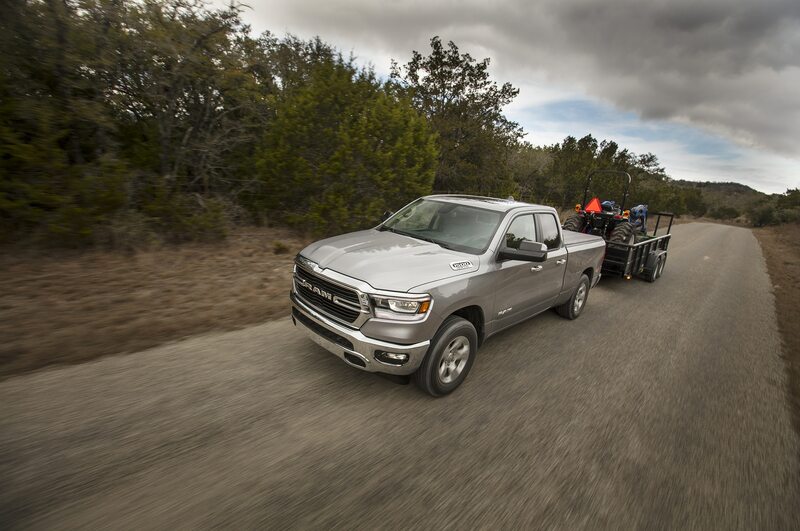 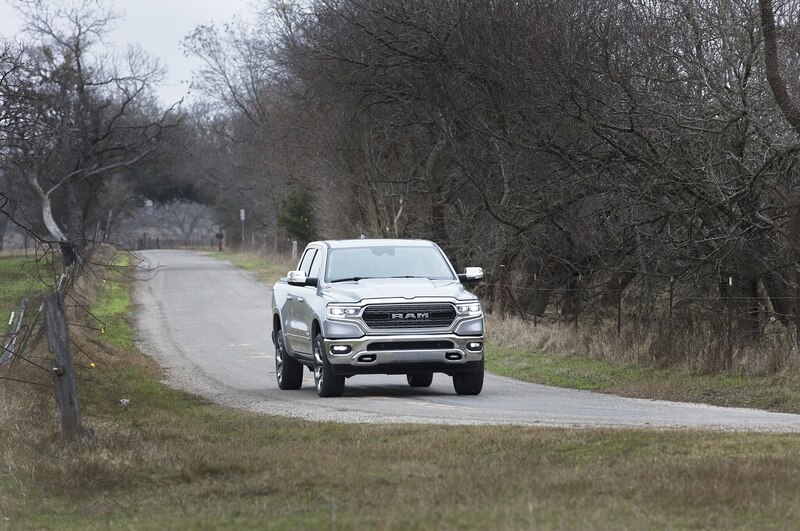 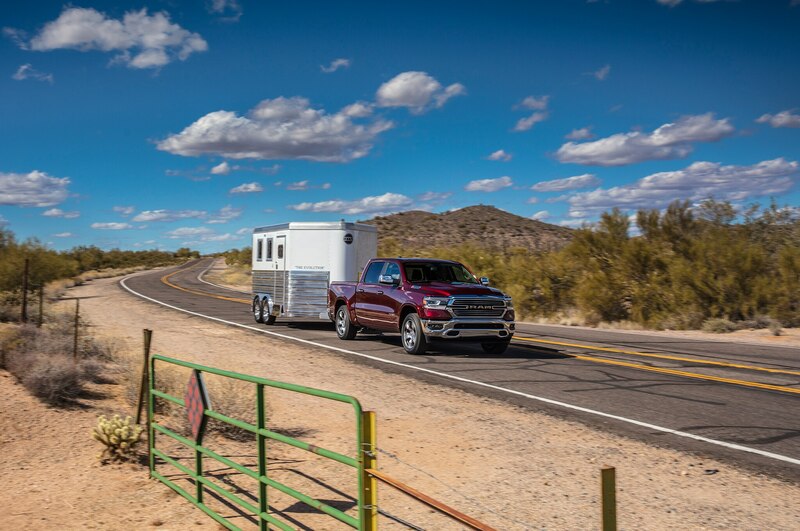 Ram claims more than 600 miles range for the Pentastar eTorque Ram, and more than 800 miles when equipped with the optional 33-gallon fuel tank, while the Hemi eTorque is said to top 750 miles range. 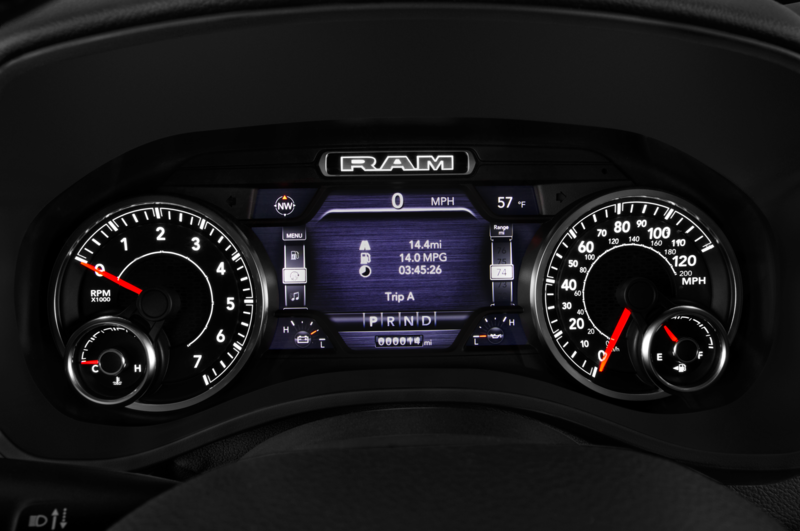 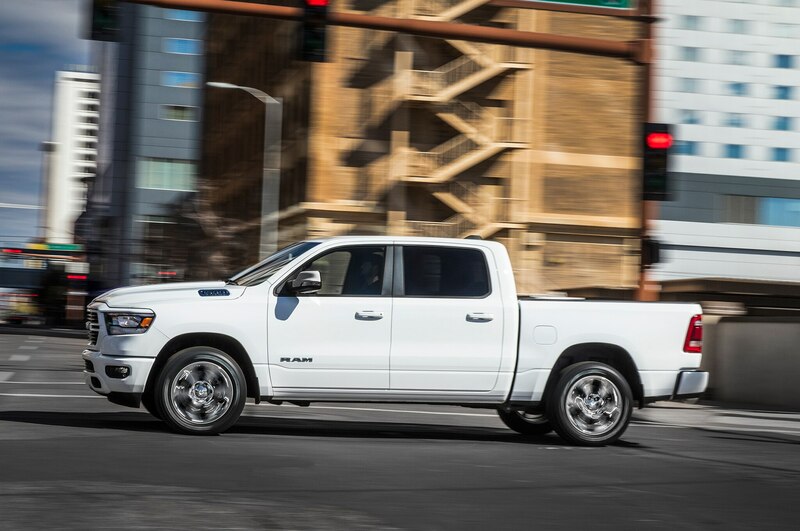 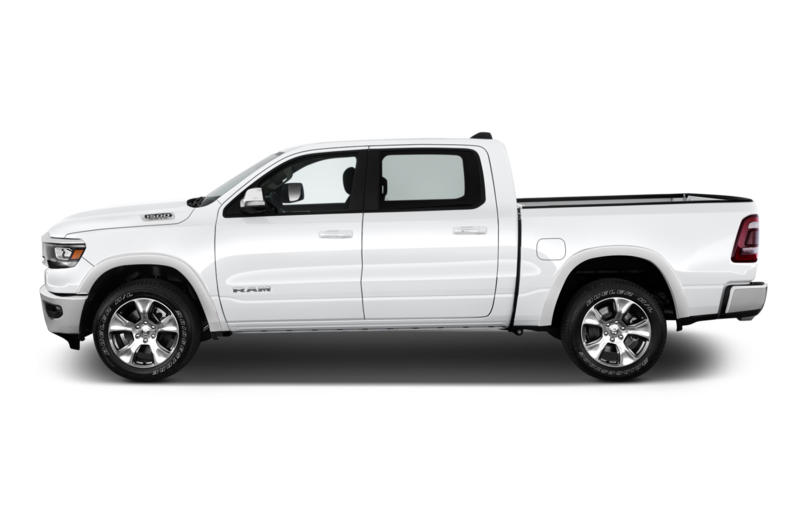 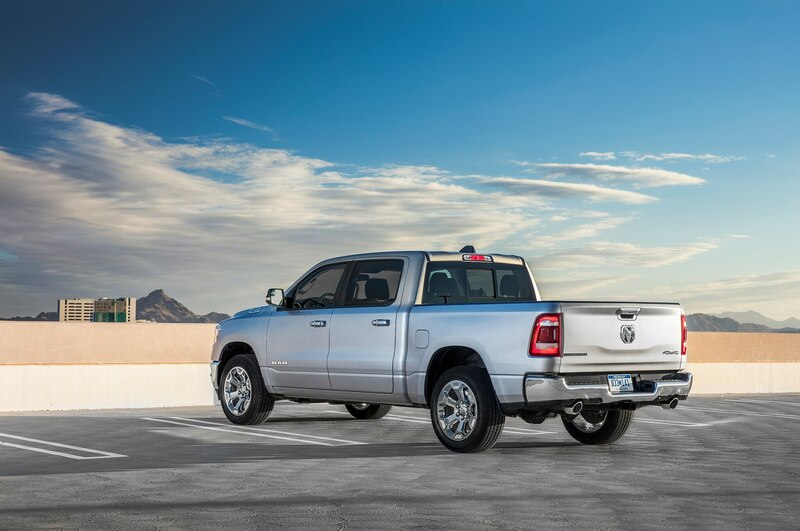 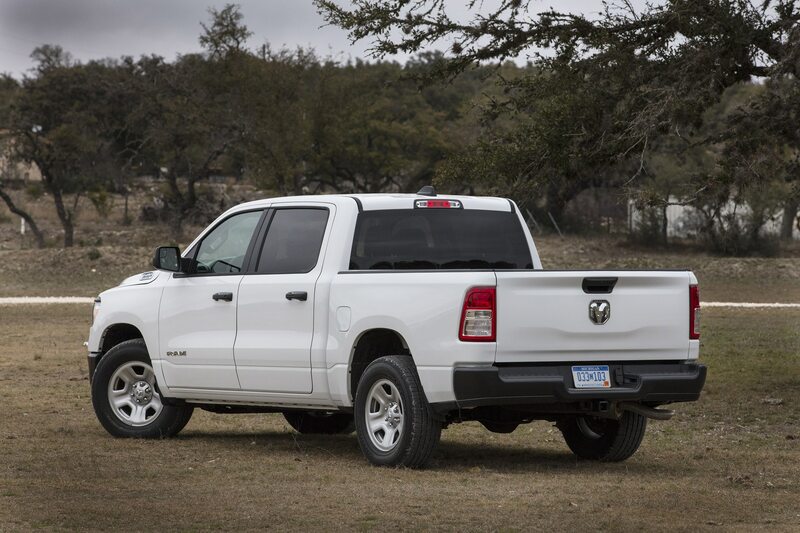 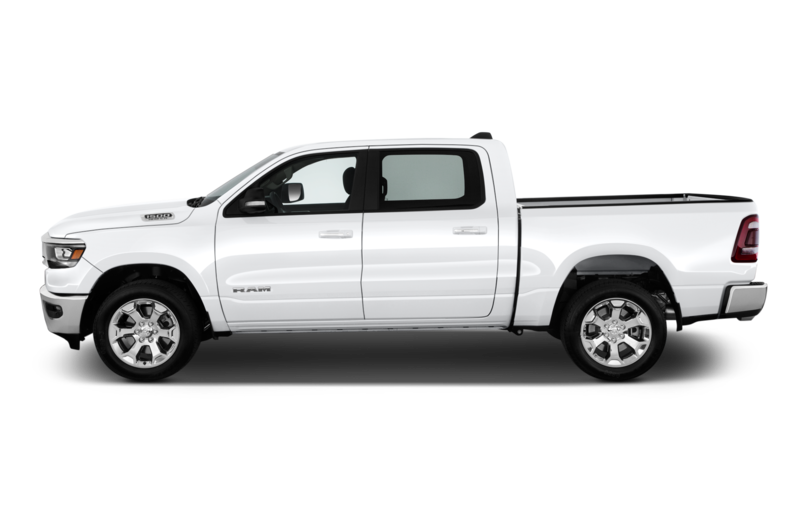 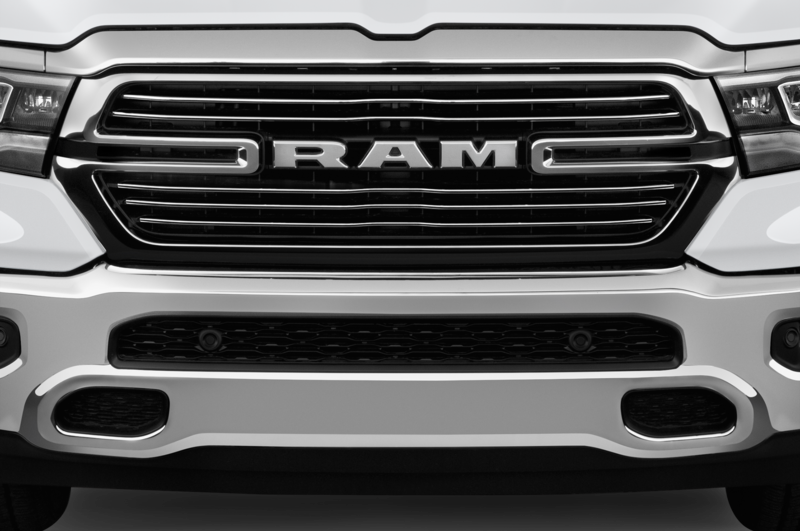 Keep in mind, too, that the Pentastar V-6 with eTorque is standard on all Ram 1500 pickups. 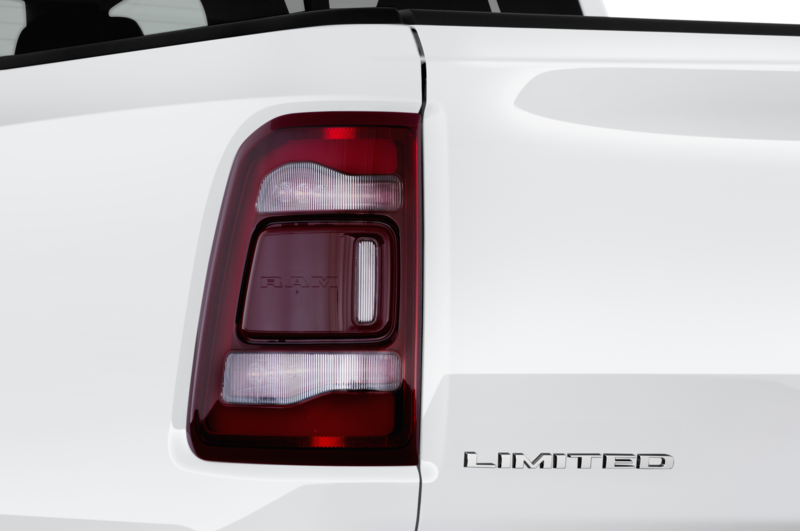 The gas-only Hemi option adds $1,195, and the Hemi with eTorque is $1,450 on top of that, making it a $2,645 option over the V-6, which probably doesn’t mean much to all the suburban cowboys buying pickups with $45,000+ MSRPs. 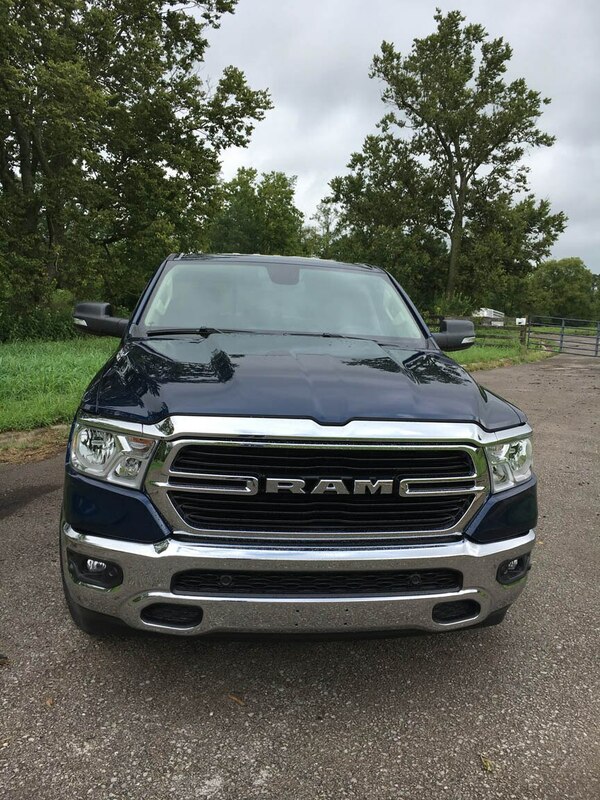 So we started our test drive through lush and verdant Kentucky horse country in the eTorque Hemi. 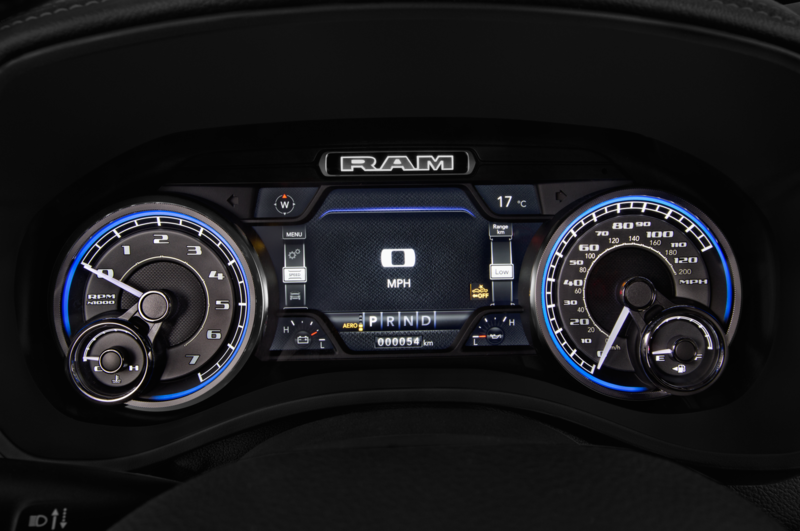 Though there’s just the slightest stop/start lag when you floor the throttle from a standing start, you’ll be impressed by that first, all-electric half-turn of the wheels. 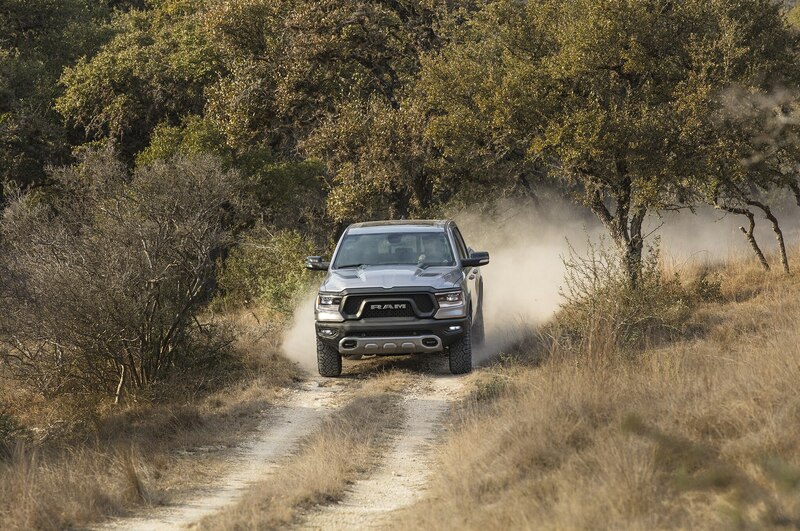 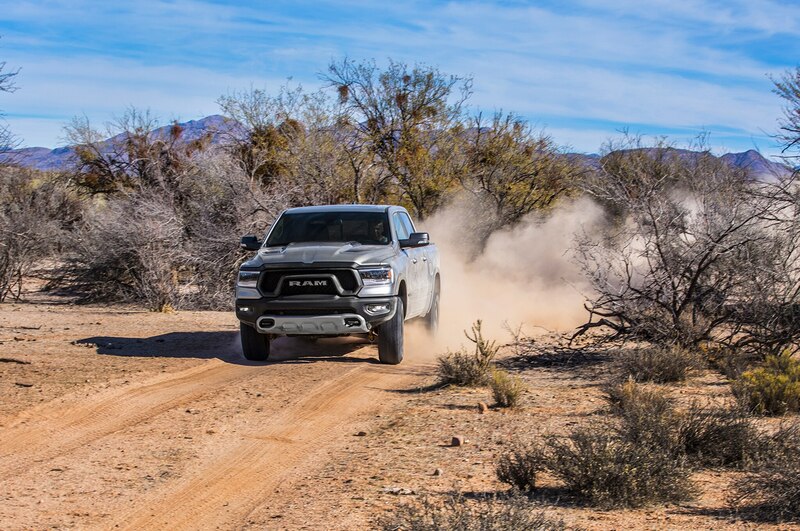 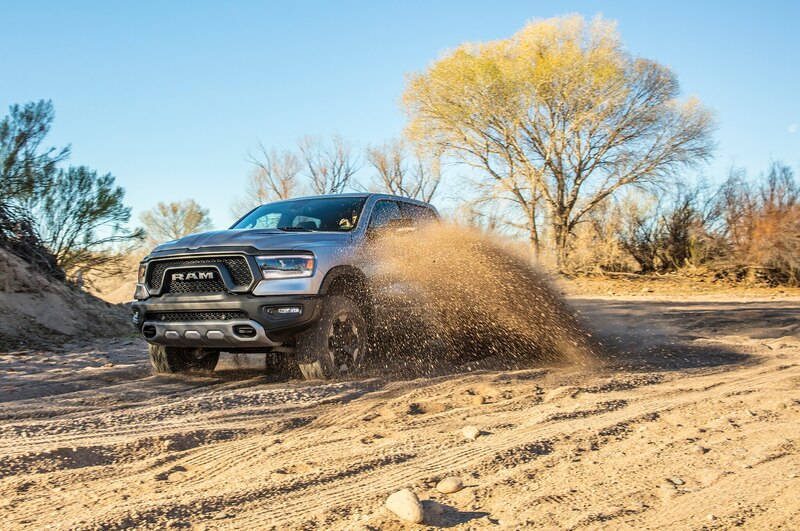 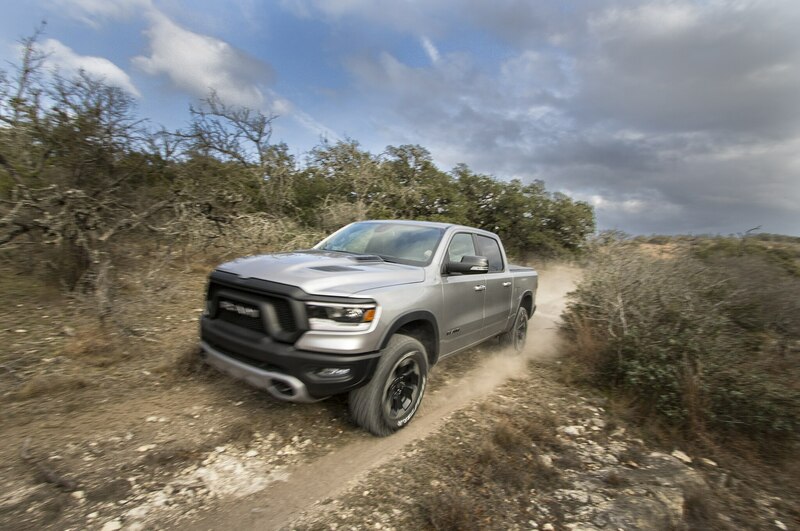 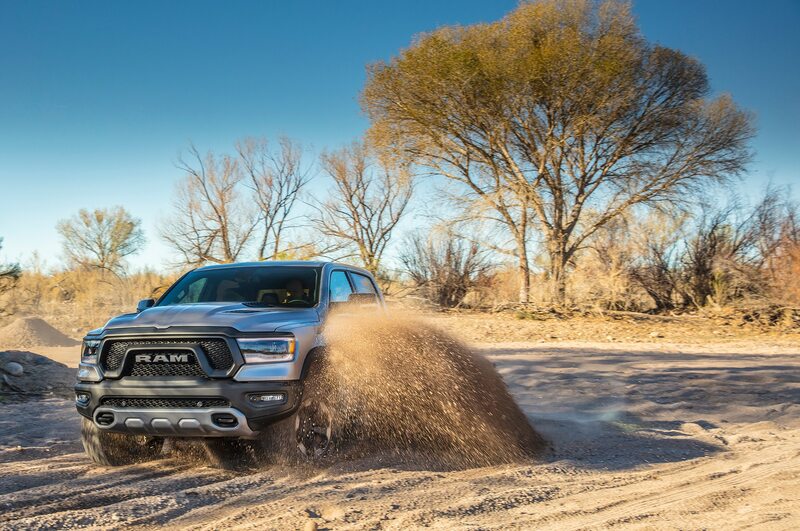 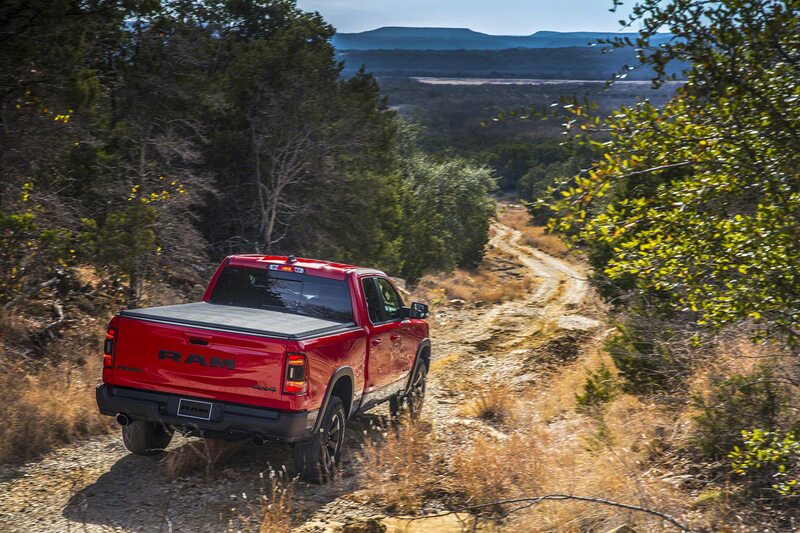 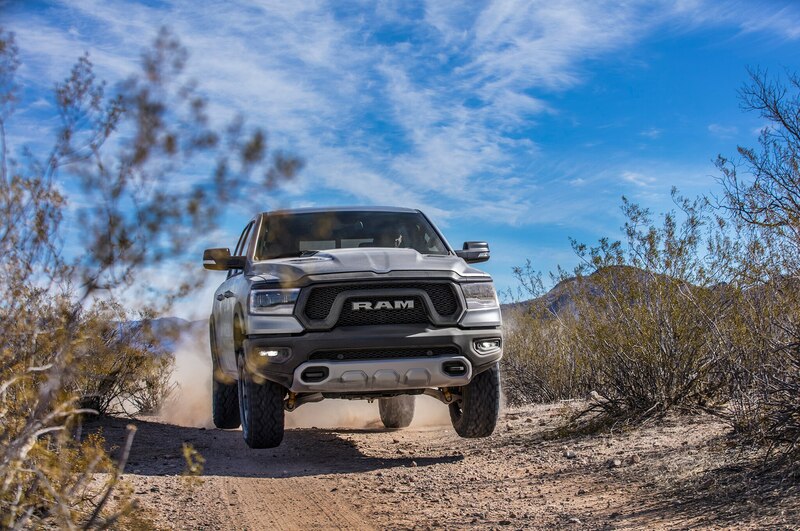 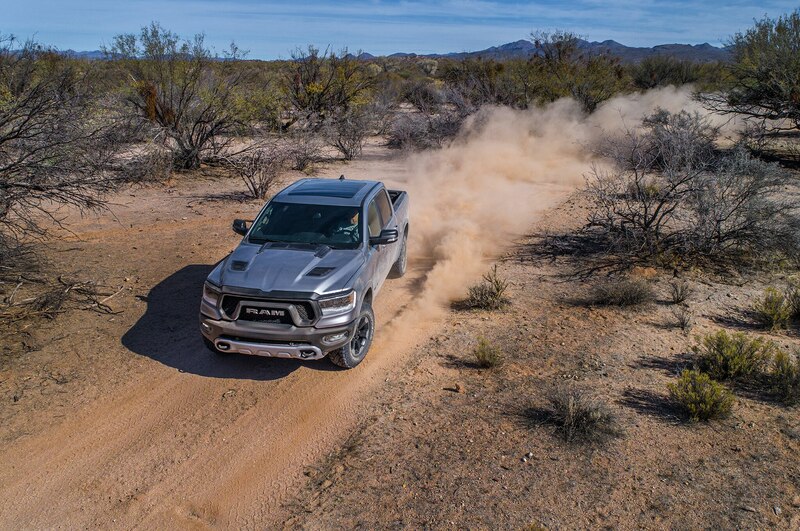 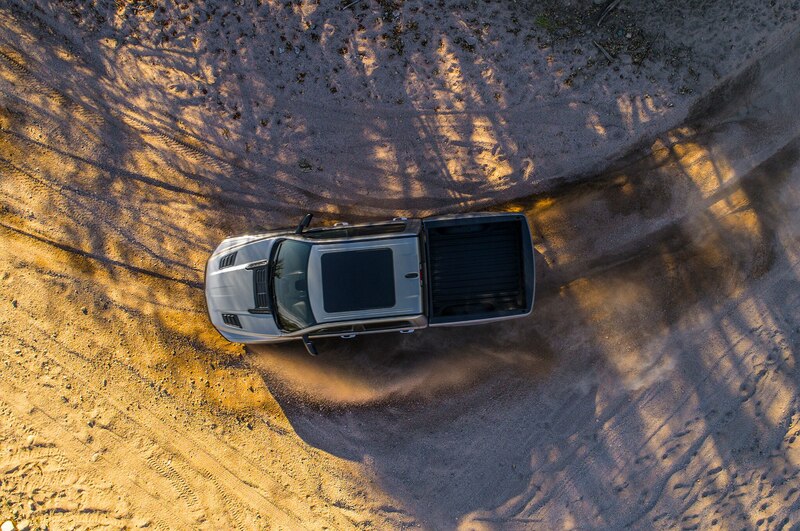 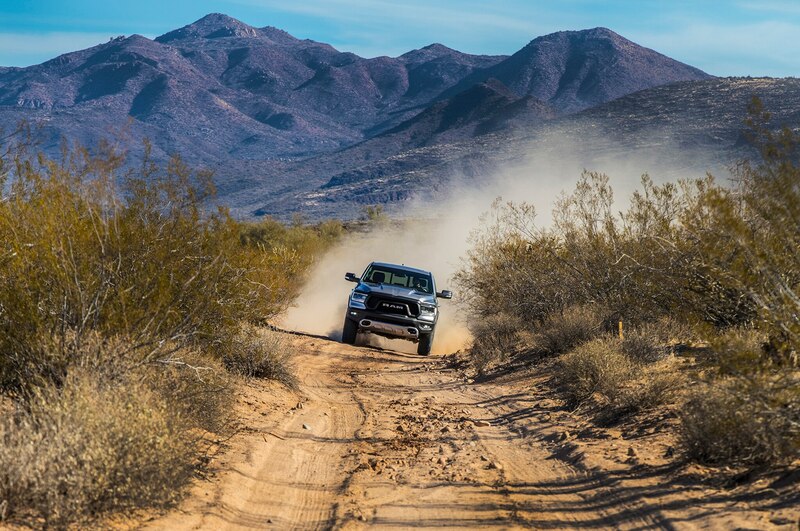 The 2019 Ram 1500 4WD eTorque V-8 feels like the match of, or quicker than, any V-8 pickup truck out there, other than high-performance models like the Ford F-150 Raptor. 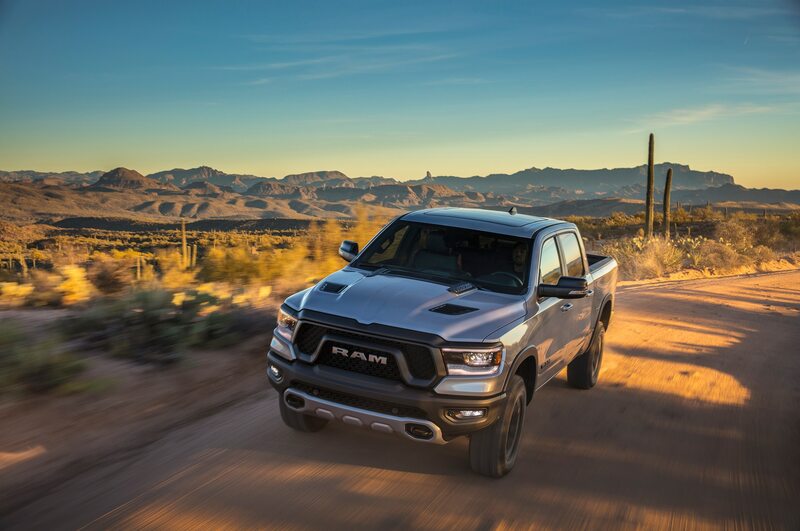 Order the eTorque Hemi, and you get all the thick torque throughout the range of a big V-8, with livable fuel efficiency without the diesel guilt. The whole truck is pretty impressive, especially among those of us who don’t desire having one as a daily driver. 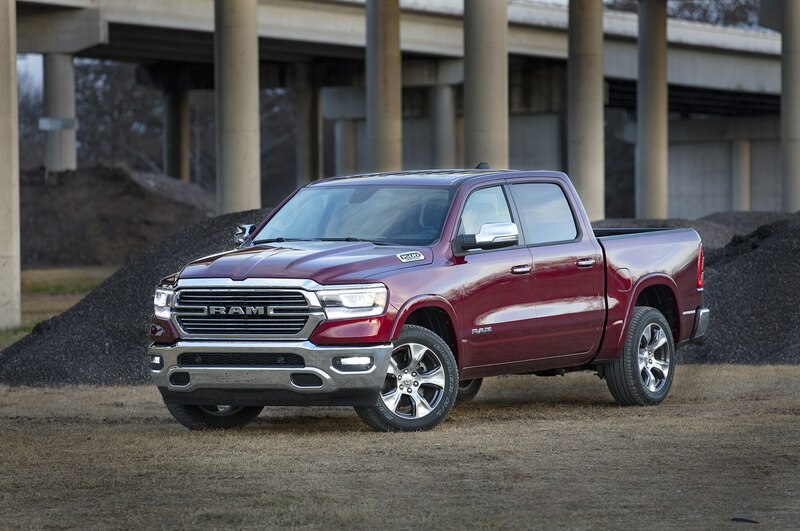 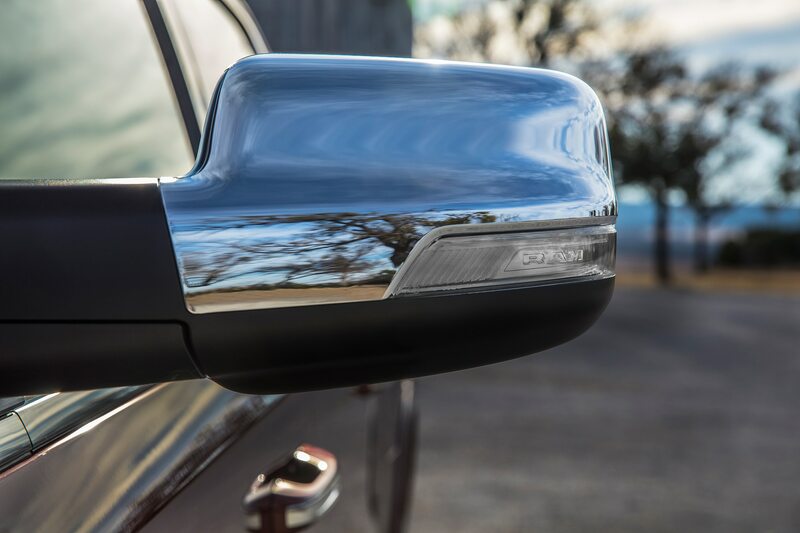 Though the usual urban parking issues can’t be overcome, the ’19 Ram 1500 drives a bit smaller than it is, and it’s significantly smoother than the competition. 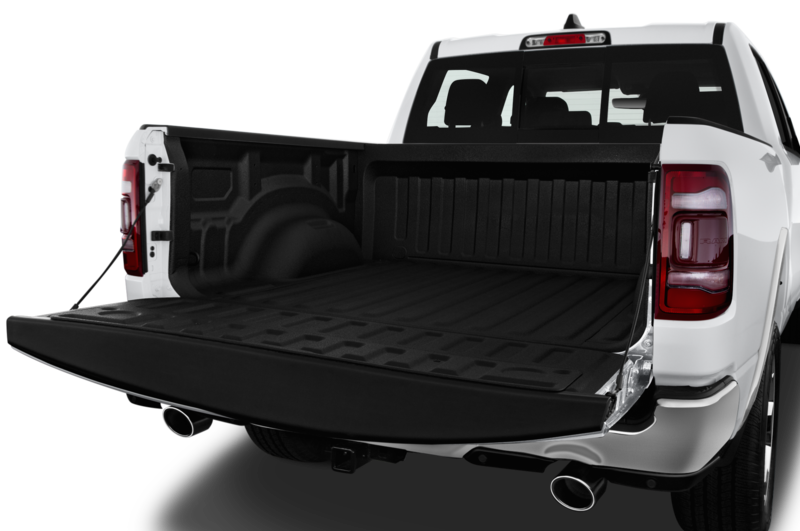 There was no detectable rear-wheel judder with an empty cargo box and under heavy throttle application. 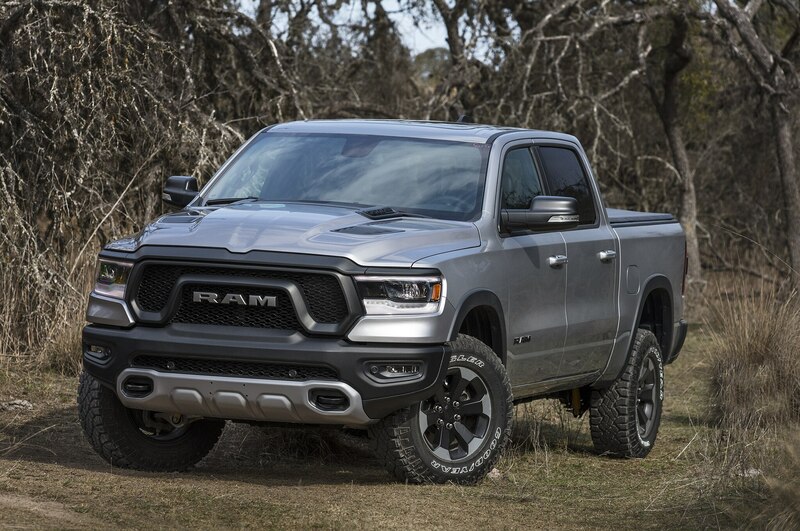 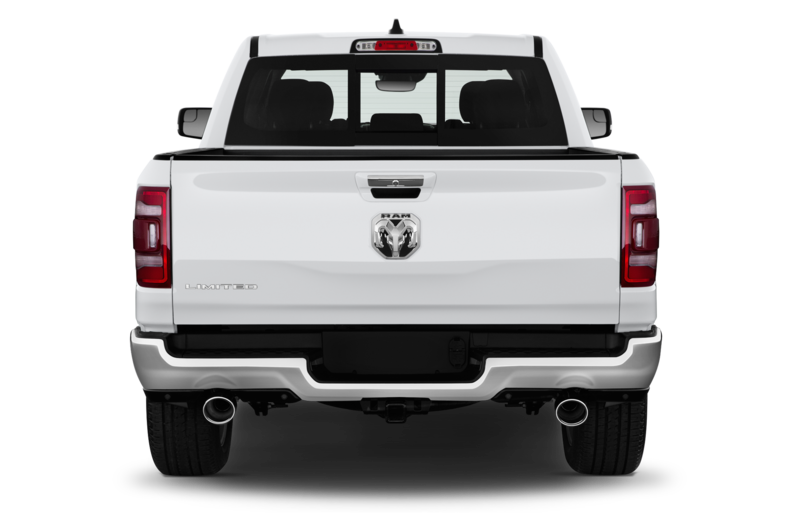 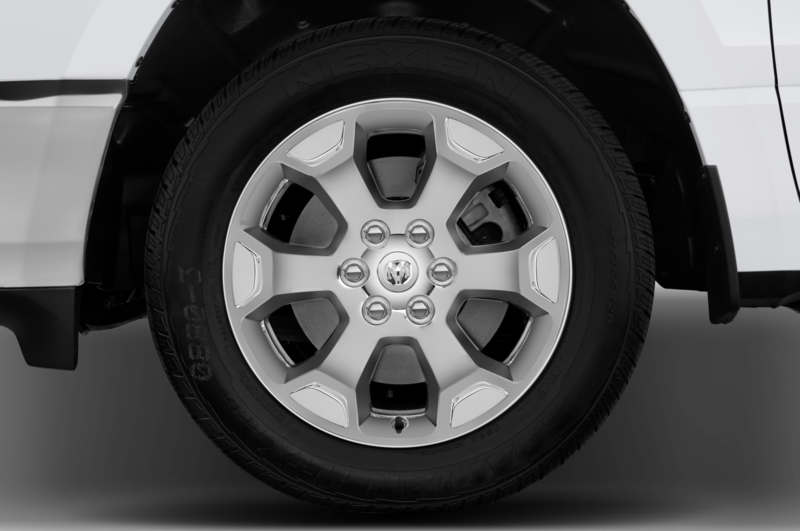 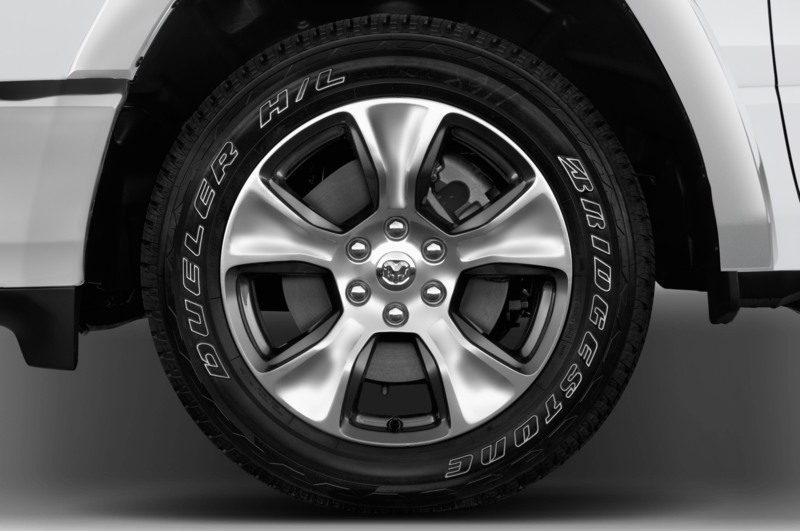 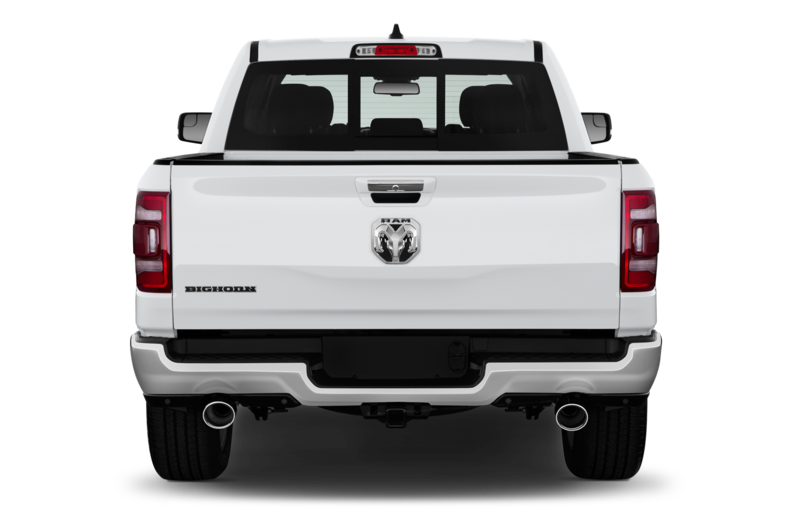 Credit the coil-spring rear suspension, which Ram has had for several years now, while everyone else sticks with leaf springs last updated in the Conestoga era. 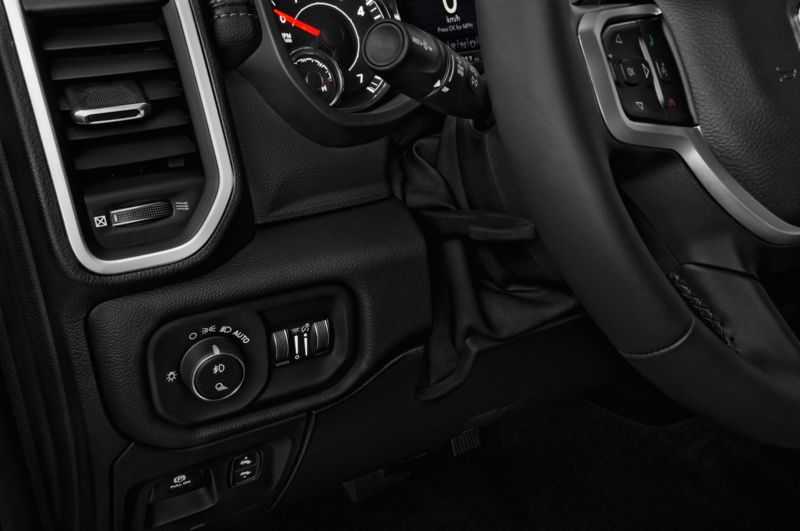 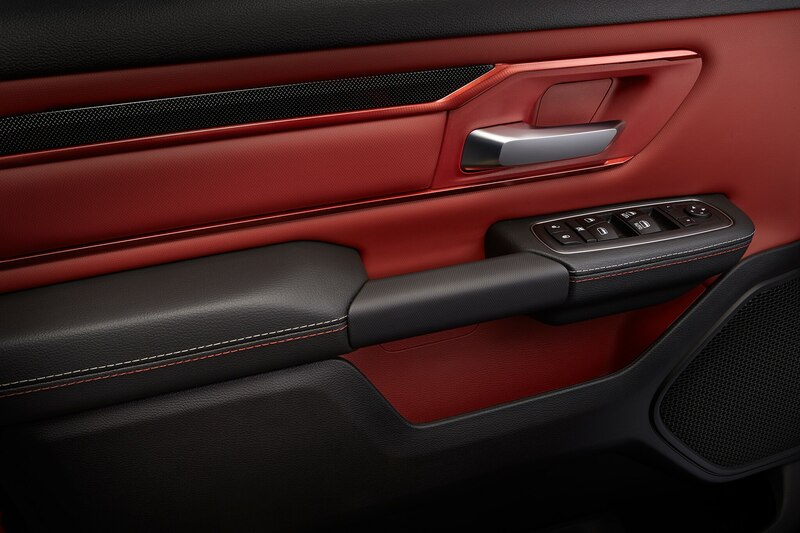 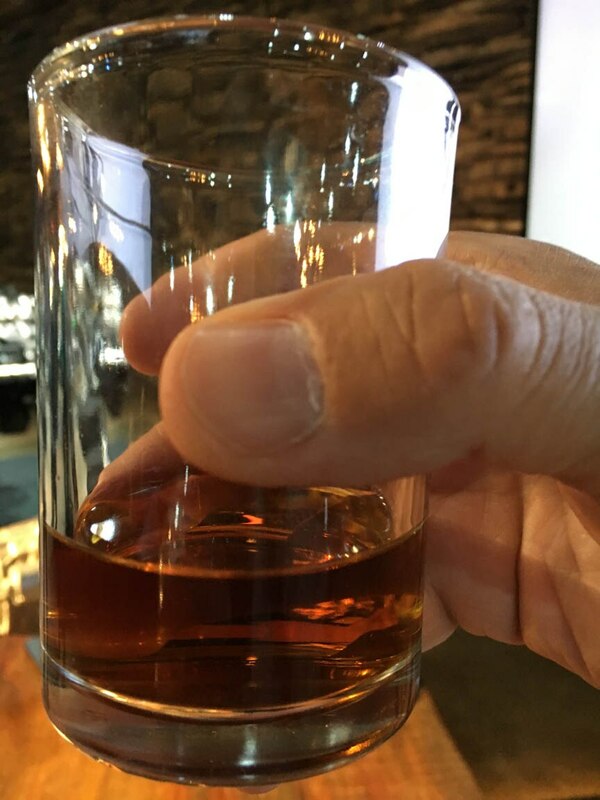 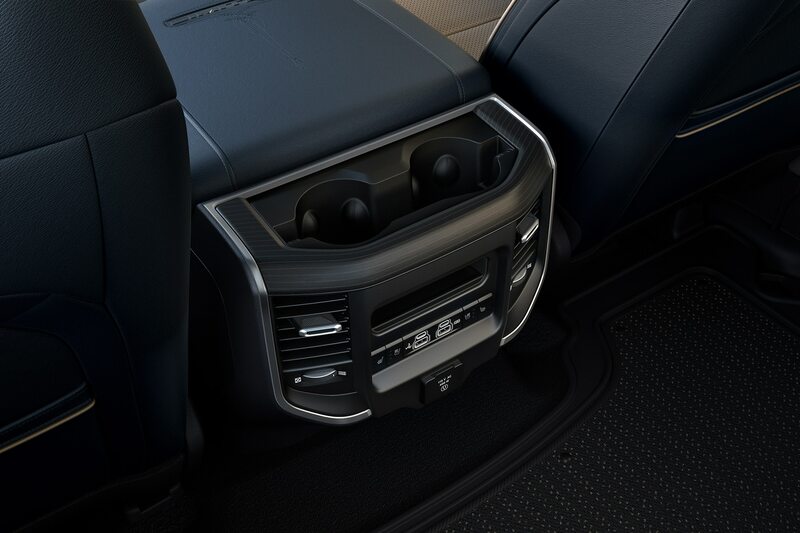 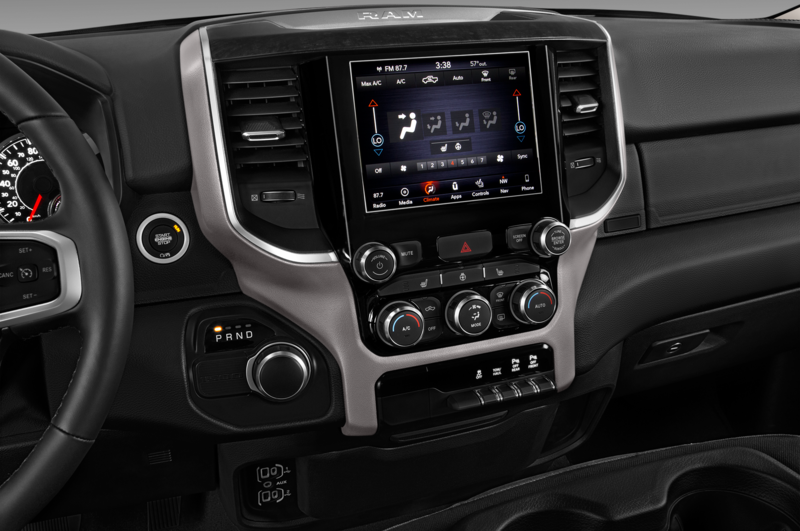 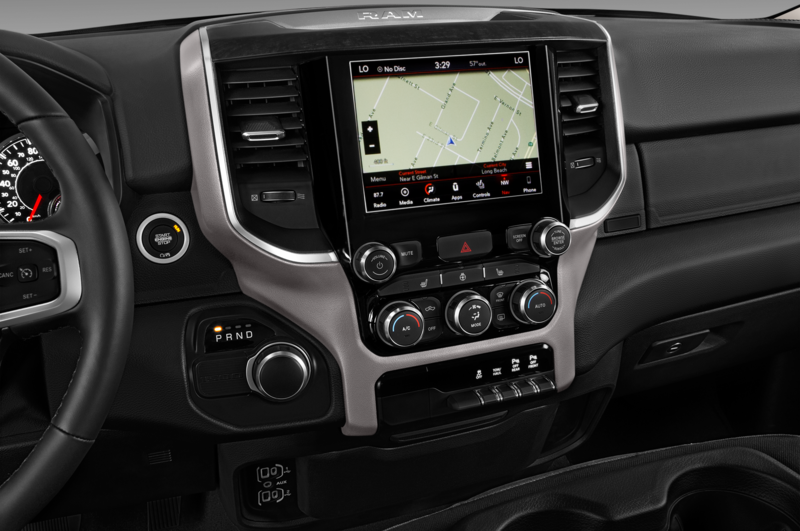 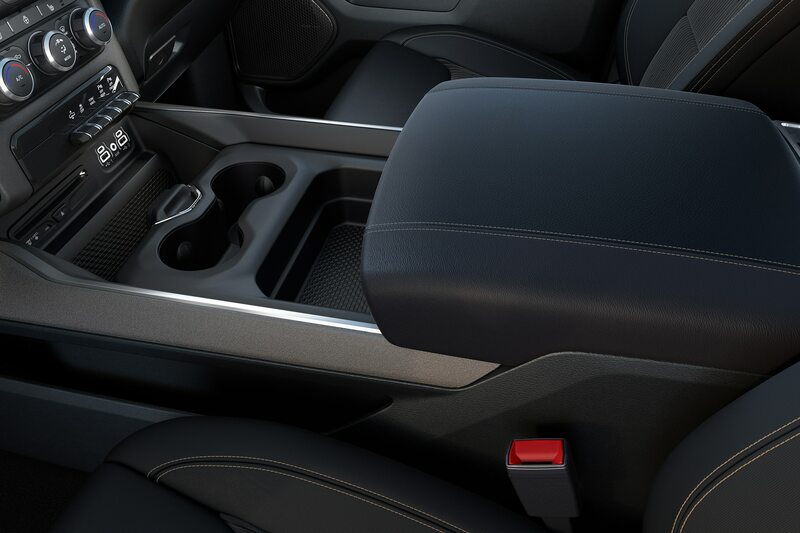 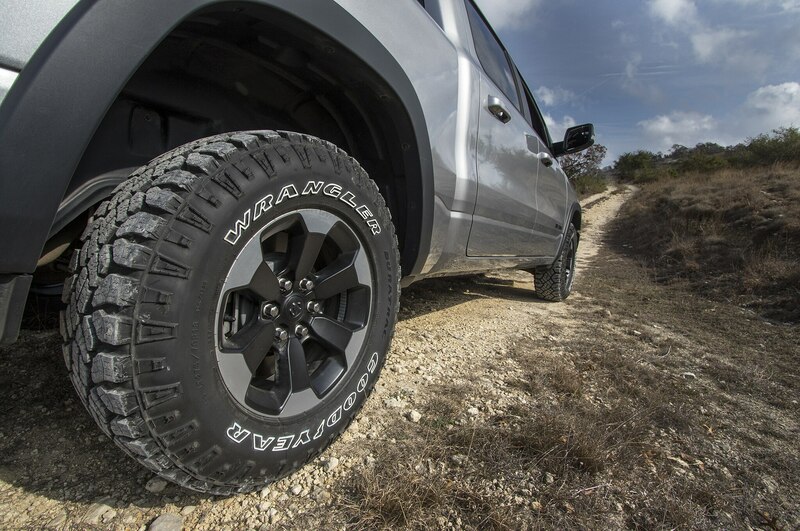 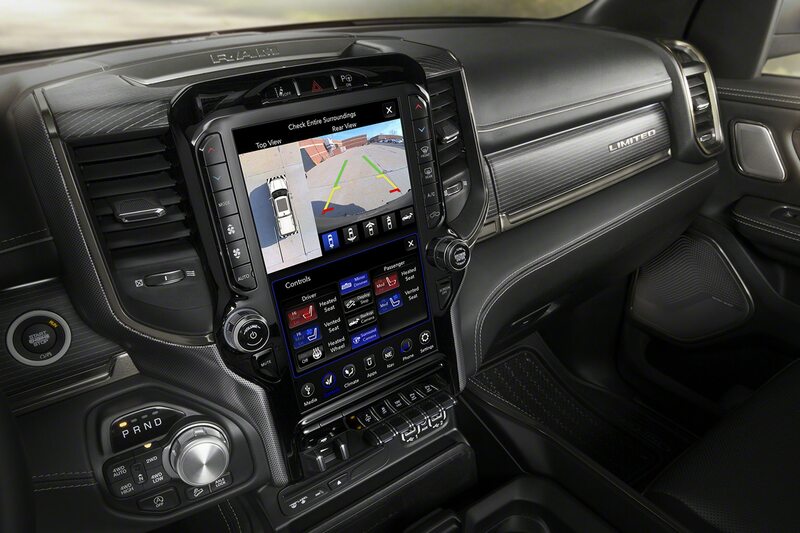 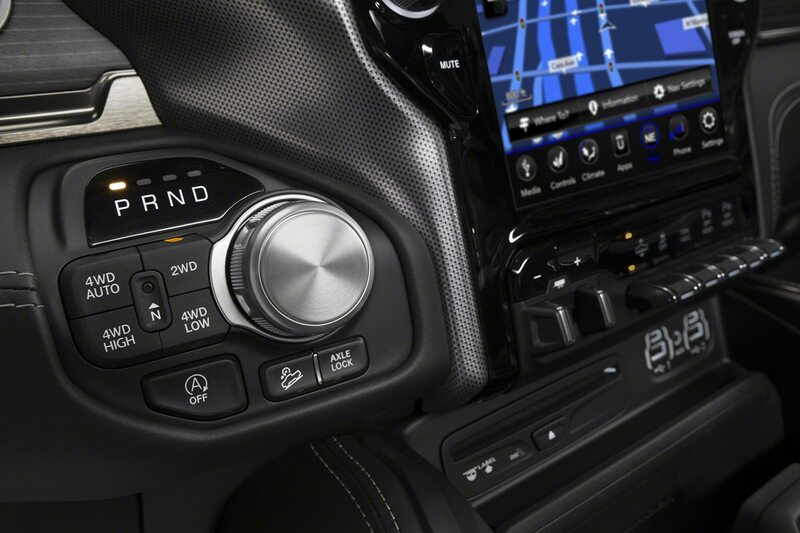 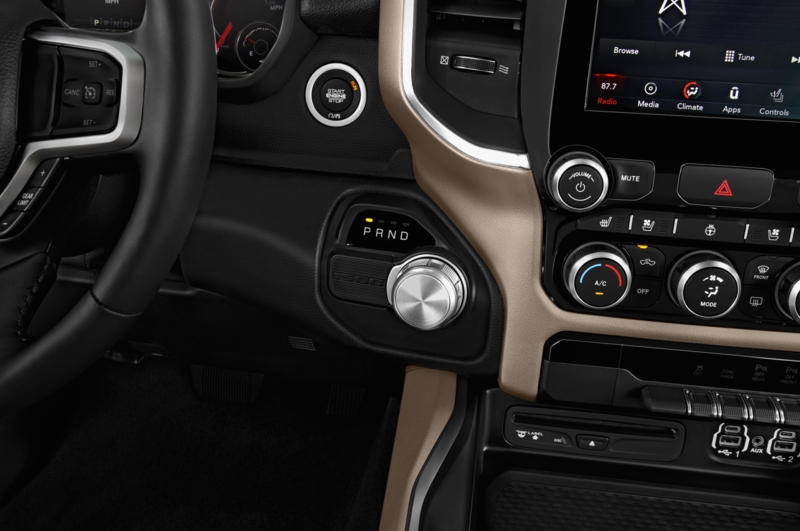 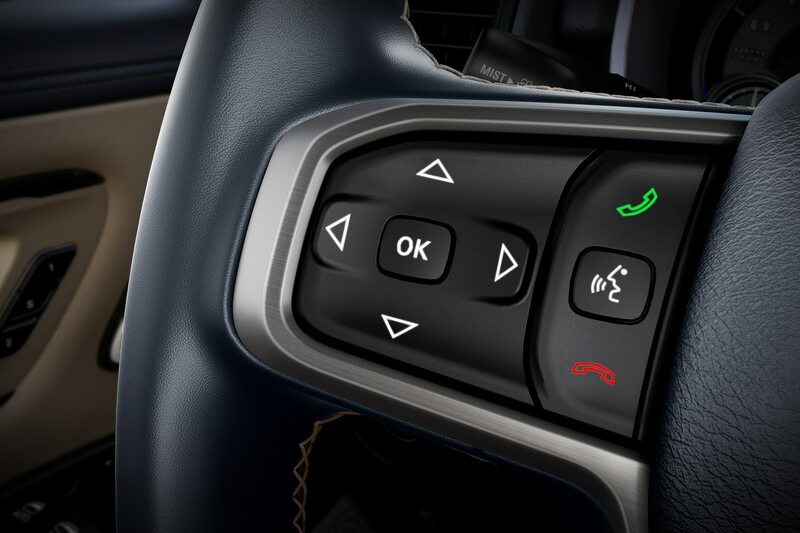 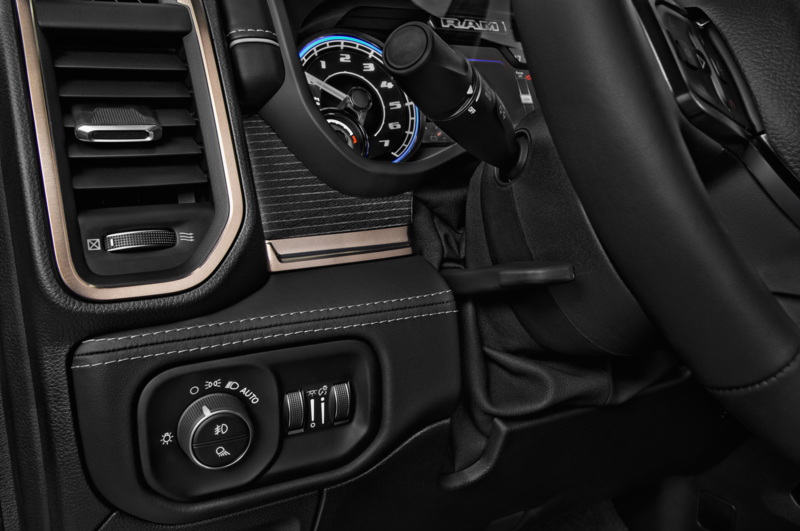 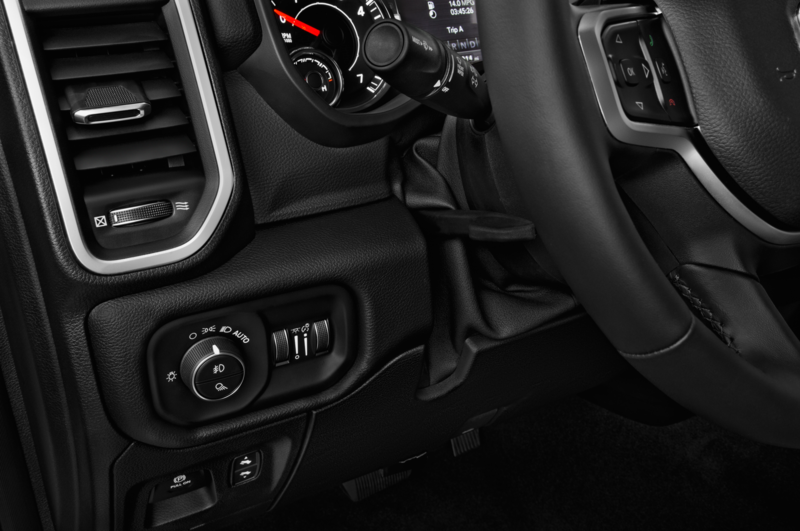 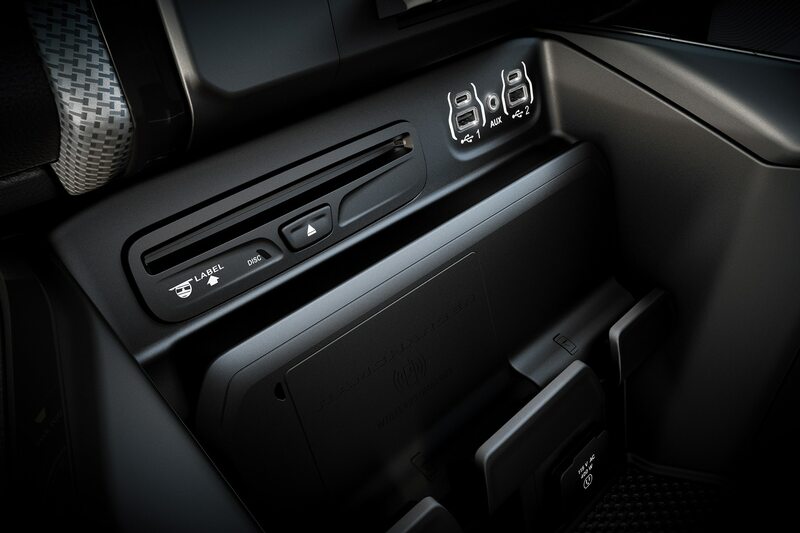 For the ’19 model, the steering gear is all new, and its precision and feedback feels as good as any big truck’s. 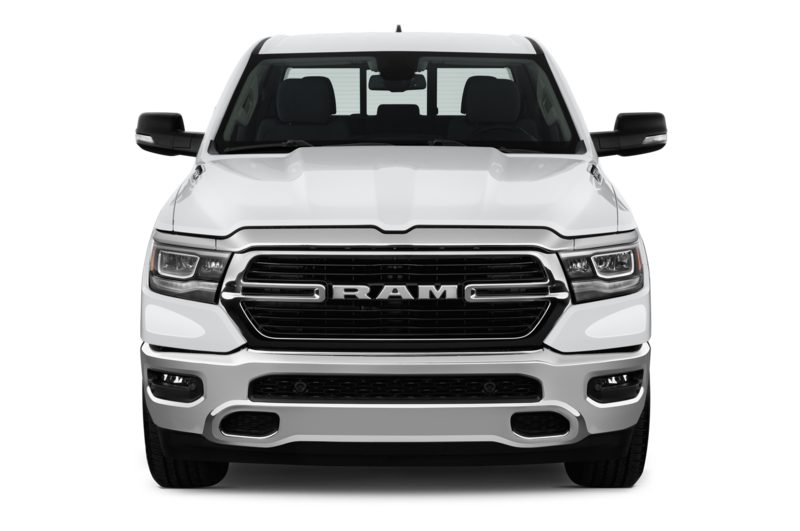 A canister off each front side of the frame counters cylinder deactivation vibration (and it worksyou can’t feel cylinder shut-off). 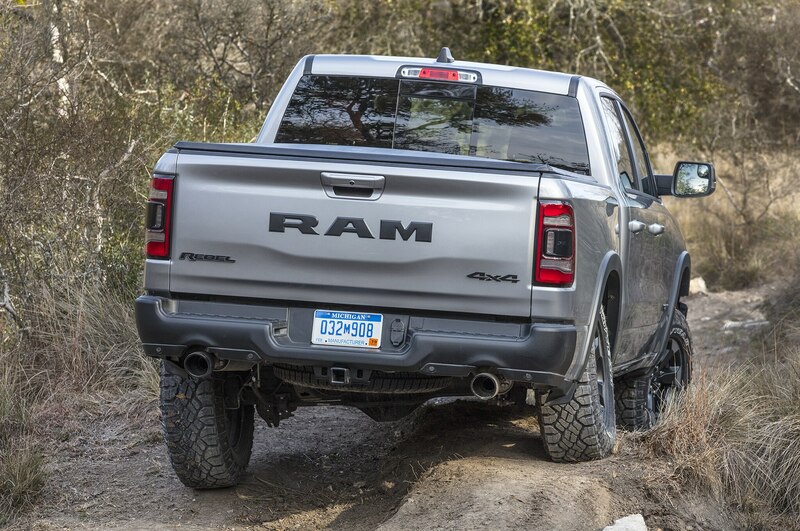 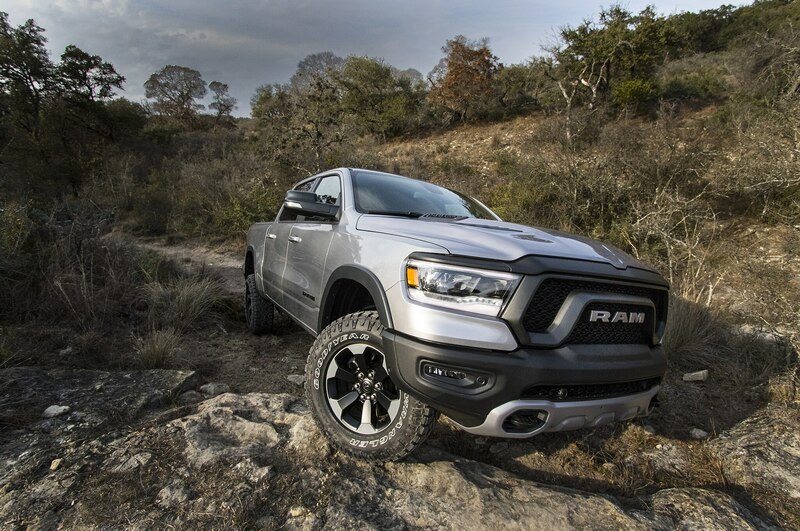 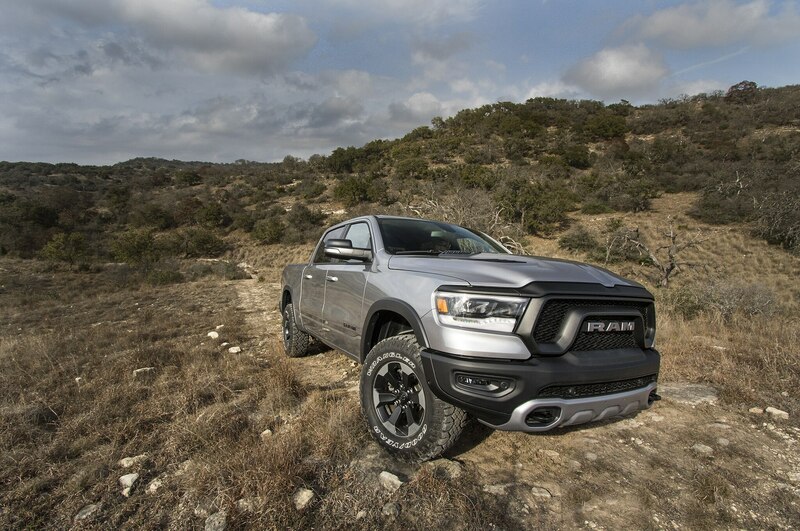 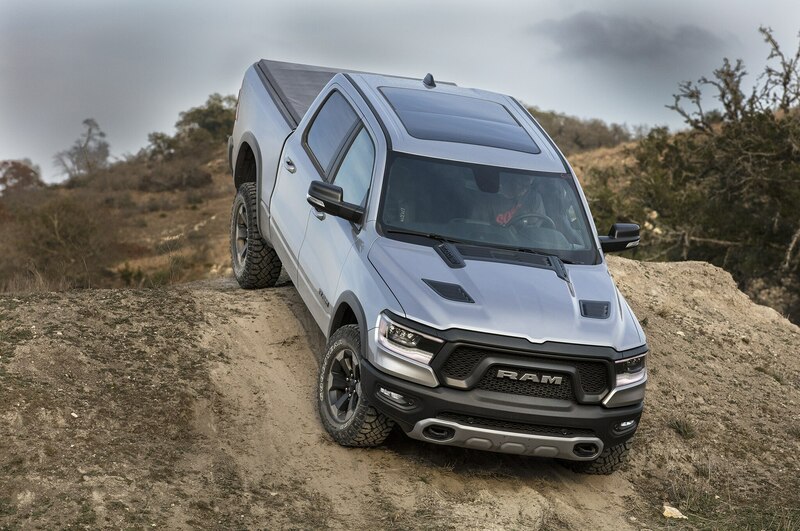 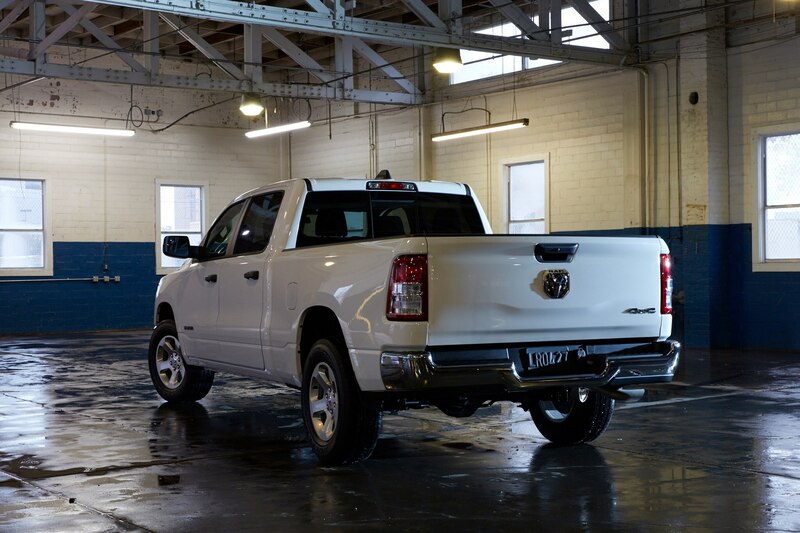 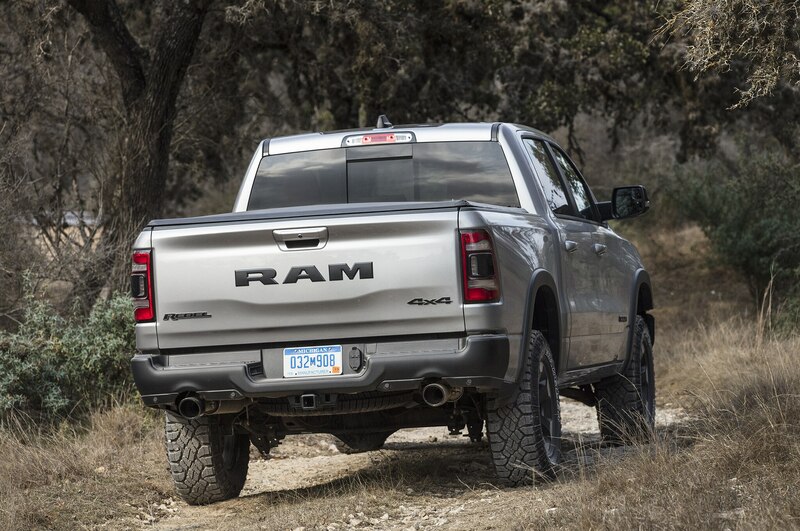 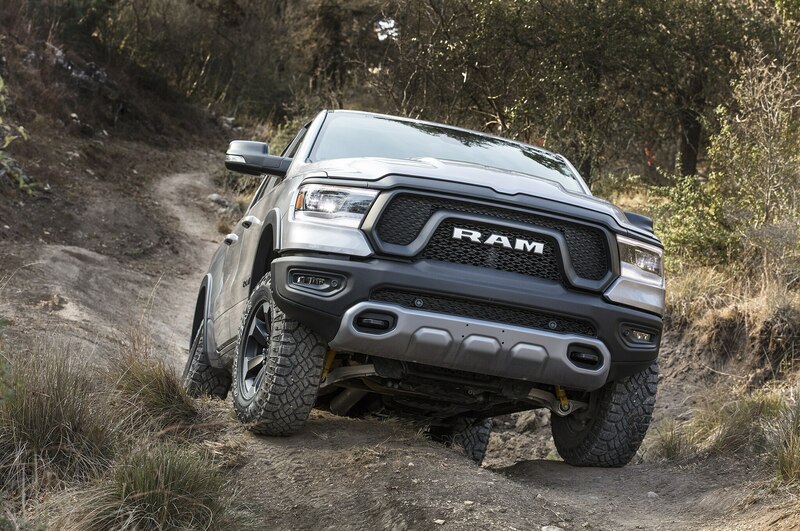 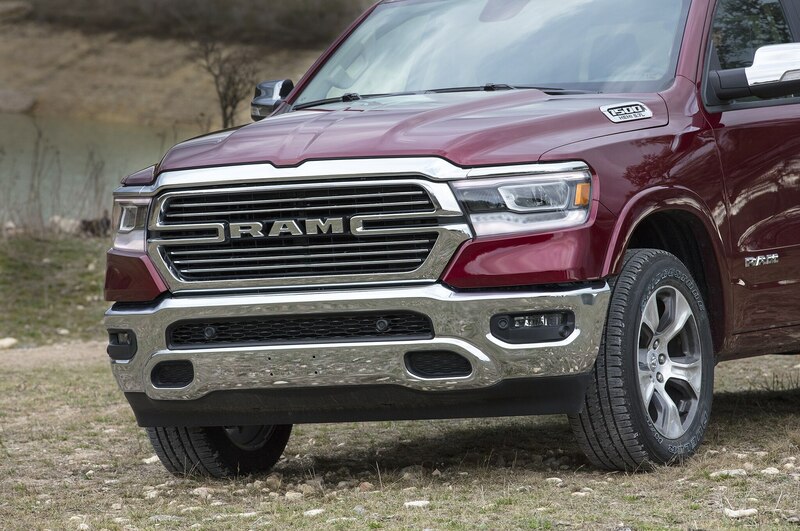 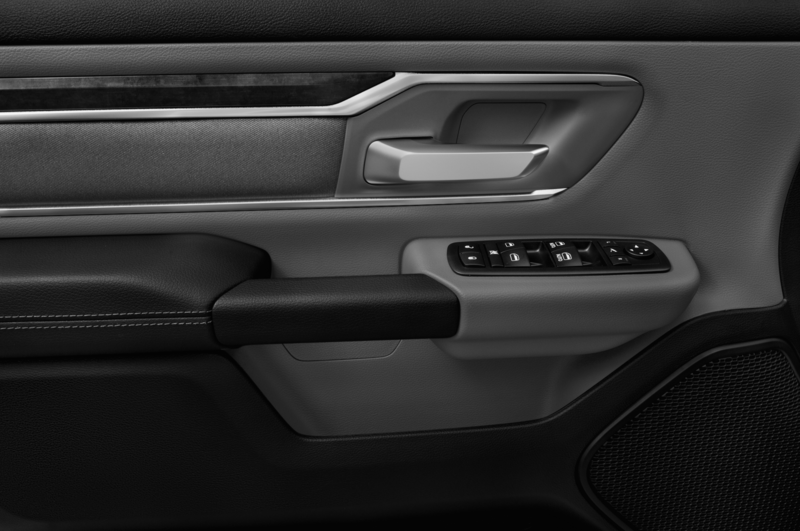 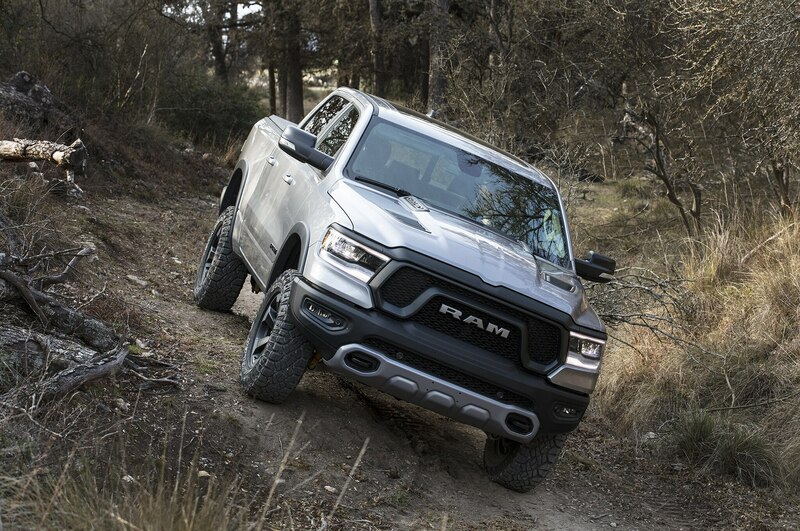 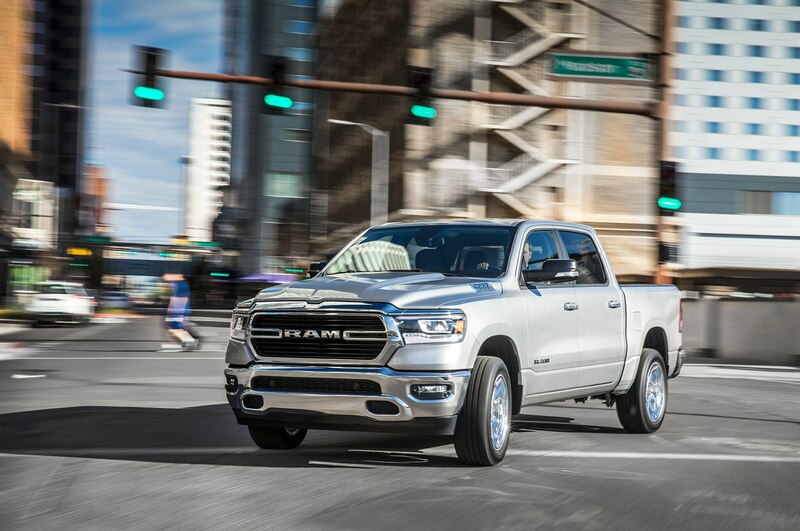 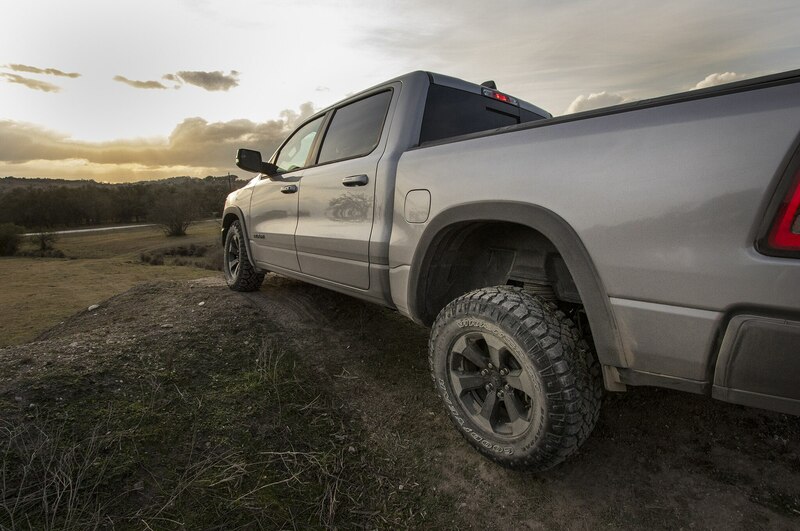 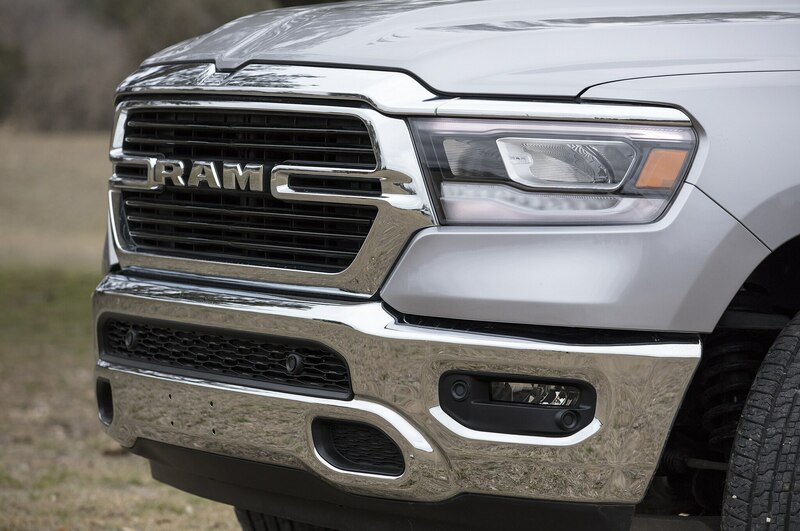 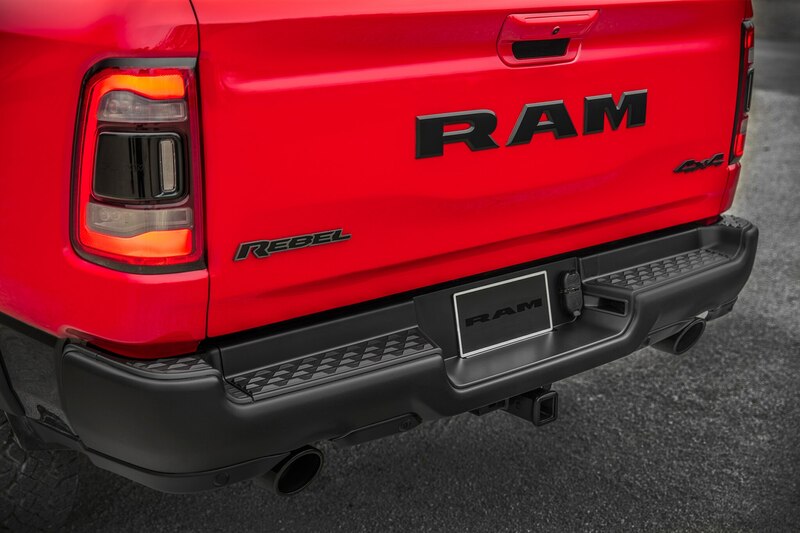 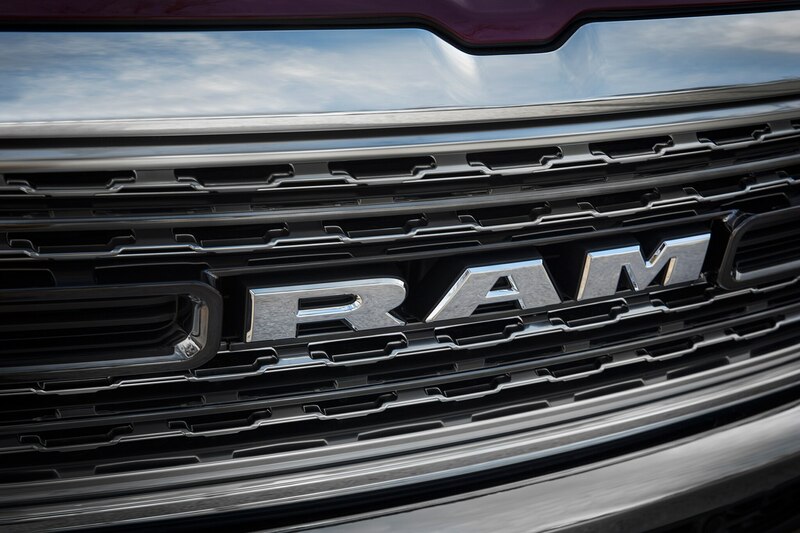 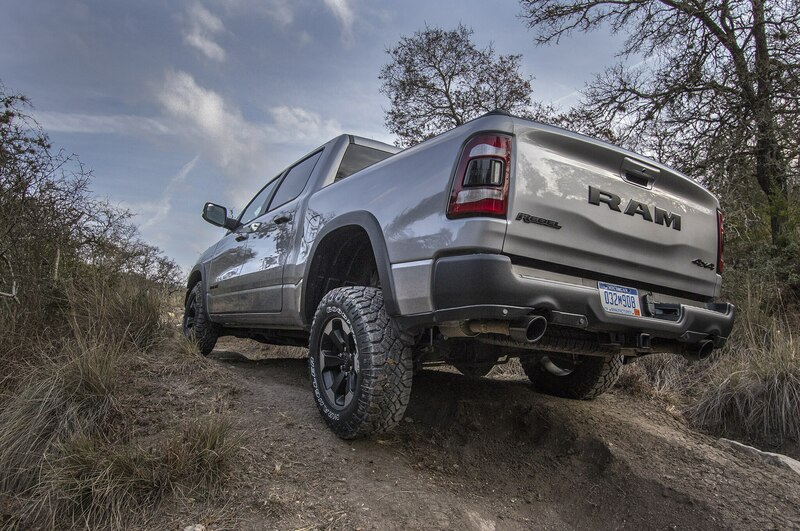 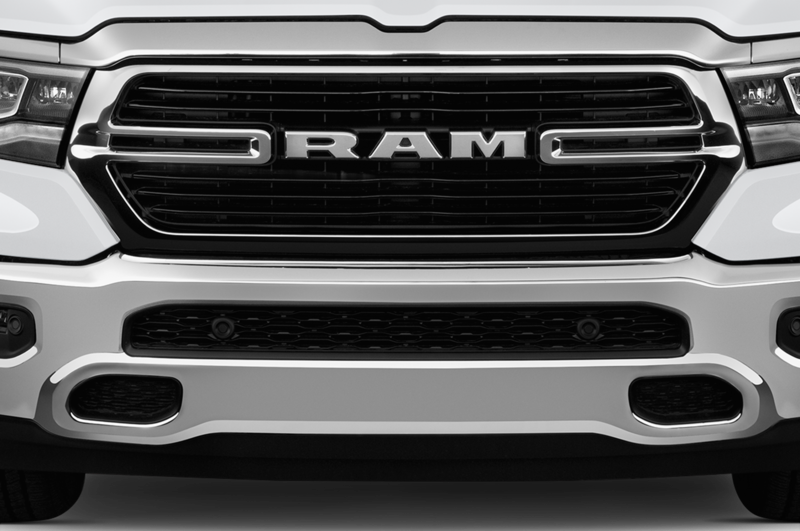 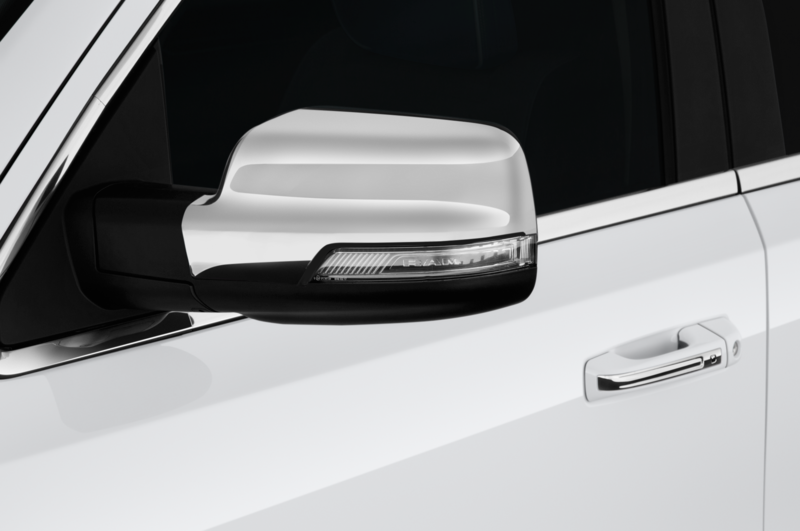 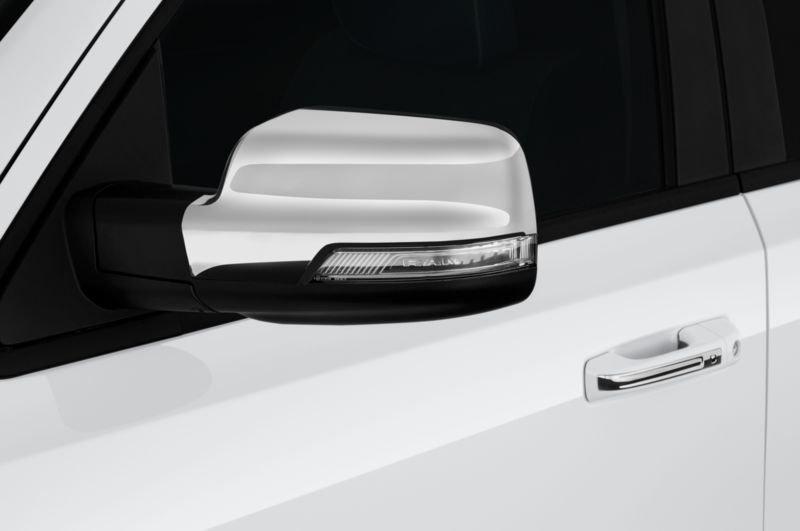 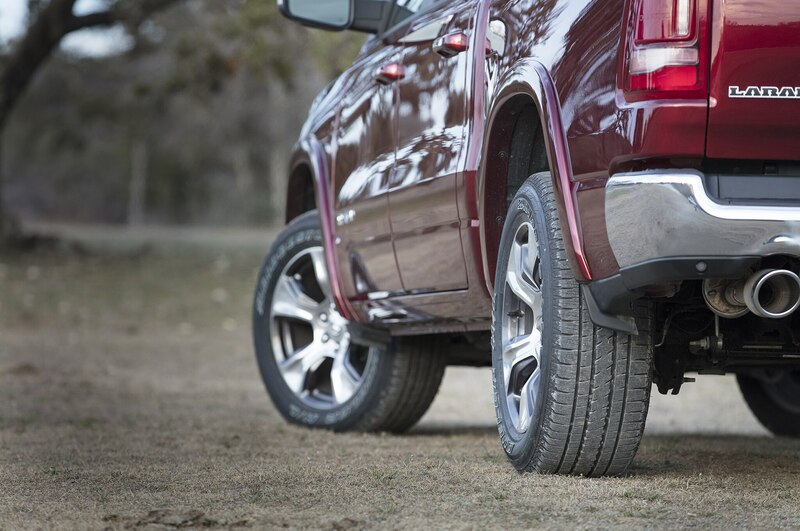 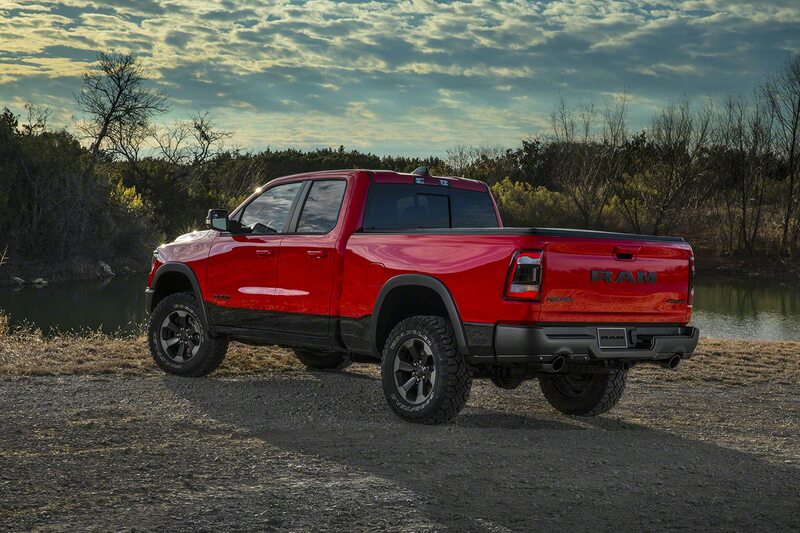 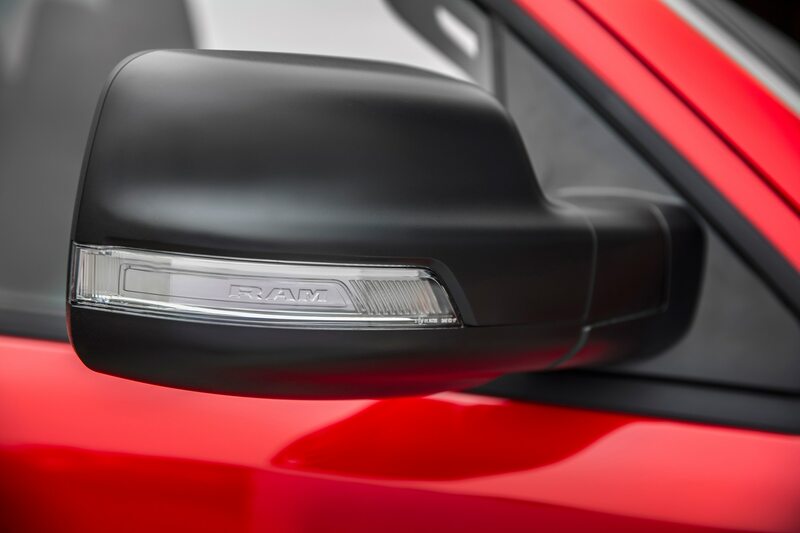 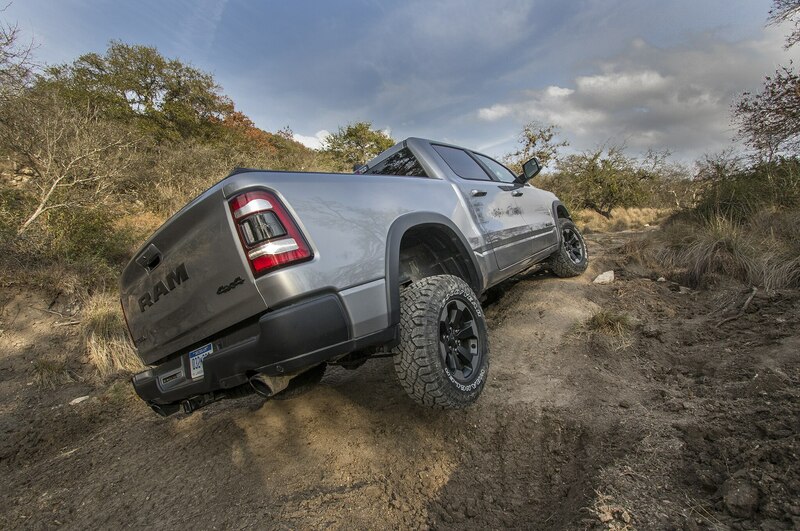 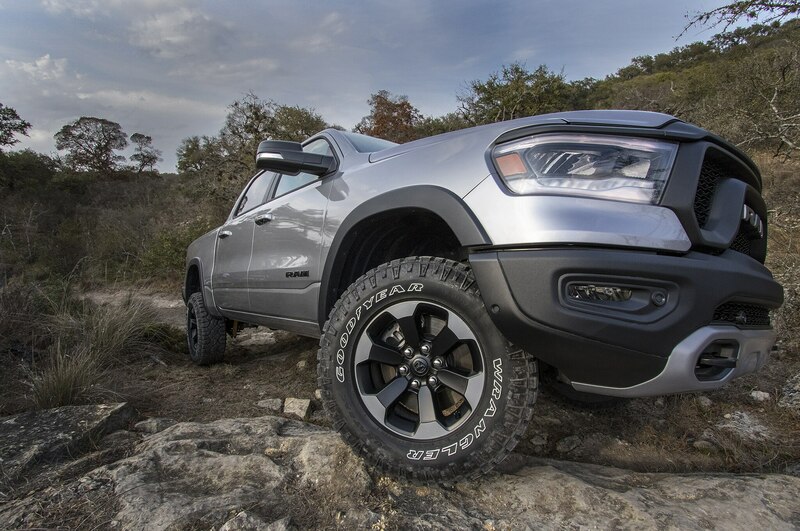 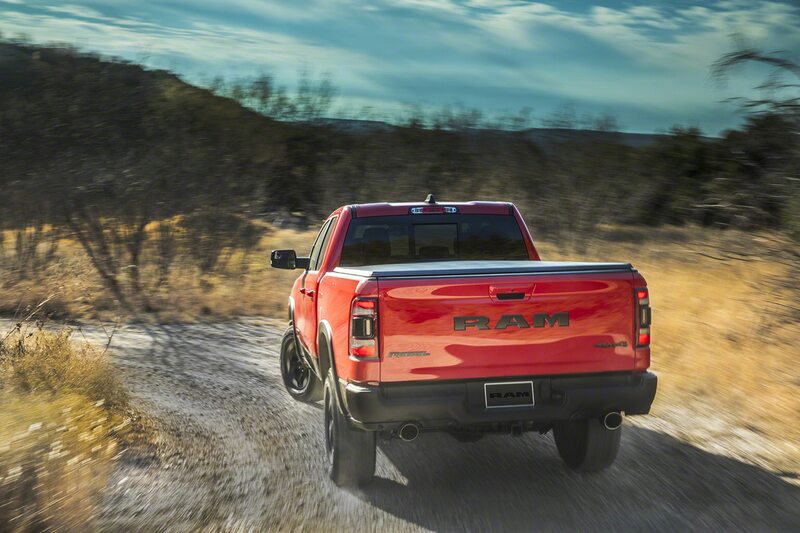 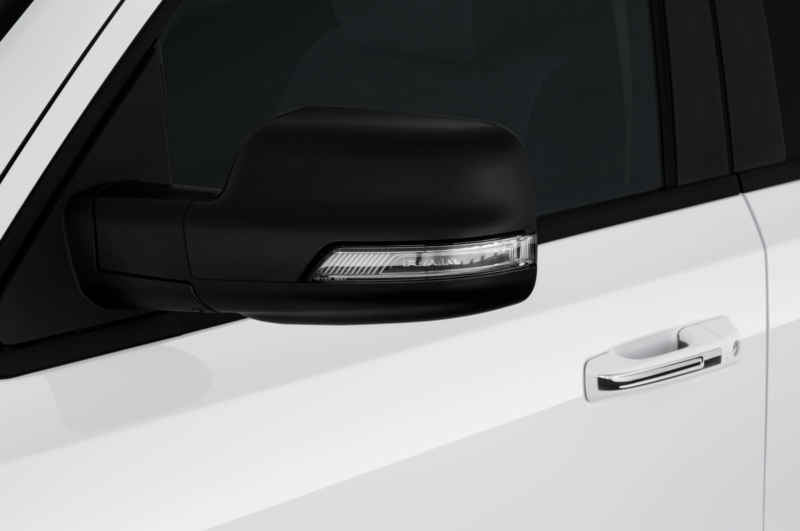 Ram engineers have moved the front anti-roll bar behind the front knuckle of the short-long arm suspension, for reduced roll stiffness and lighter weight. 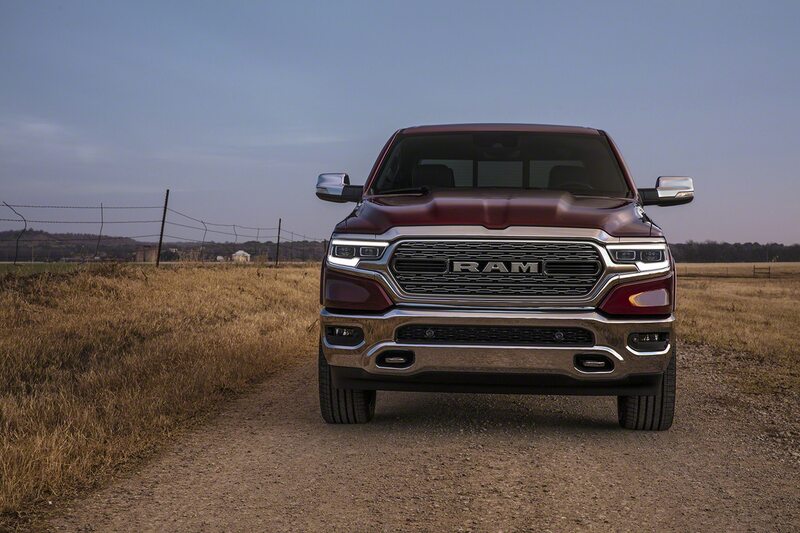 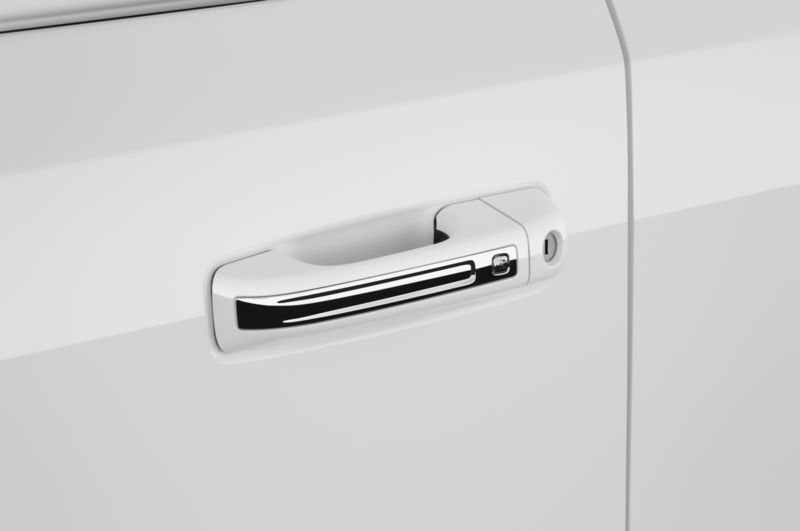 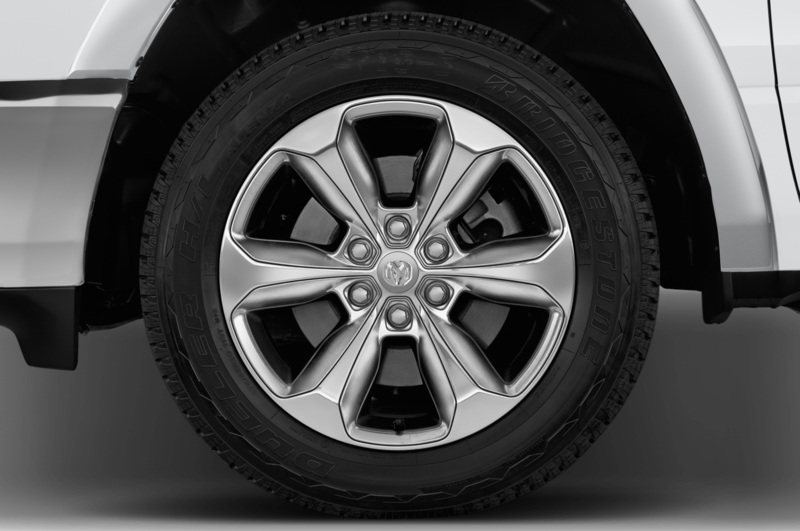 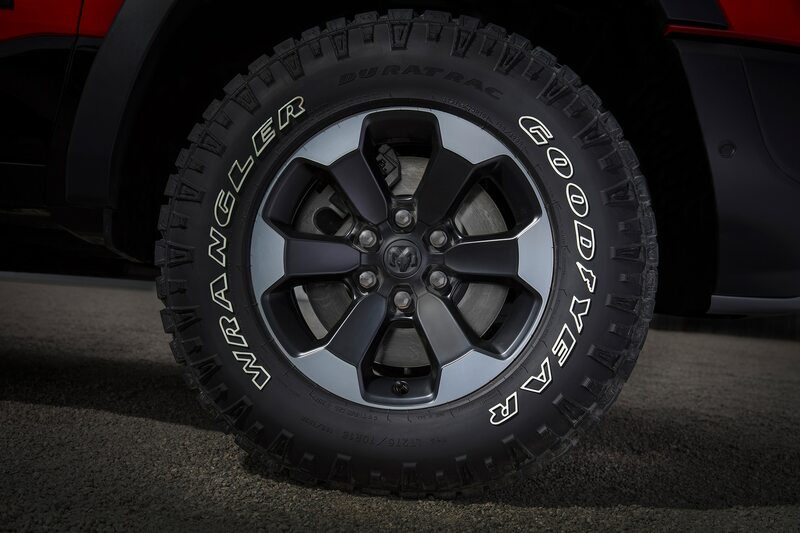 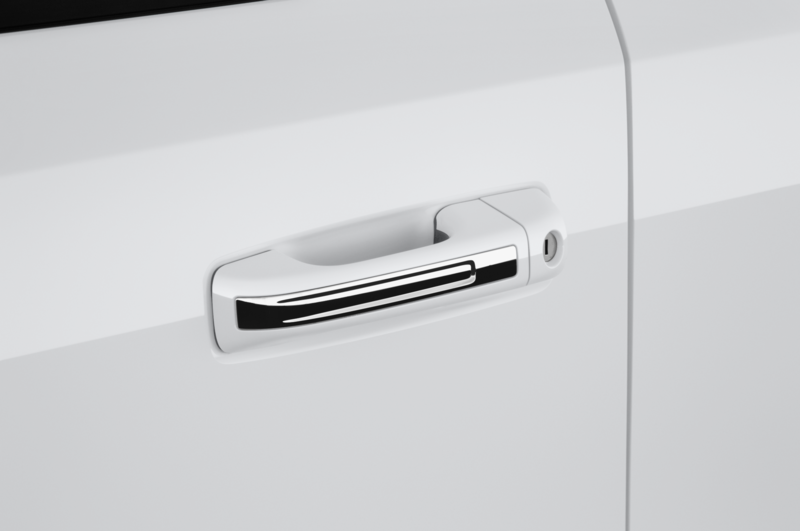 The front knuckles and control arms are all-aluminum, part of a mixed-materials strategy that includes 98-percent high strength steel in the frame. 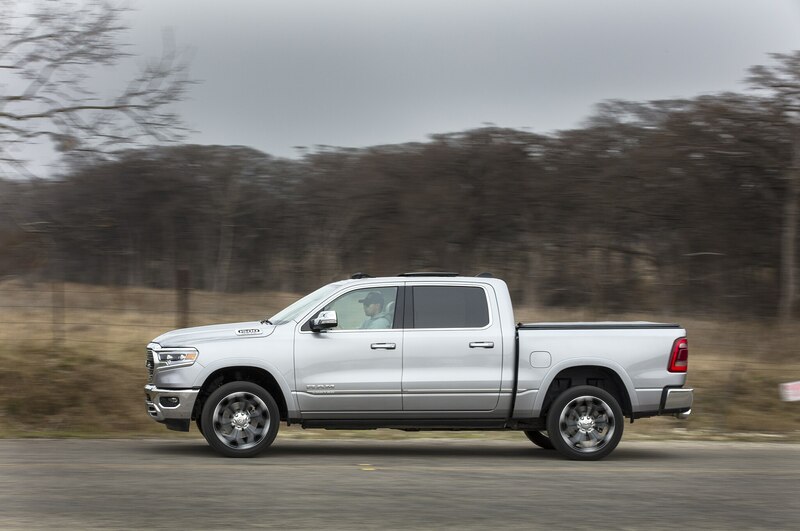 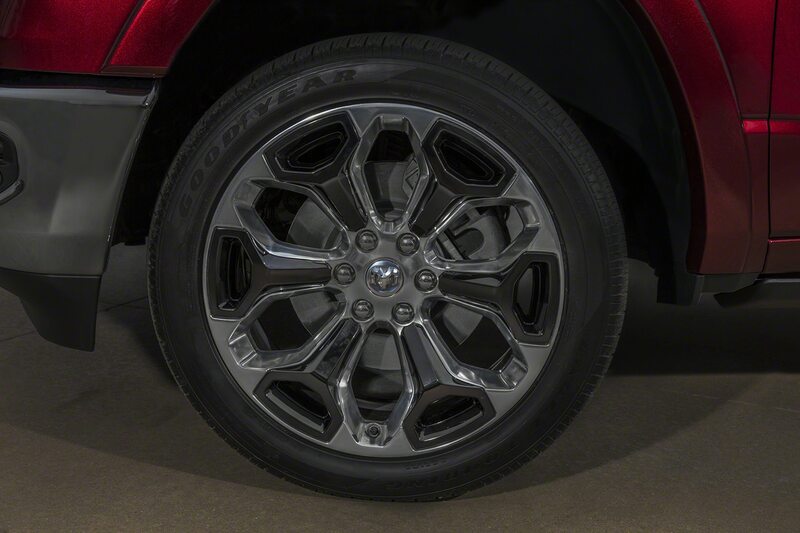 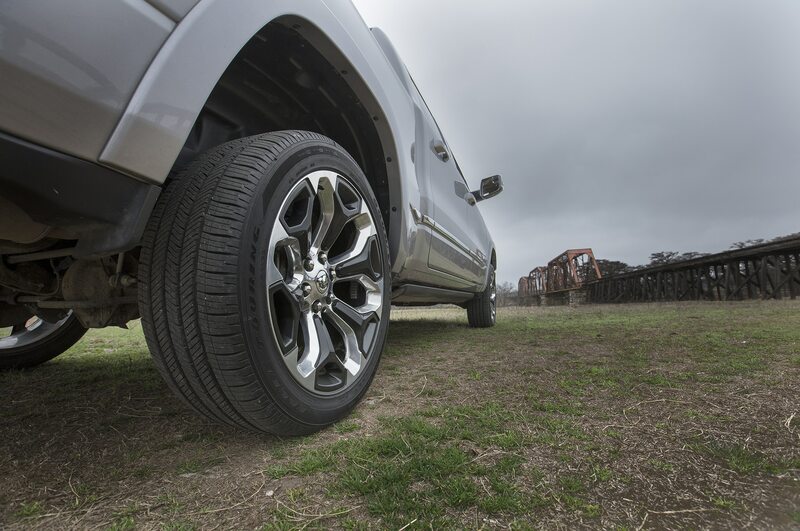 Twin-tube shocks are standard, and a five-mode air suspension is optional, with its aero-mode kicking in about 60-62 mph. 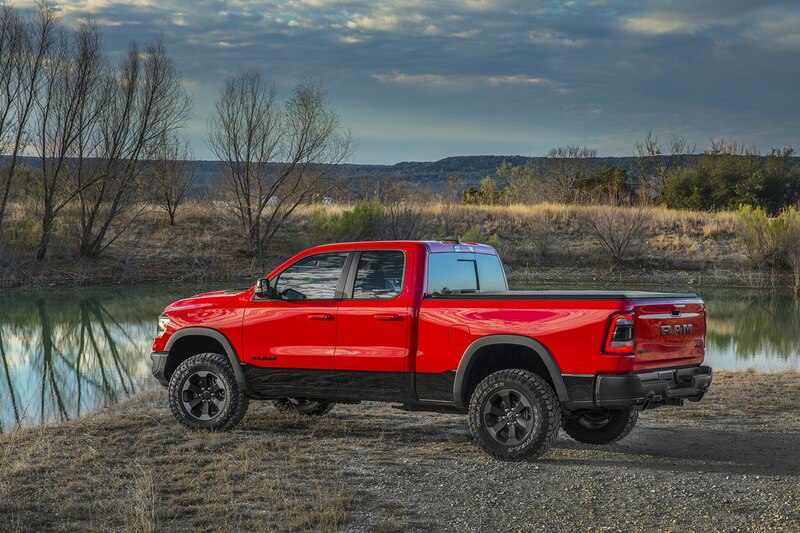 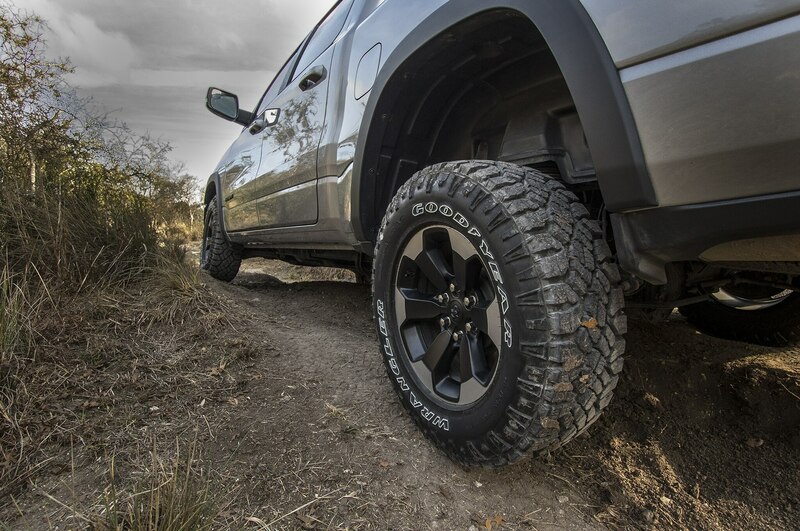 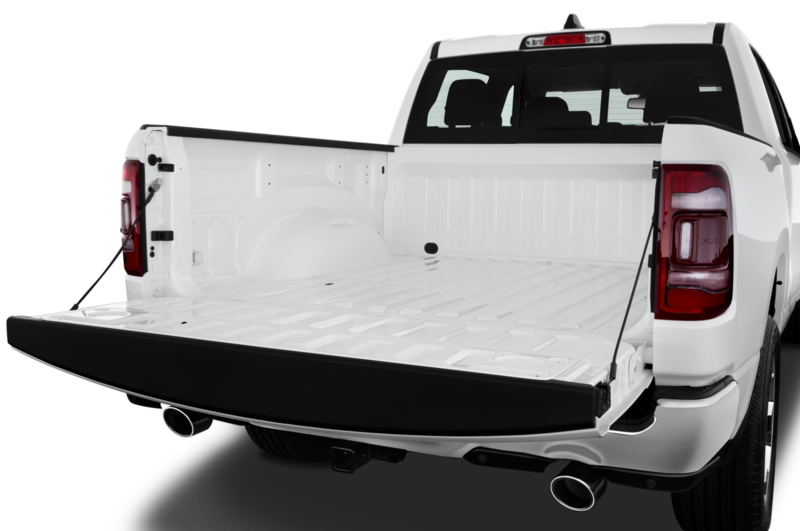 Overall, the truck has 28 times more high strength steel than the old, or Classic 1500, with weight reduction of up to 250 pounds, of which 100 pounds is a body-in-white diet. 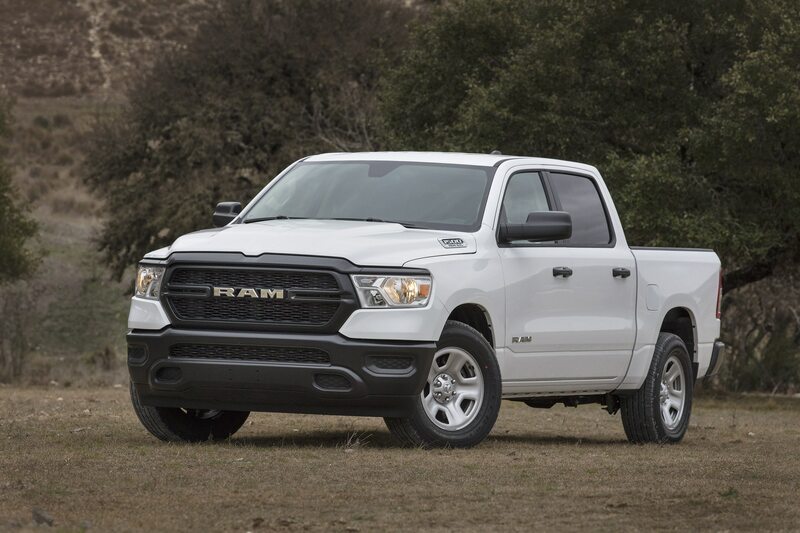 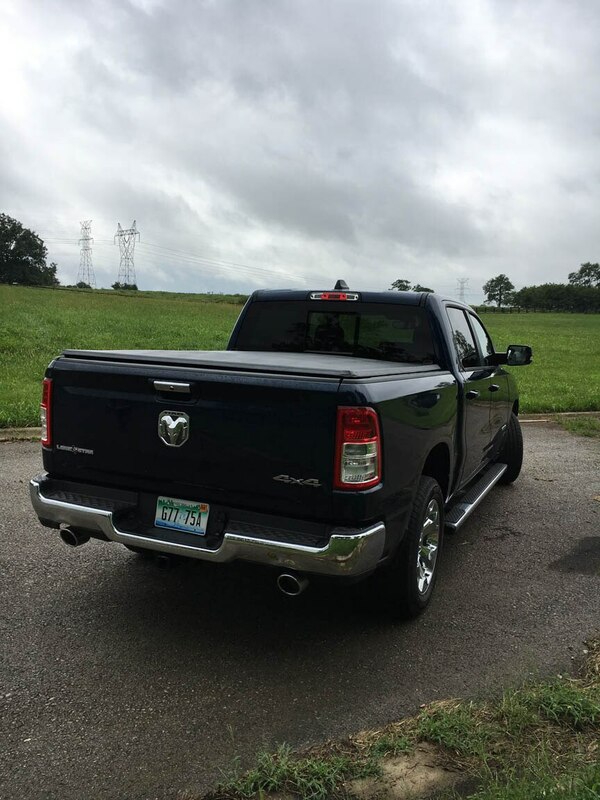 We had a short drive of a ’19 Ram 1500 4WD with the eTorque V-6, and while it’s clearly less powerful and torquey than the eTorque V-8, it’s plenty quick for pickup buyers who want a good work truck and also want to save gas. 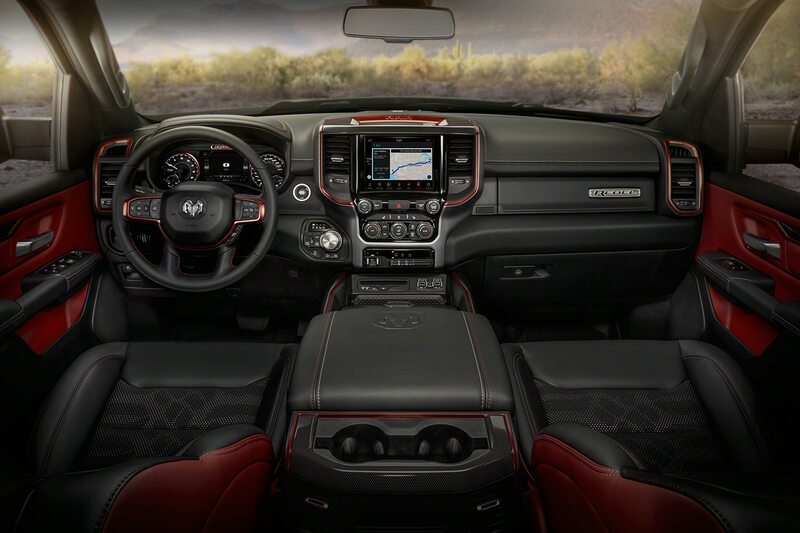 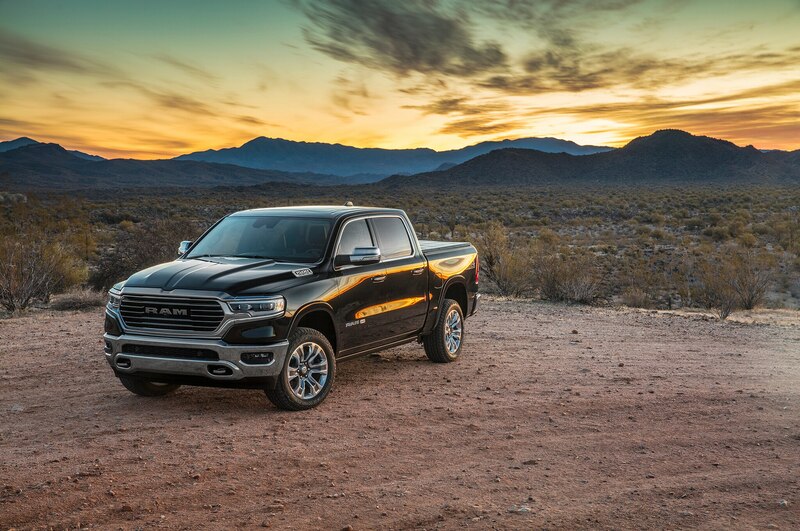 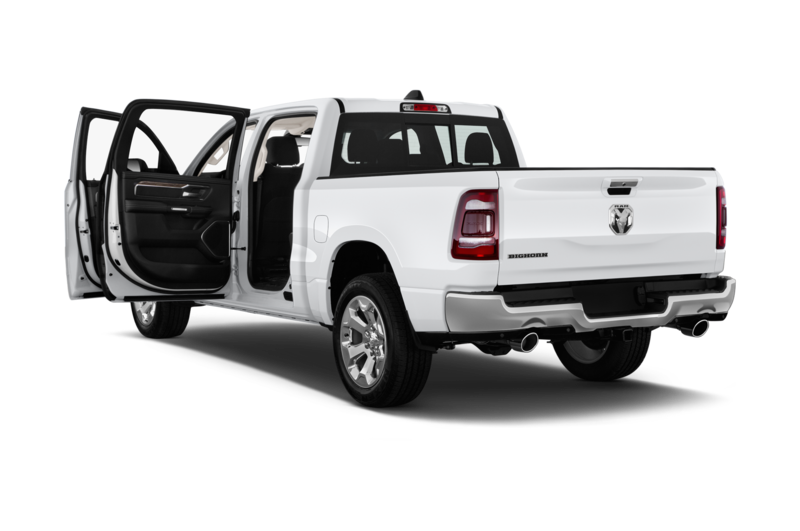 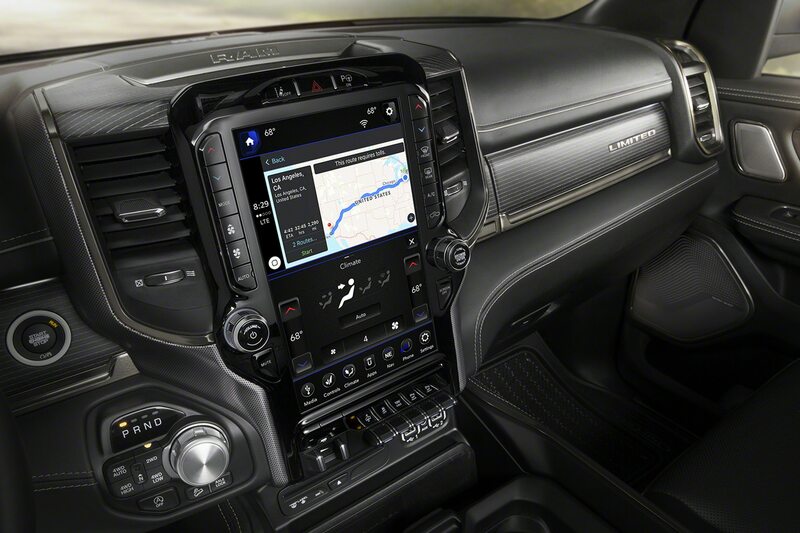 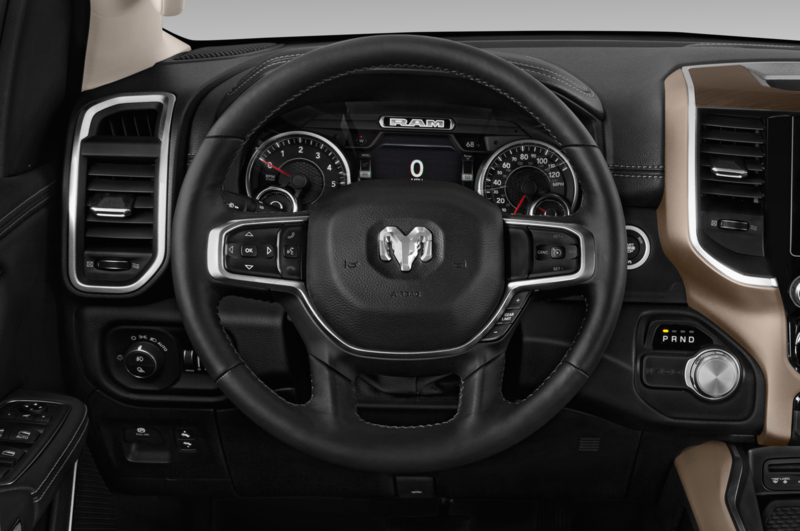 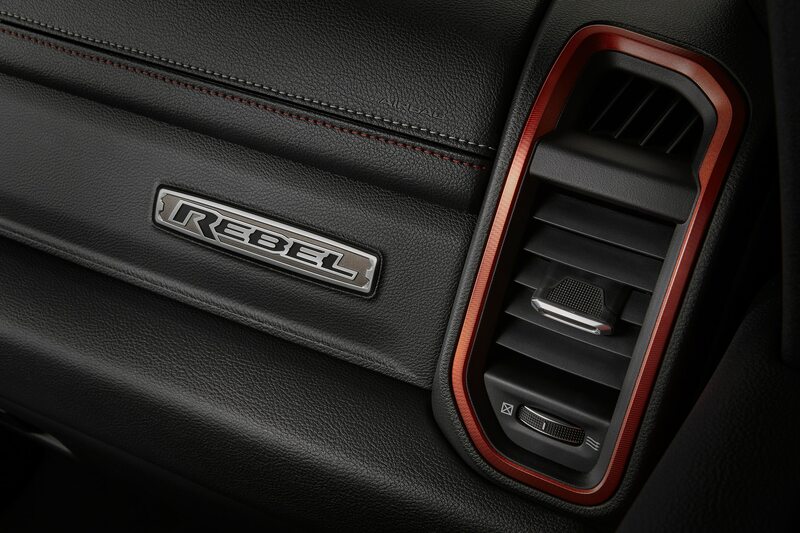 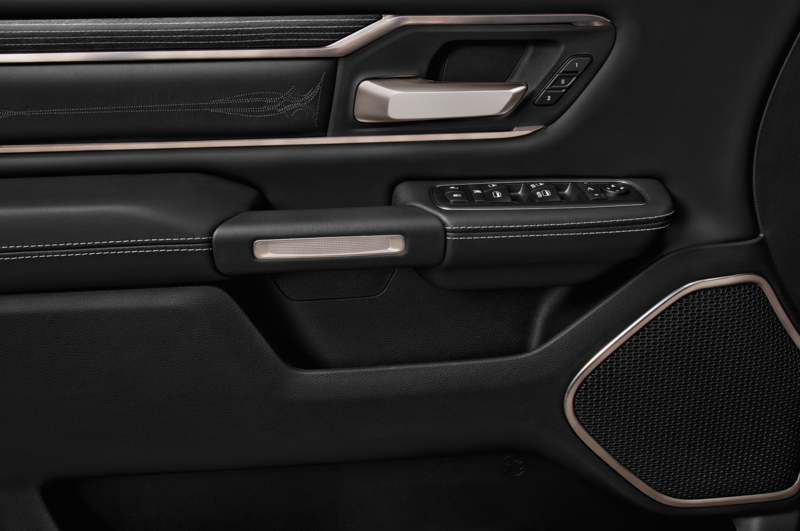 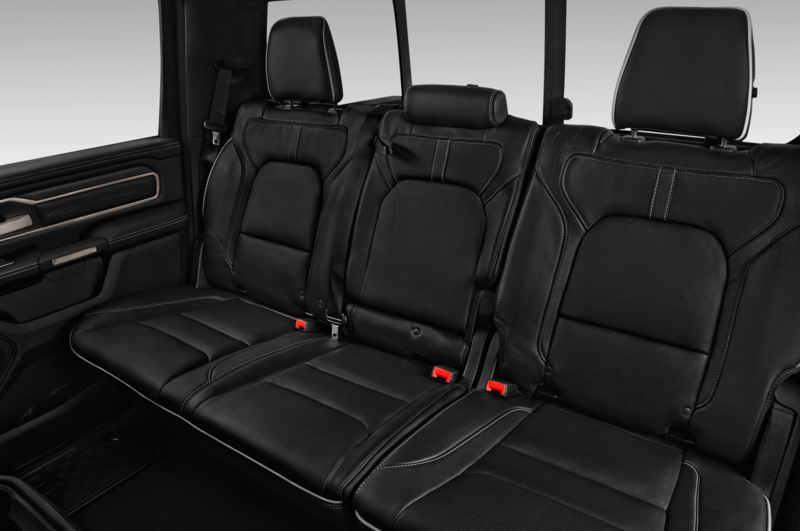 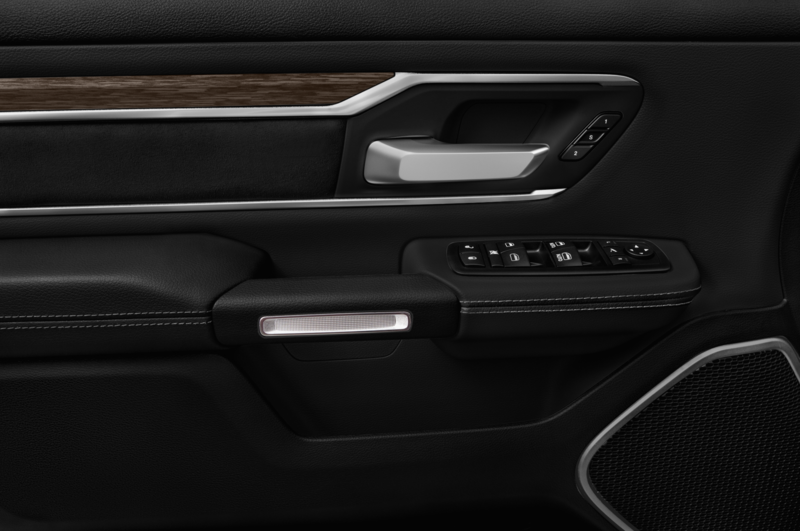 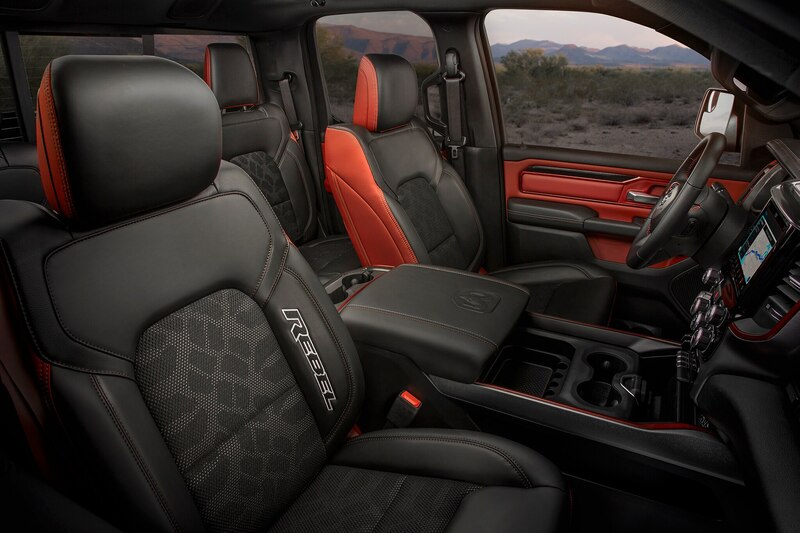 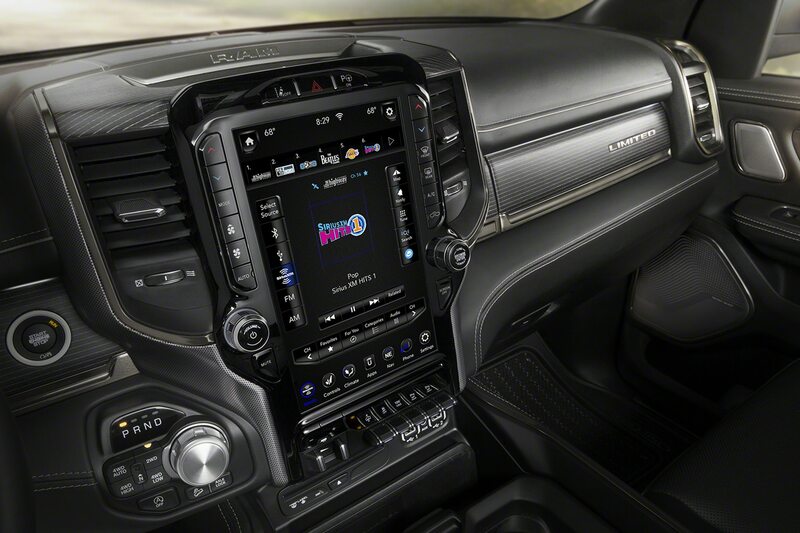 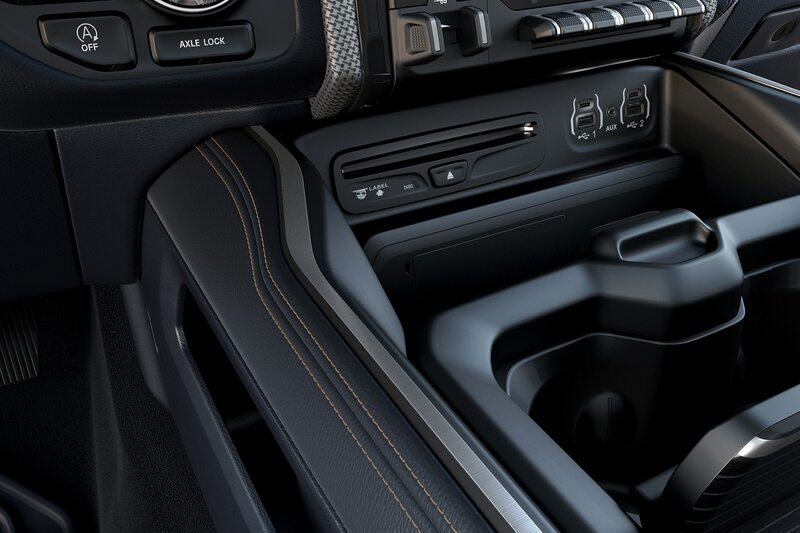 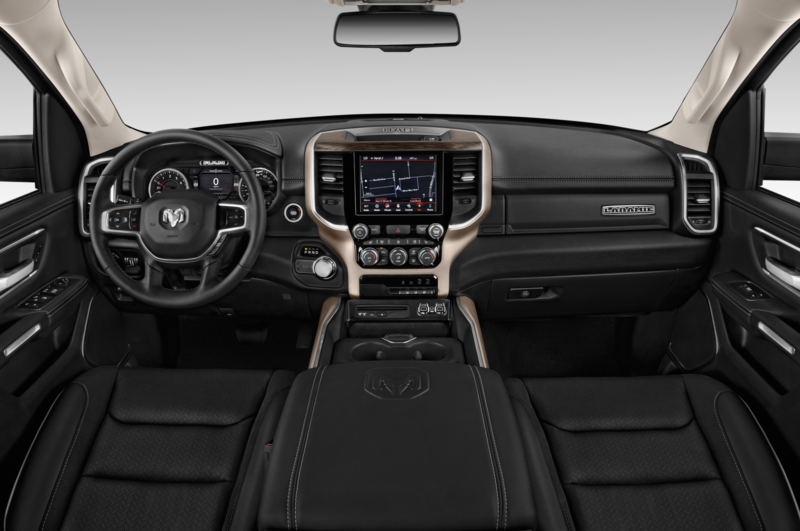 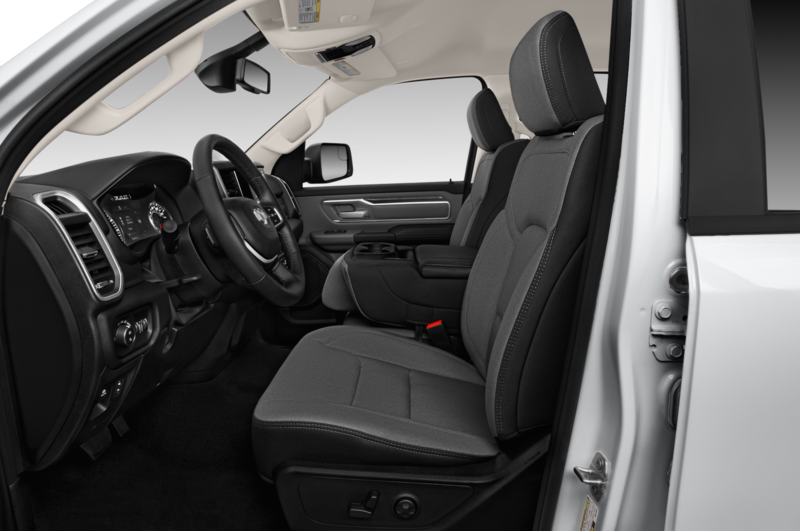 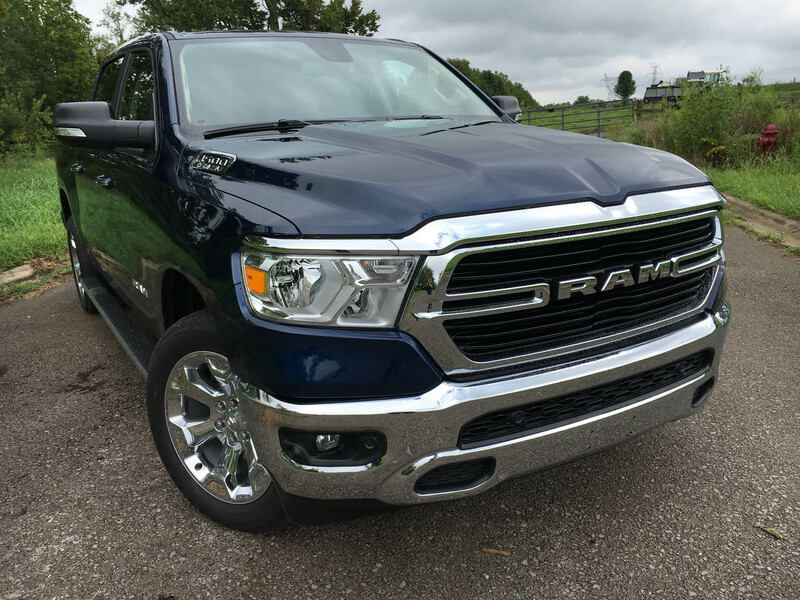 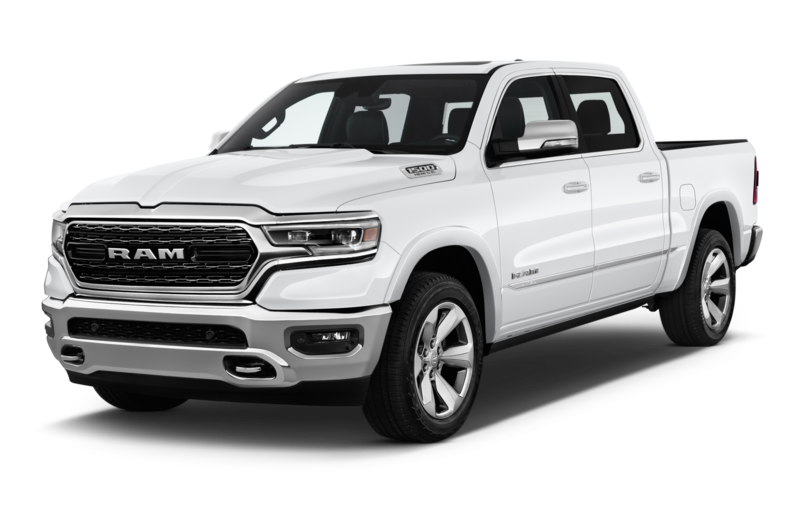 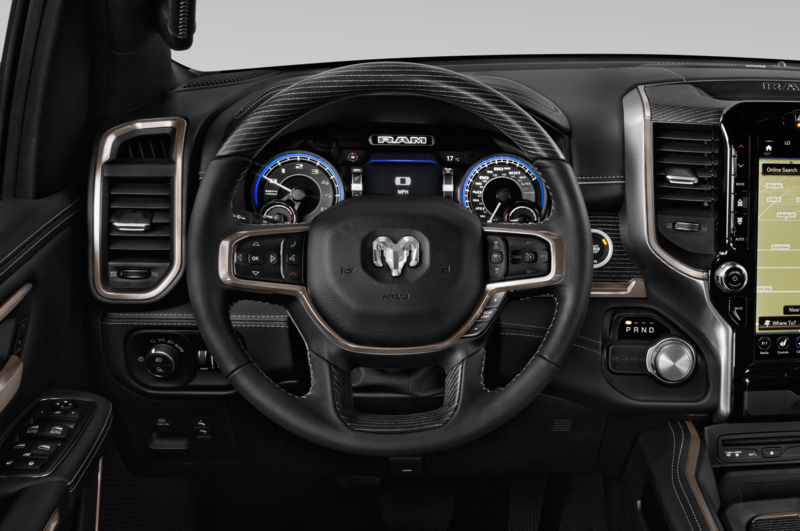 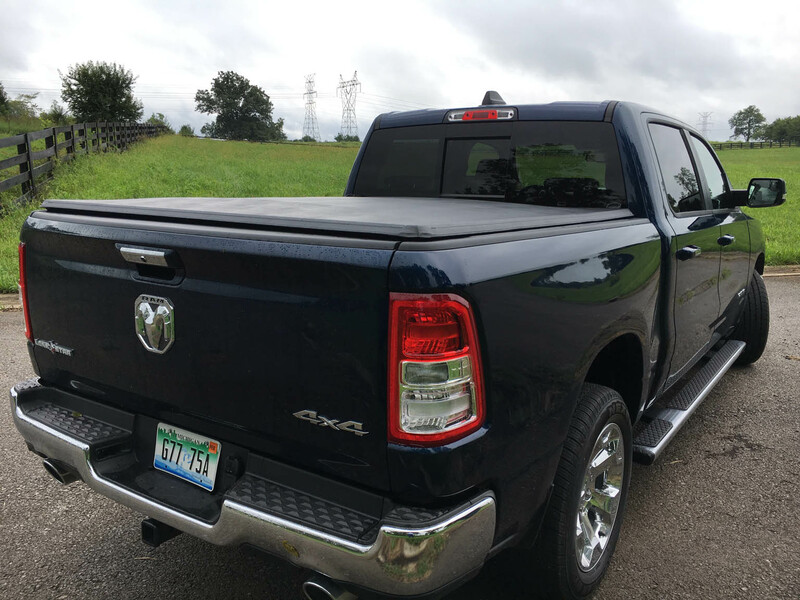 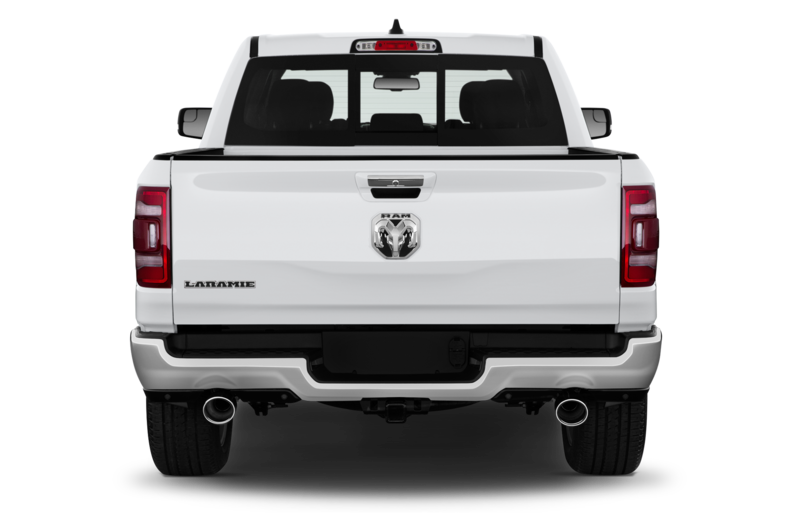 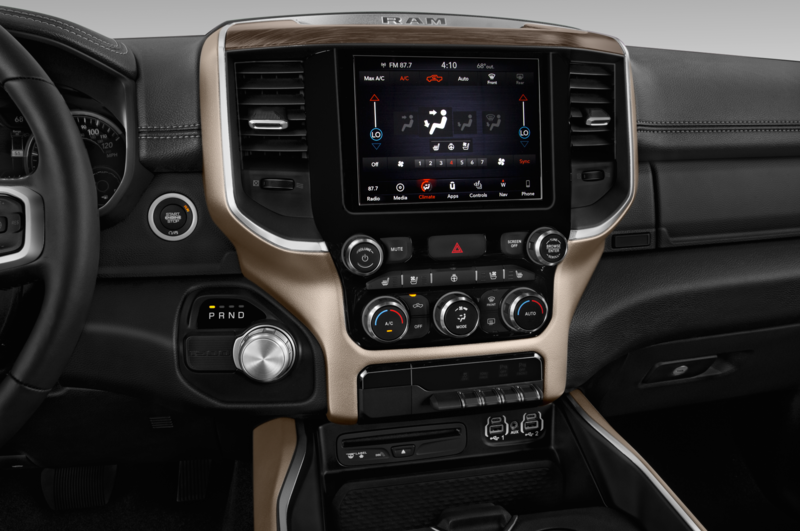 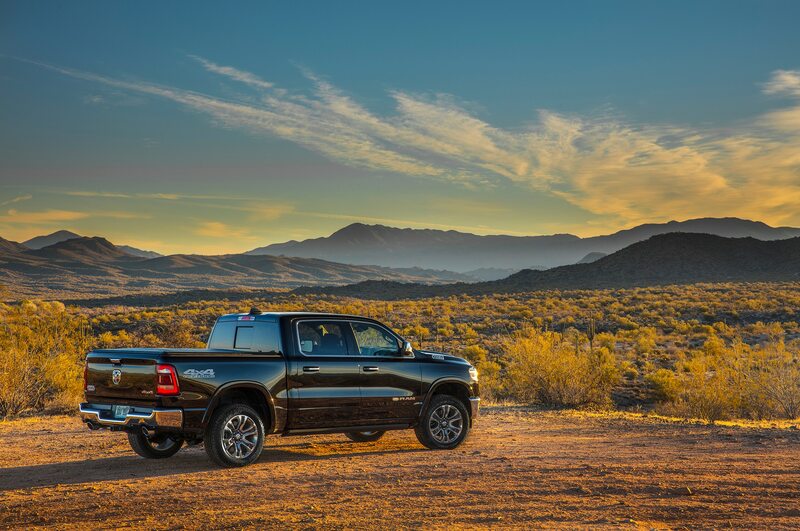 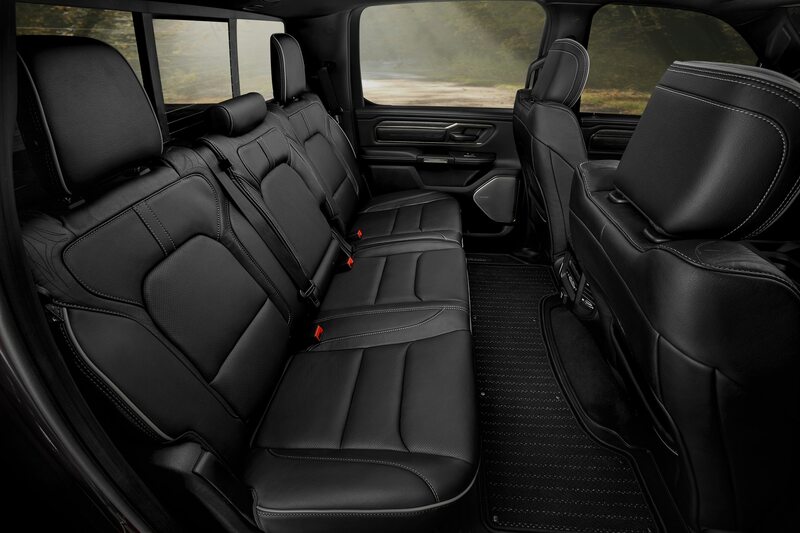 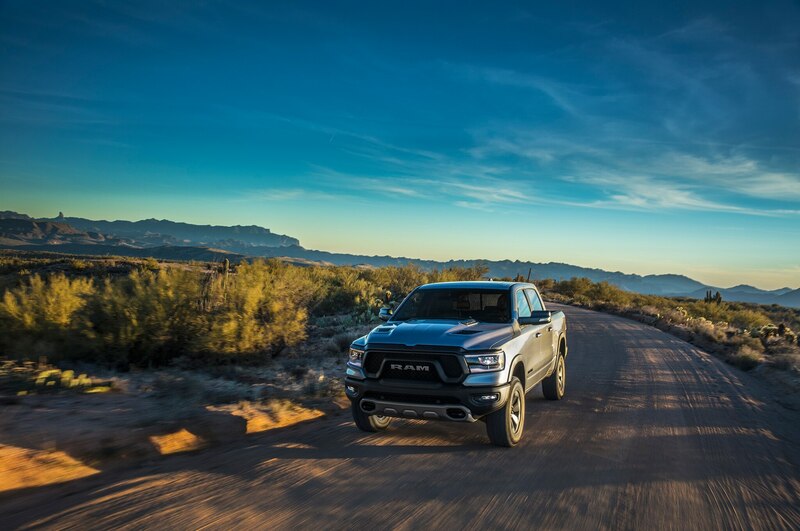 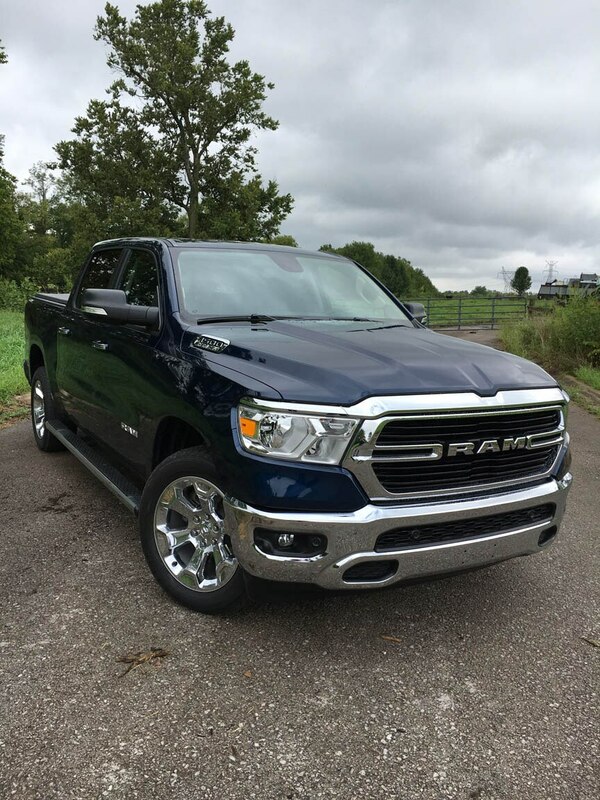 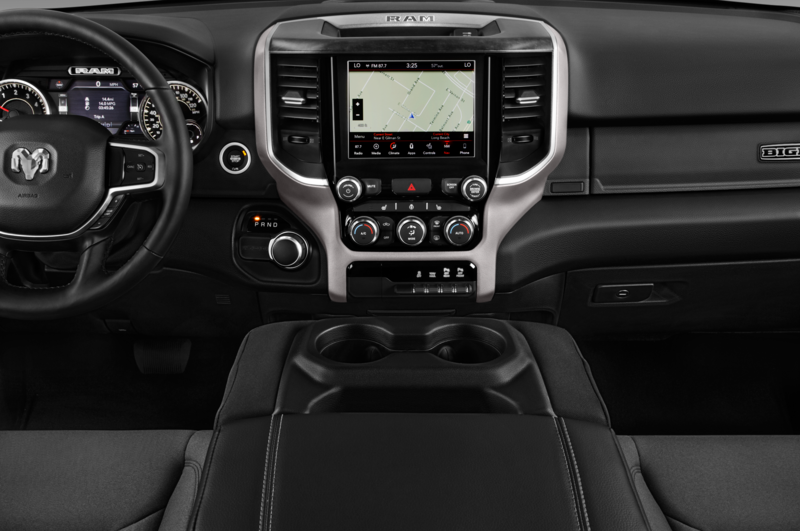 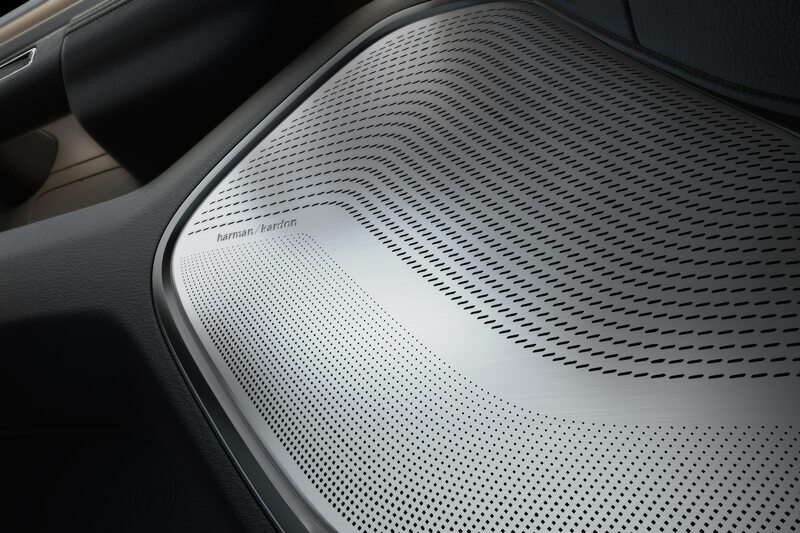 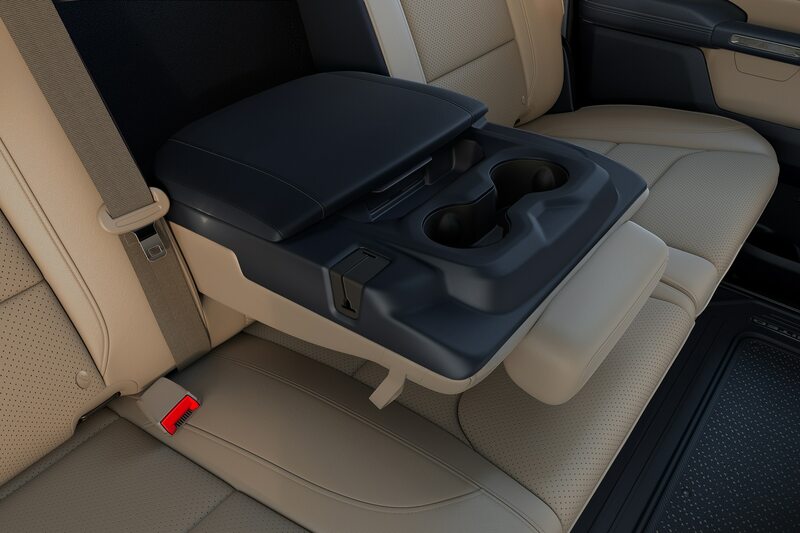 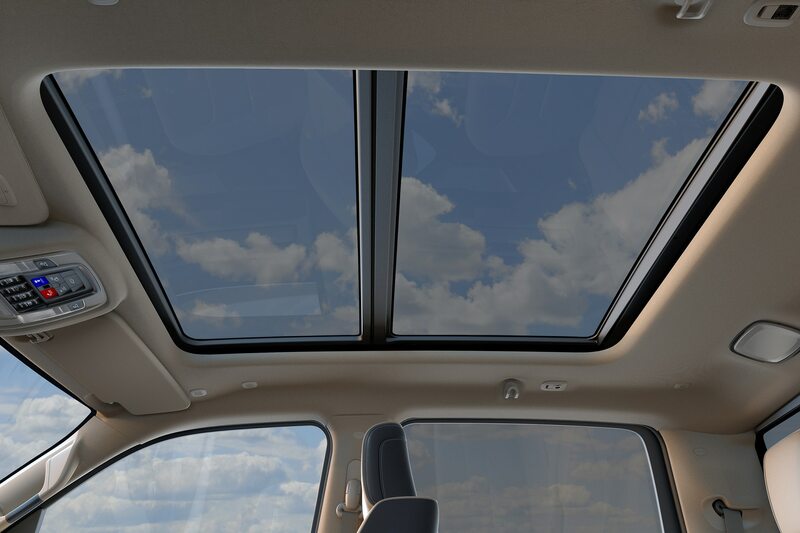 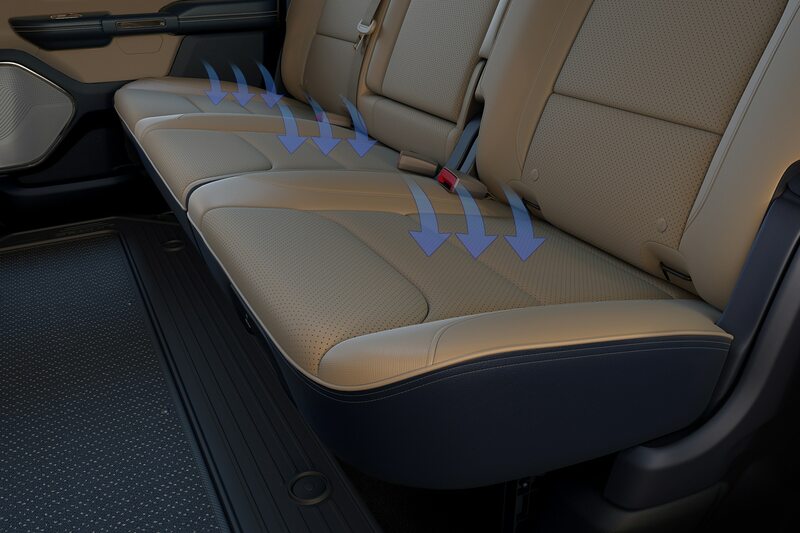 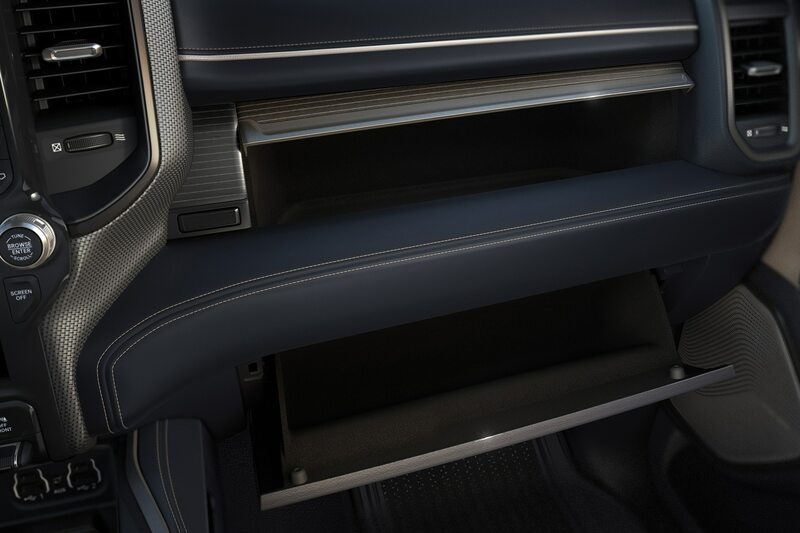 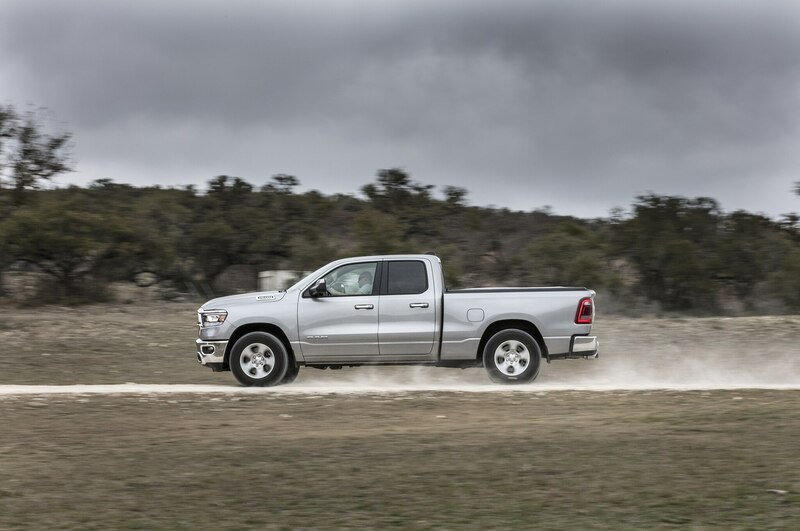 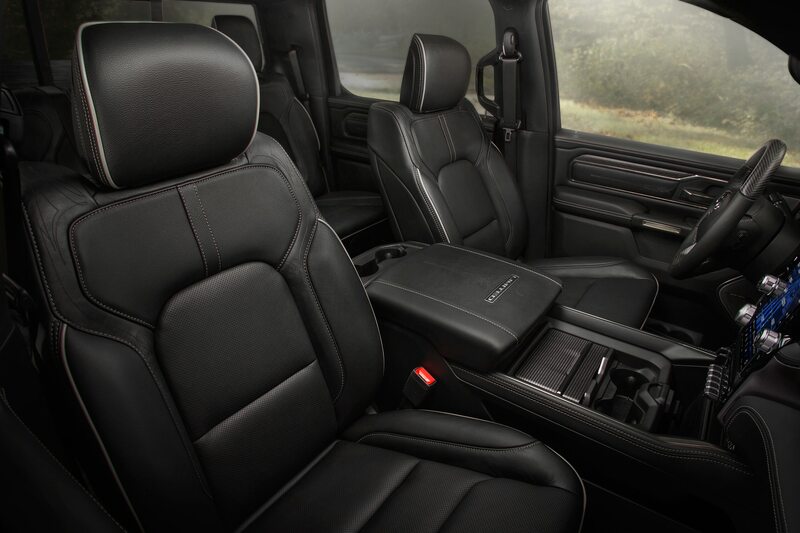 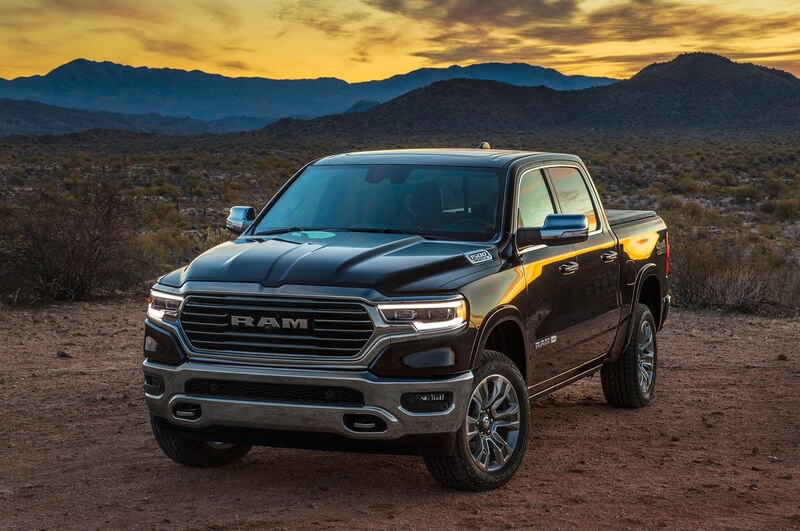 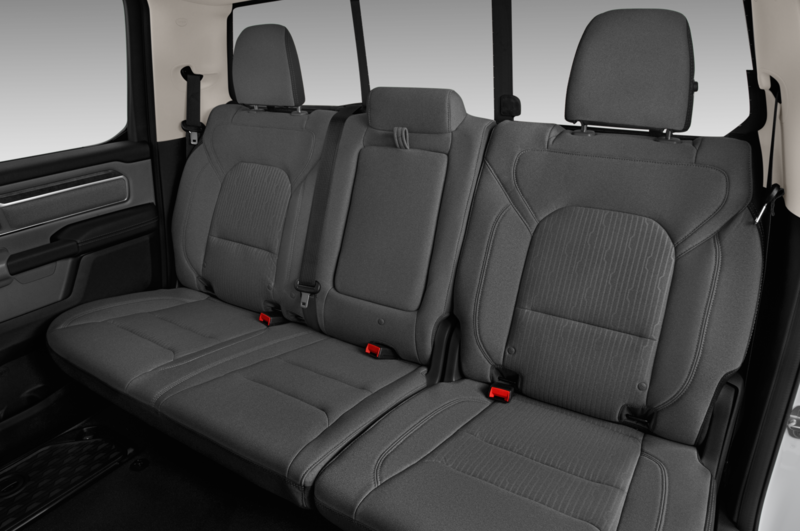 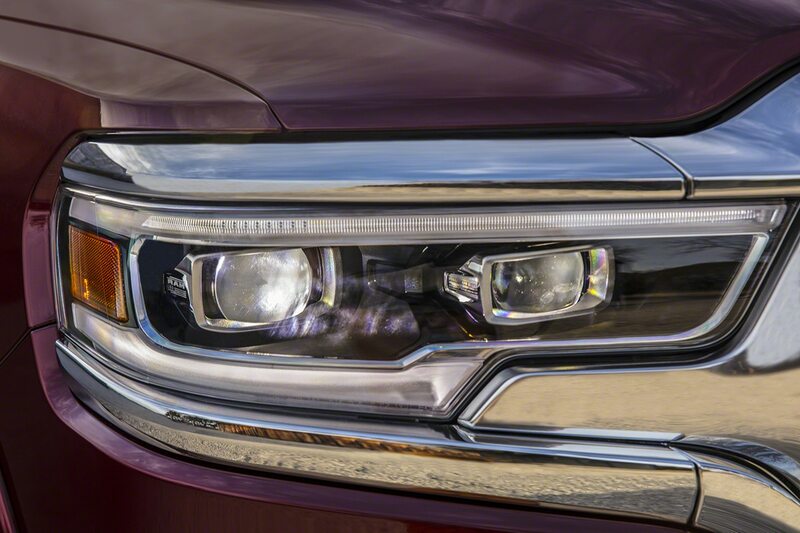 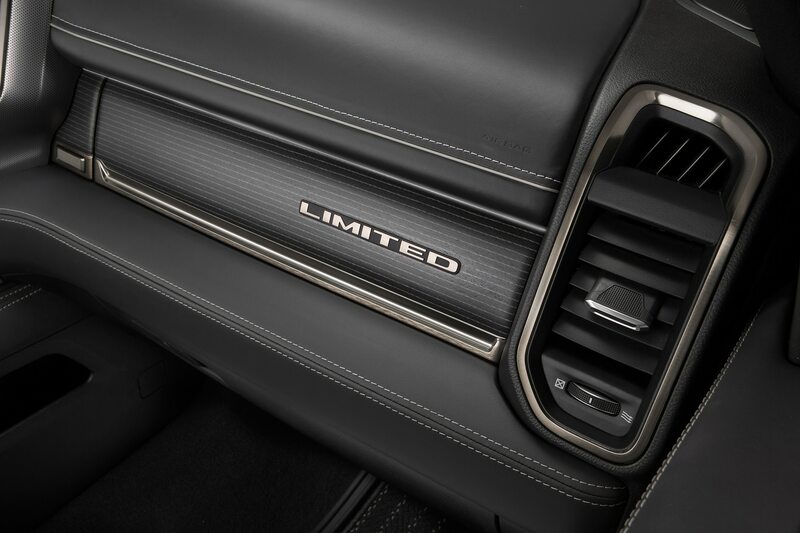 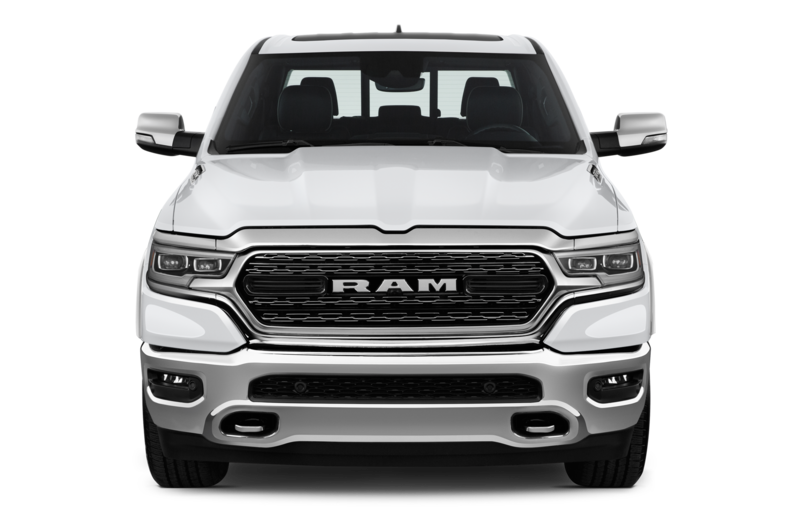 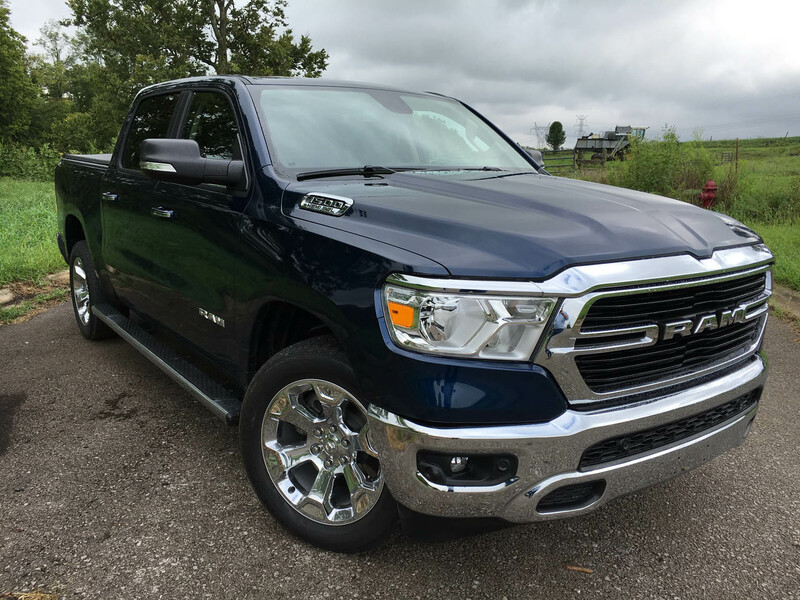 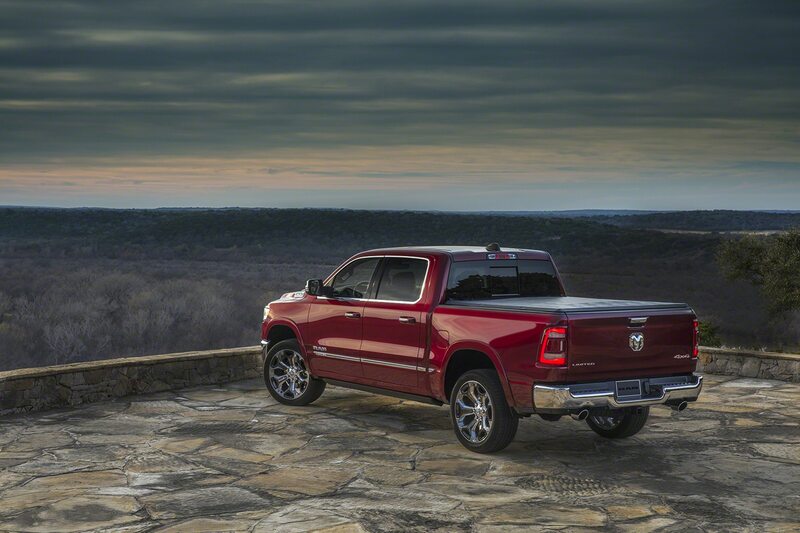 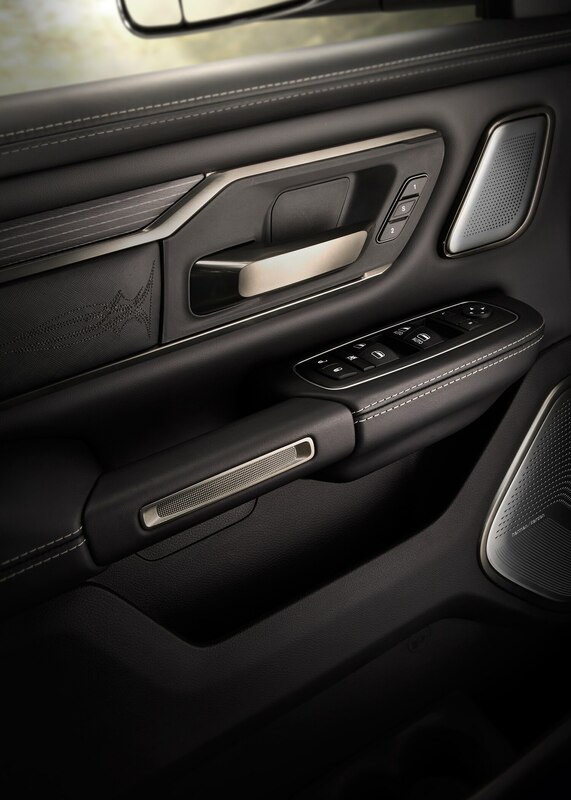 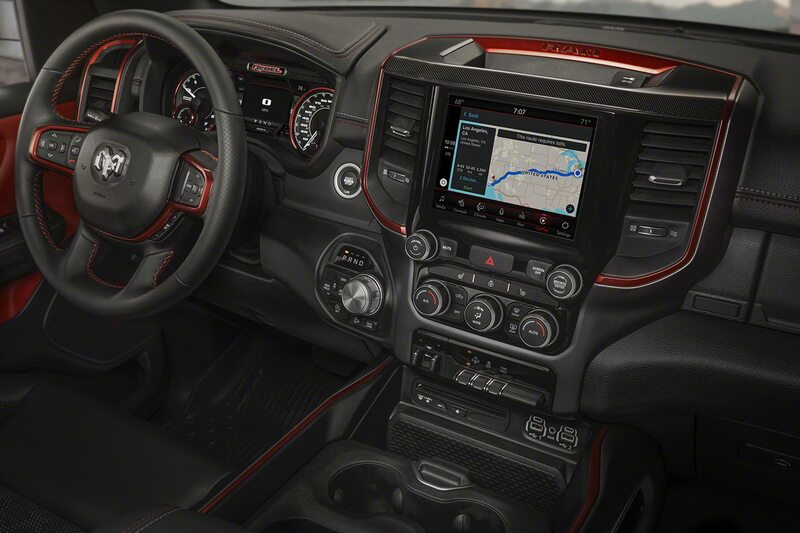 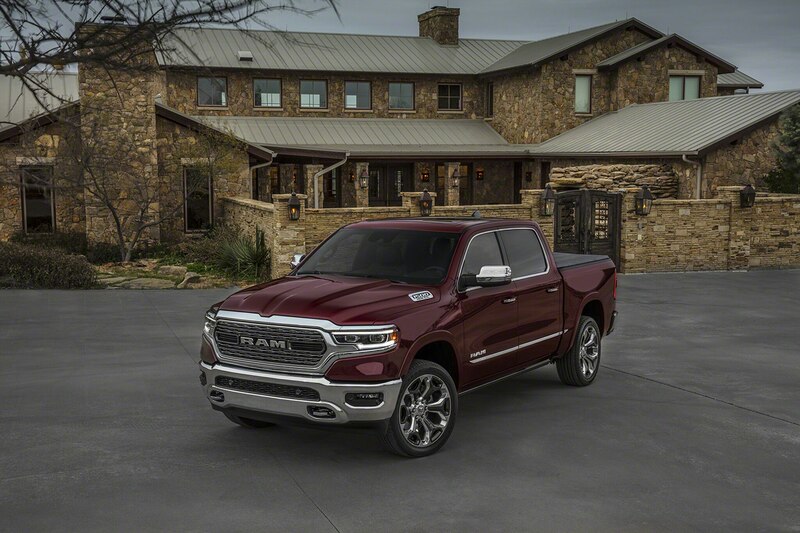 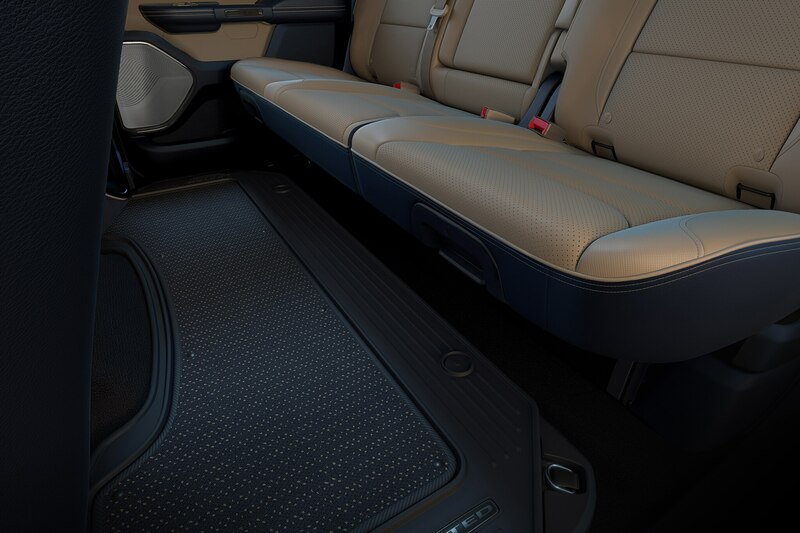 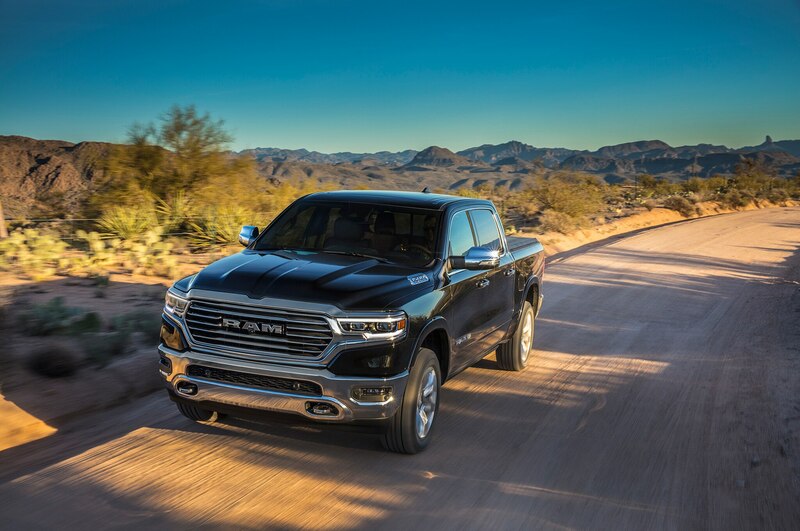 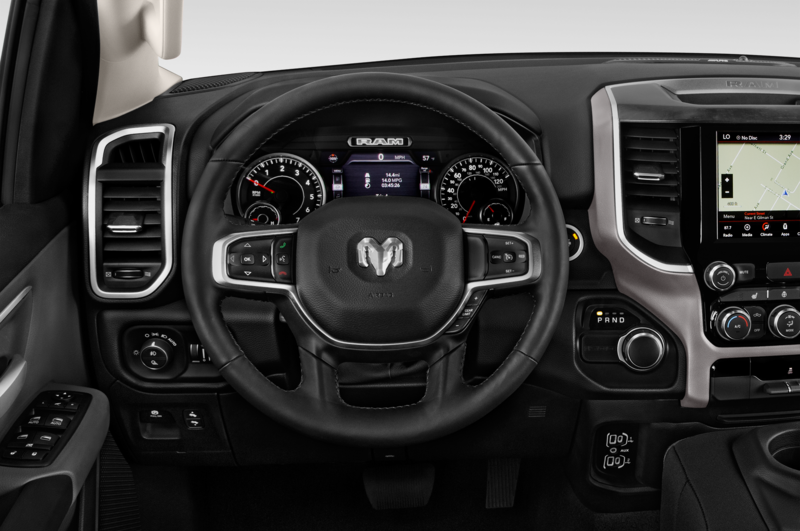 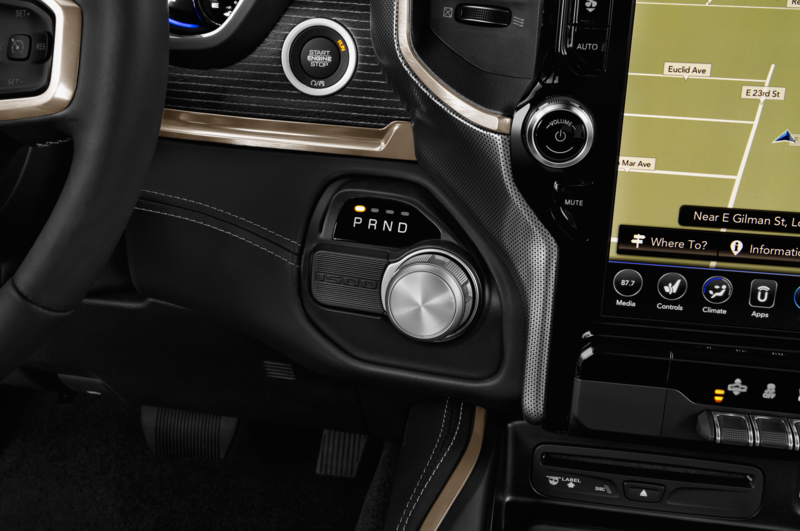 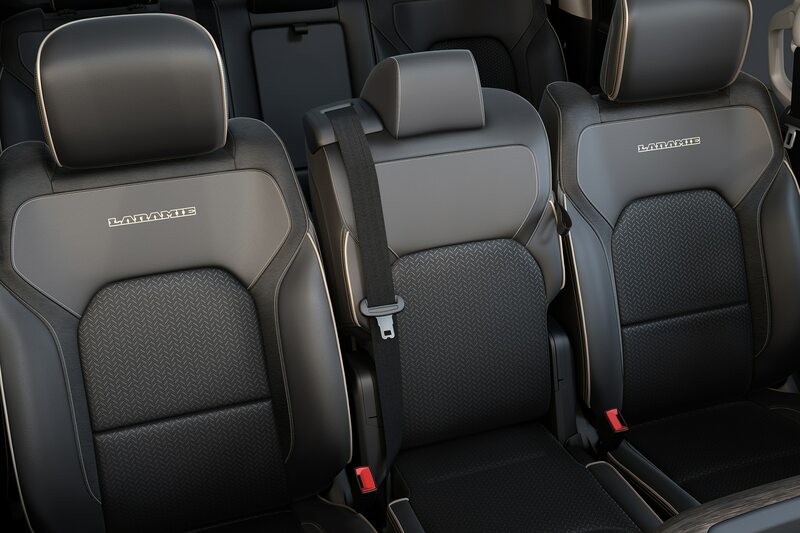 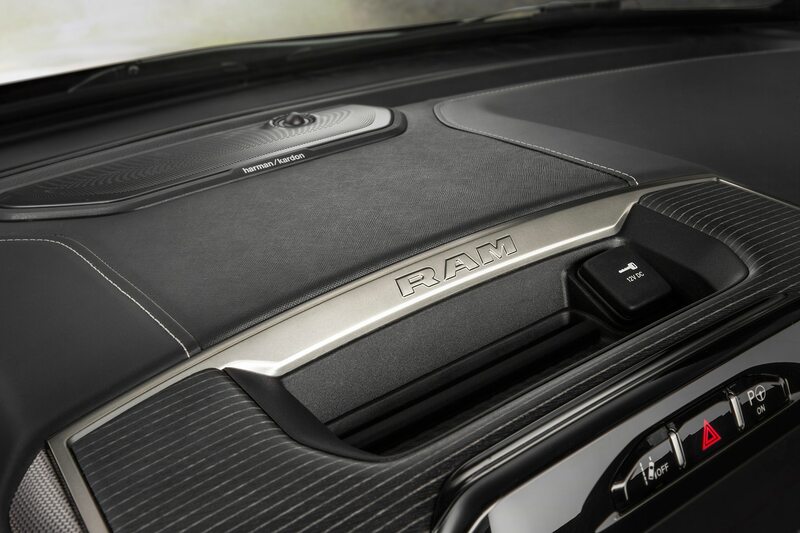 The 2019 Ram 1500s with the eTorque engines are potentially best-in-class in many ways, including handsome interiors with good materials and fit-and-finish, whether in mid-spec Big Horn and Lone Star trim or full hat-and-cattle Longhorn trim. 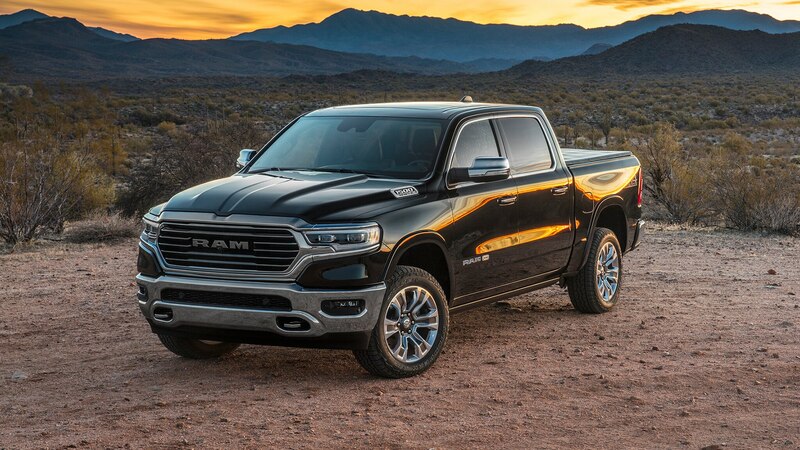 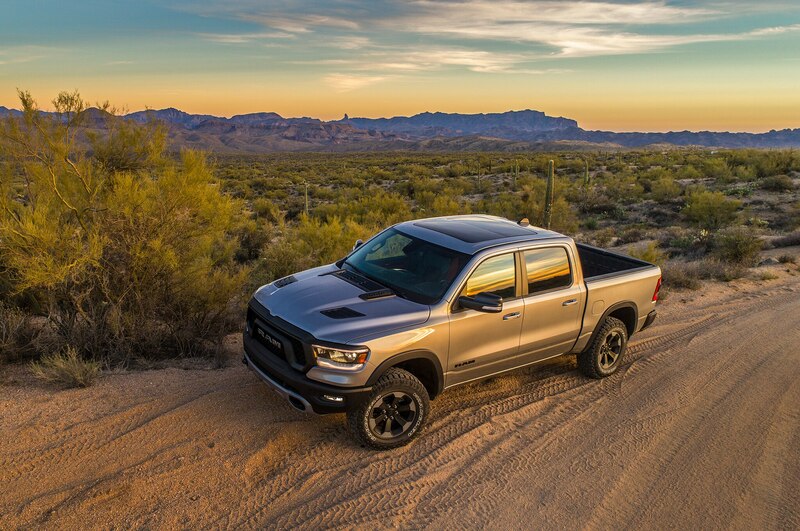 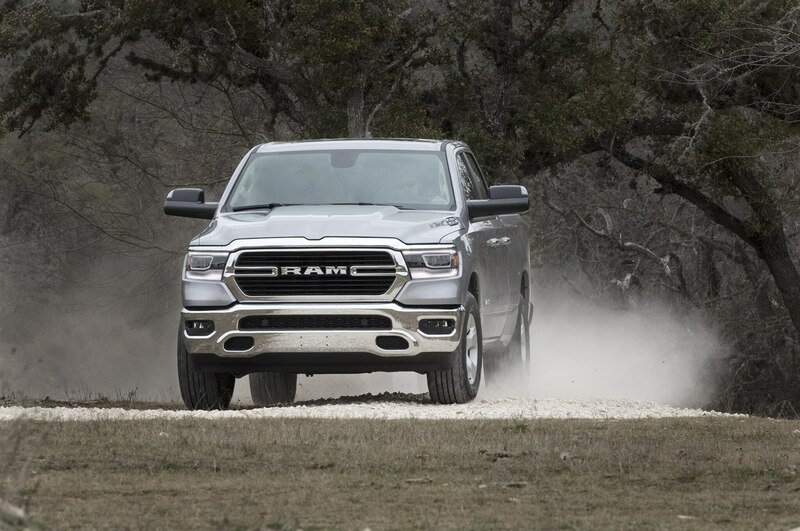 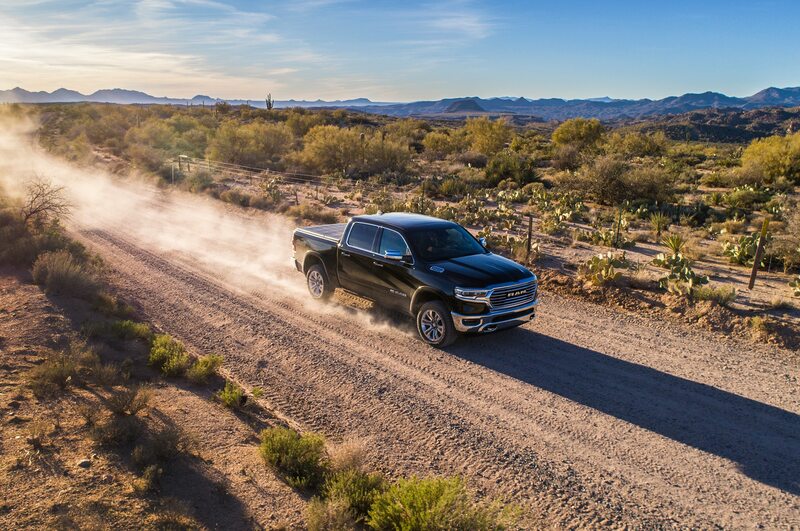 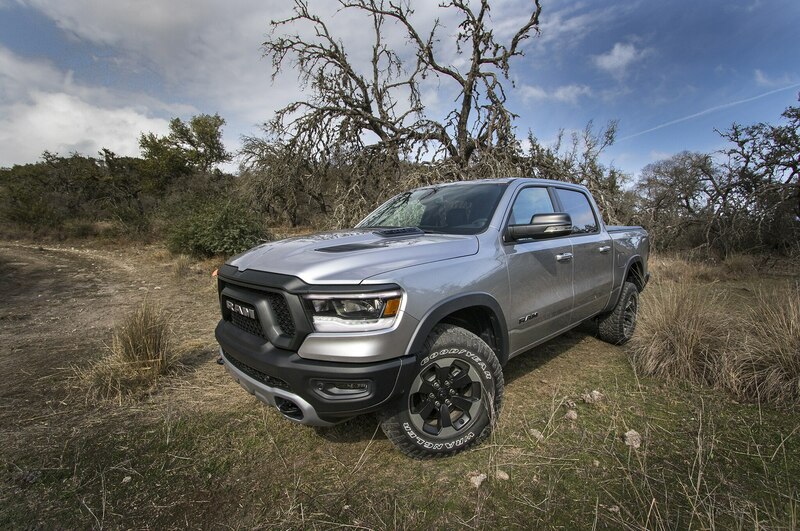 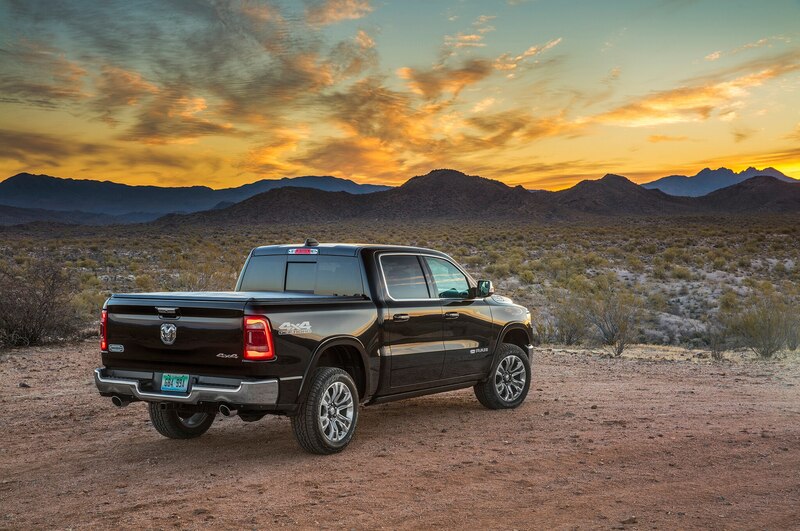 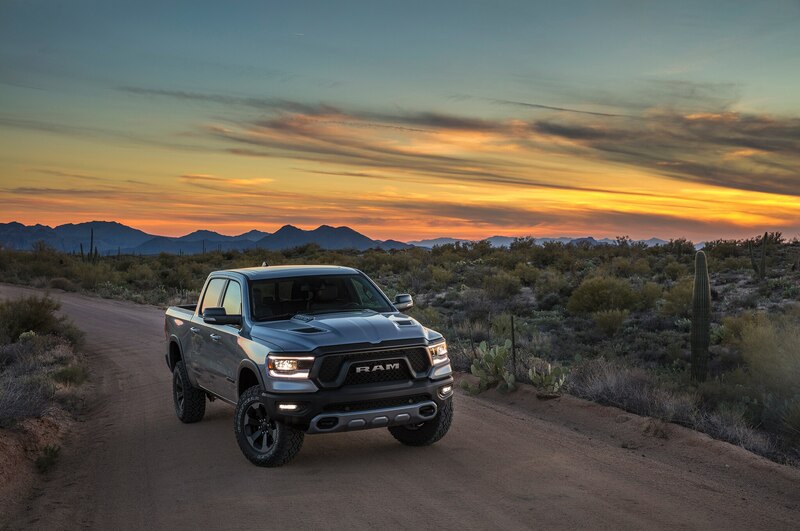 The cutting edge eTorque engines should satisfy every sort of Ram pickup buyer, though if you can’t live without that good old fashioned rattle and smoke, rest assured that the diesel option is on the way.